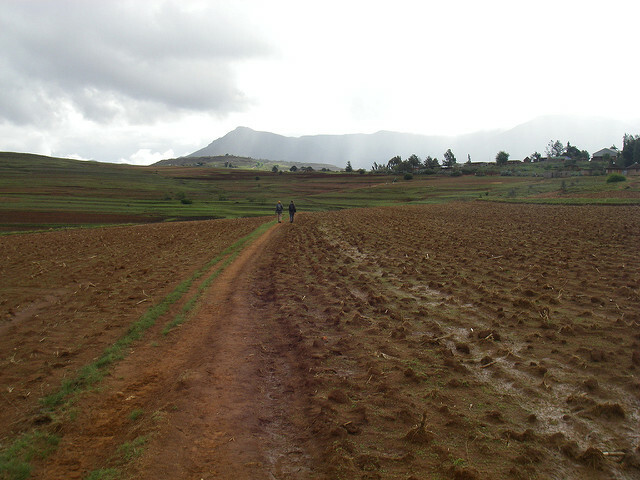 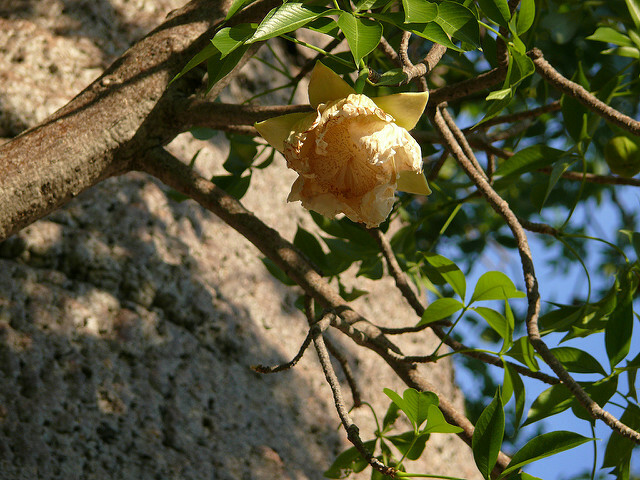 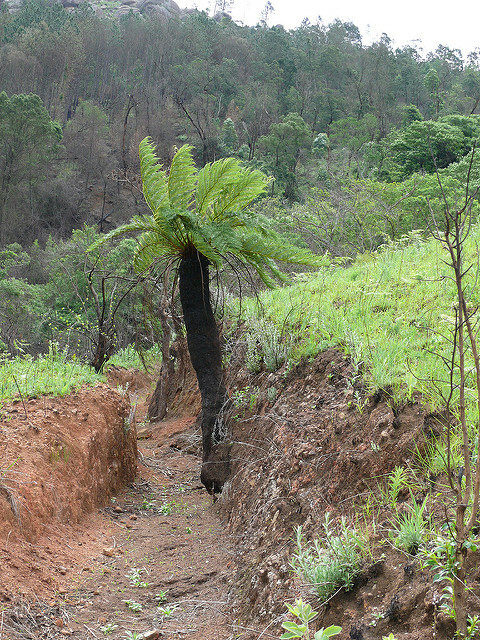 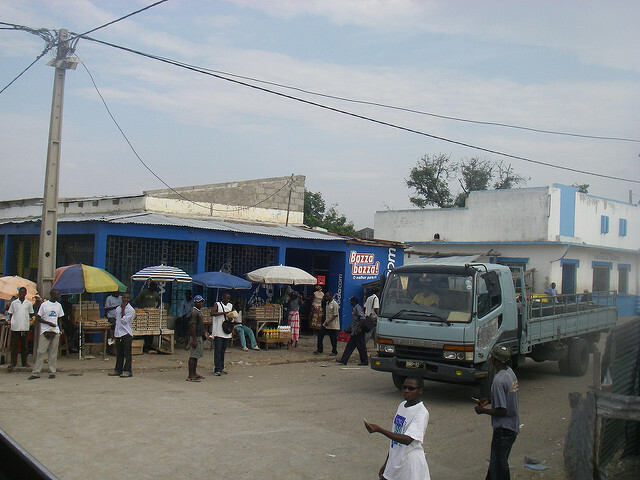 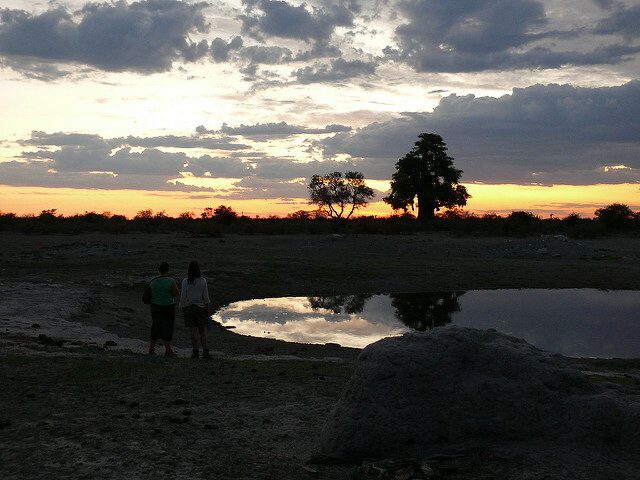 For the original Flikr page please link to Southern Africa 2007. 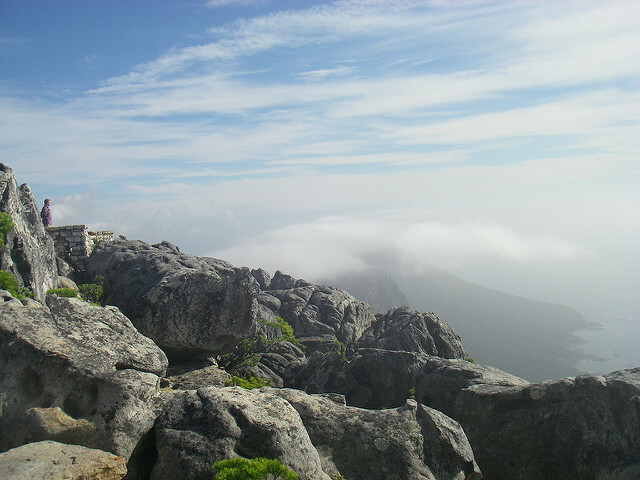 There was not very much time in Cape Town but a visit was made to Table Mountain and the Waterfront. 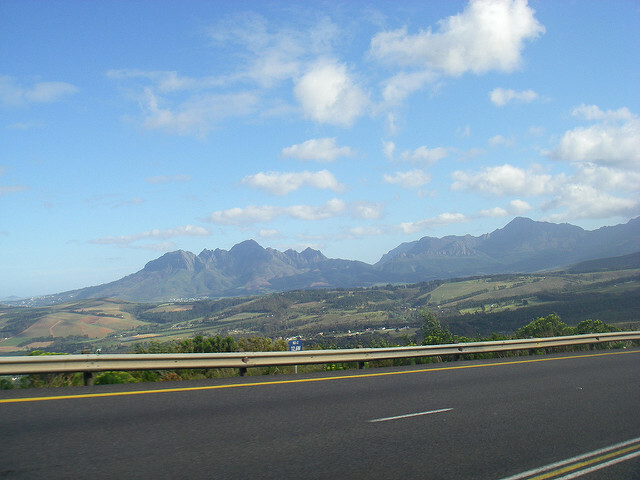 Our route took us to Stellenbosch the wine capital of South Africa before traveling up the Garden Route as far as George where we turned inland to Oudtshoorn where we visited an Ostrich farm before camping near to the Cango Caves where some of us took the adventure route where we had to crawl through a 'letter box' and up a 'chimney'. 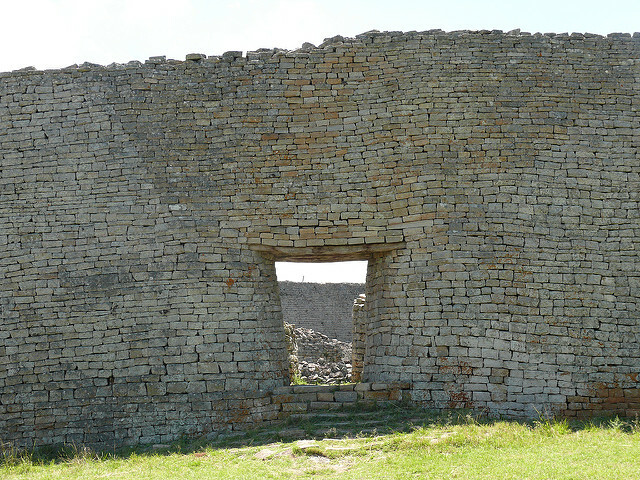 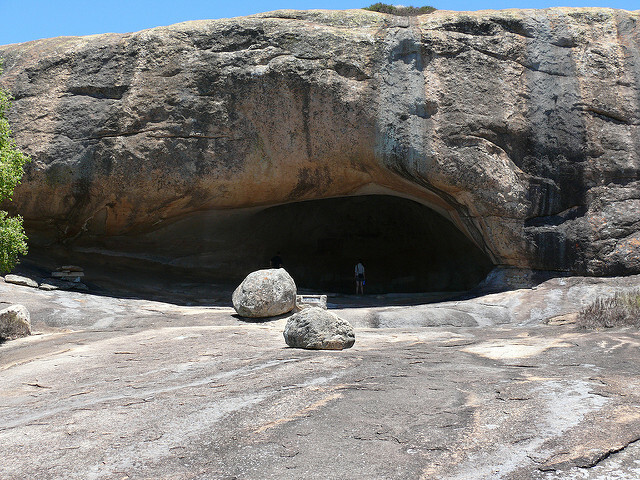 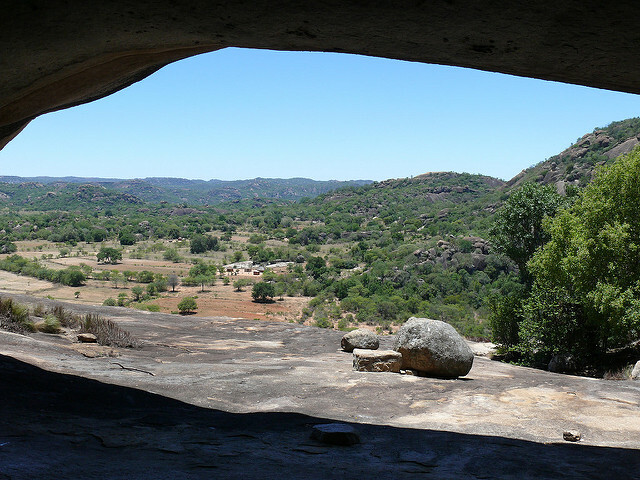 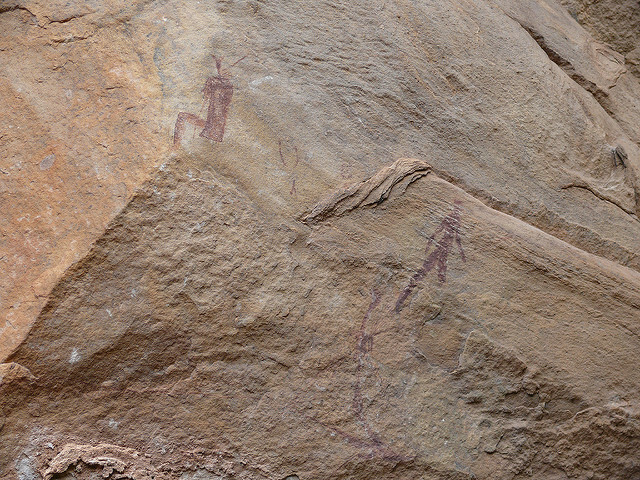 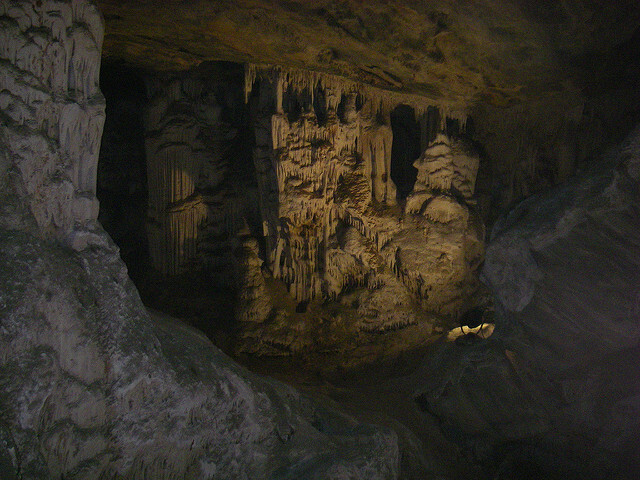 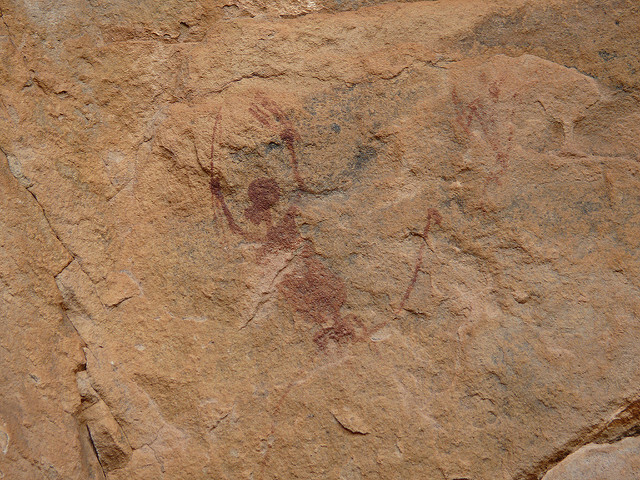 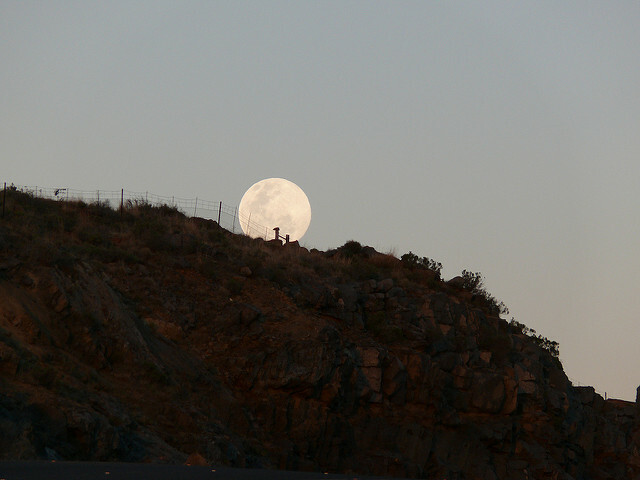 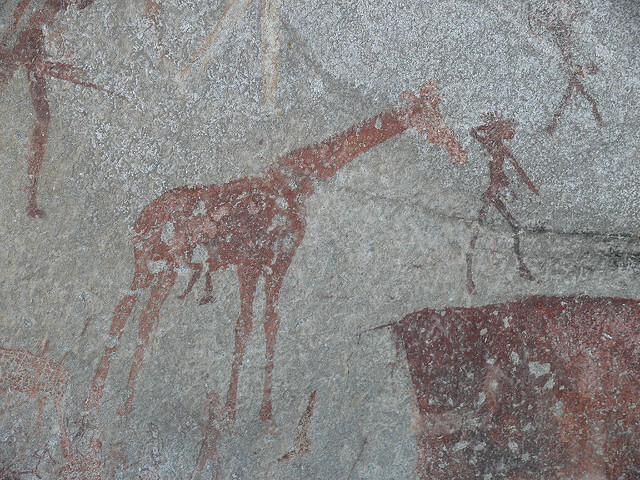 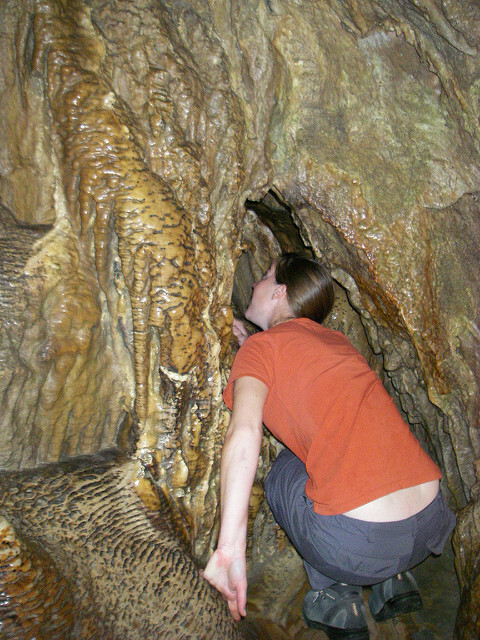 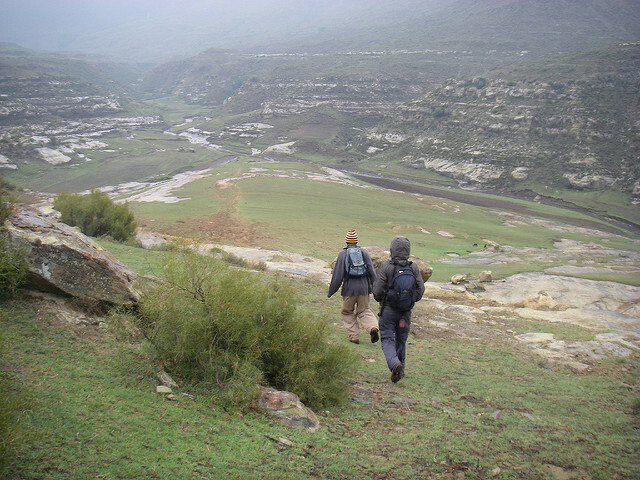 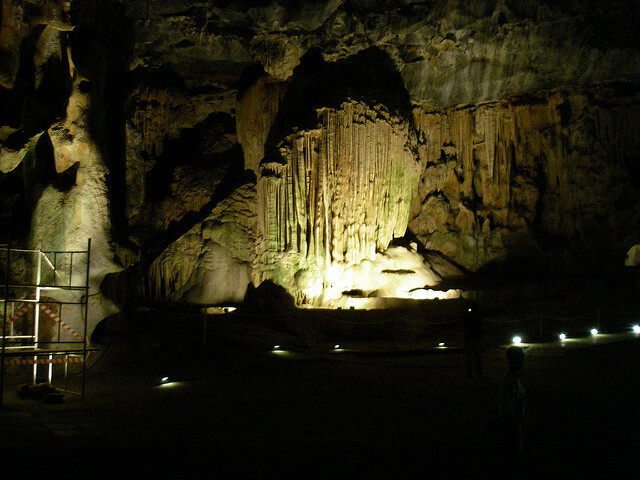 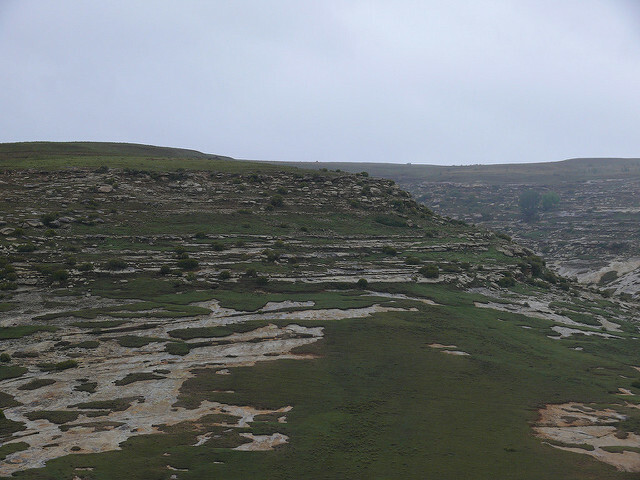 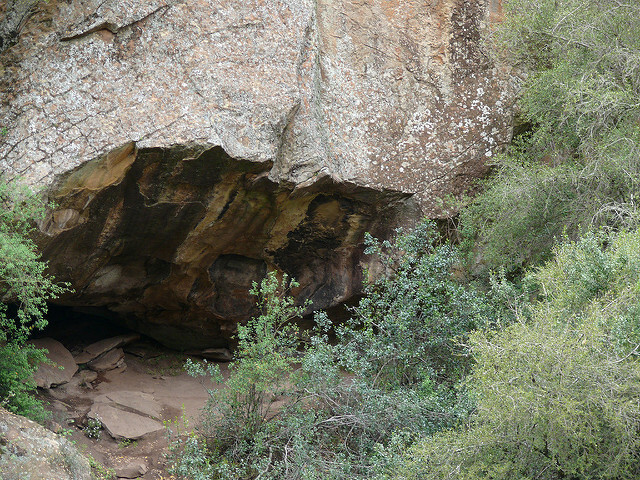 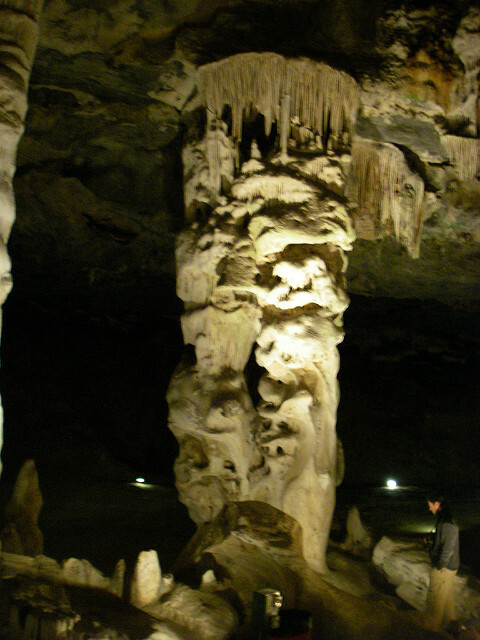 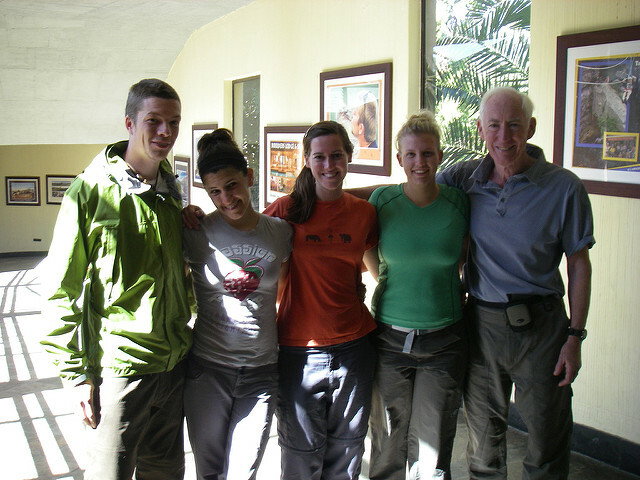 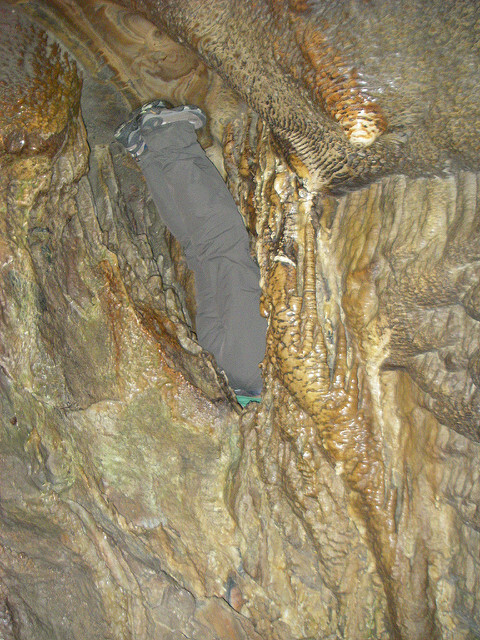 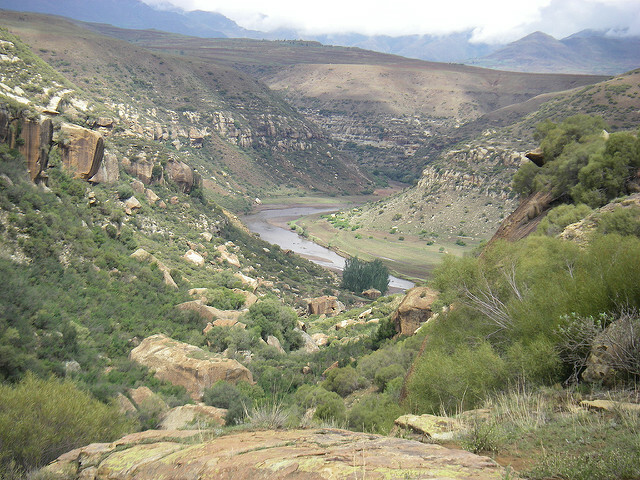 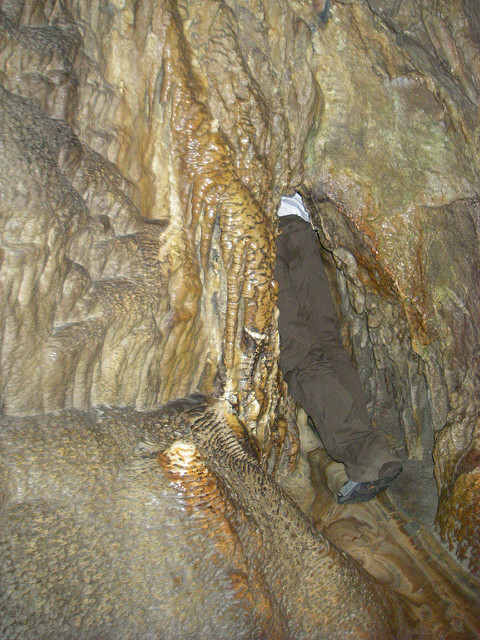 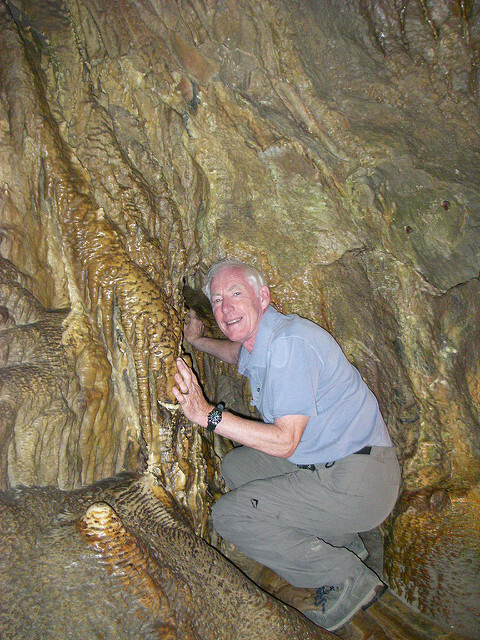 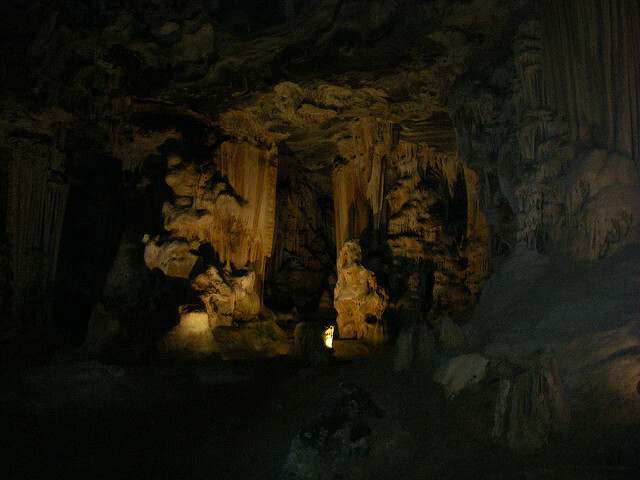 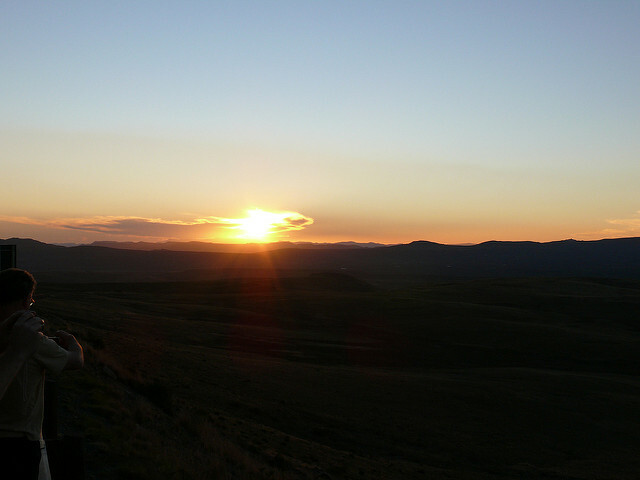 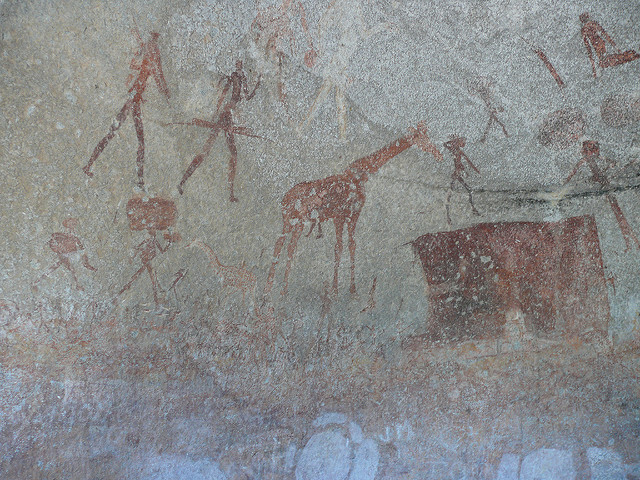 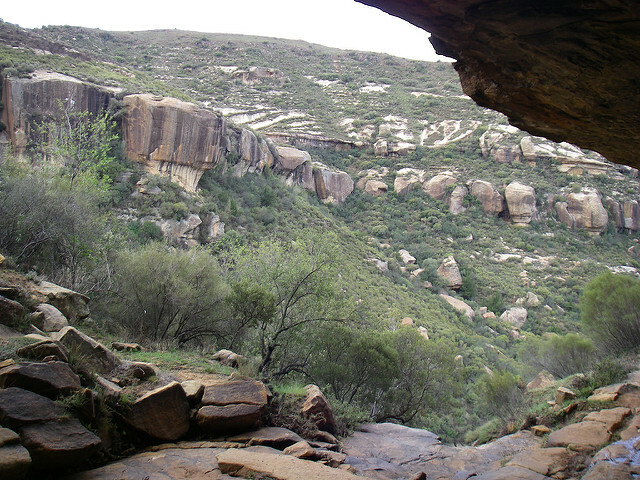 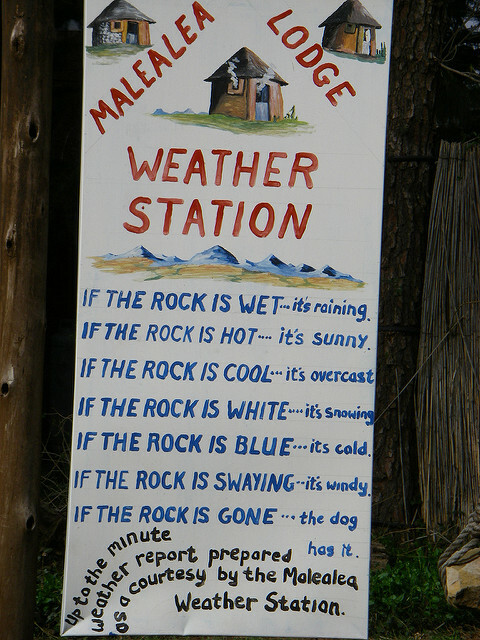 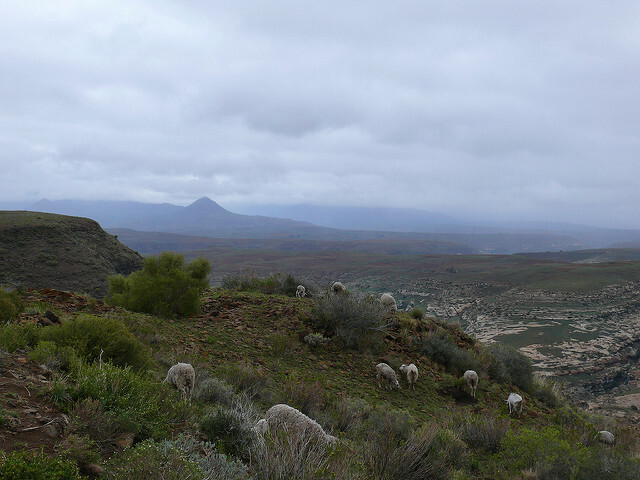 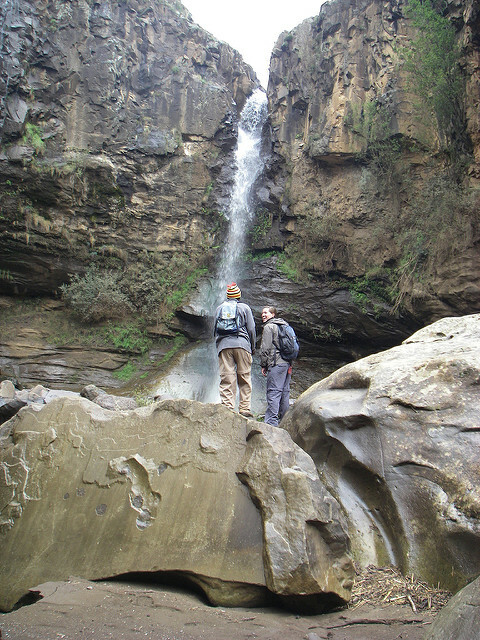 The late opening at the caves lead to a dark arrival at Craddock for the night before an early departure for Lesotho. 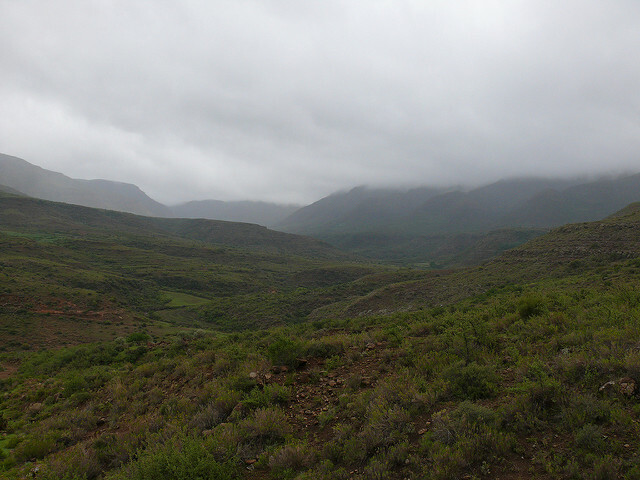 Arriving in the dark and rain at Malealea we camped in a very large room for our stay here. 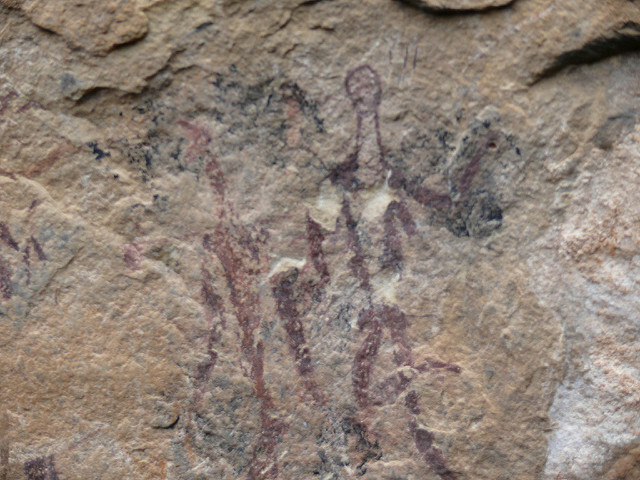 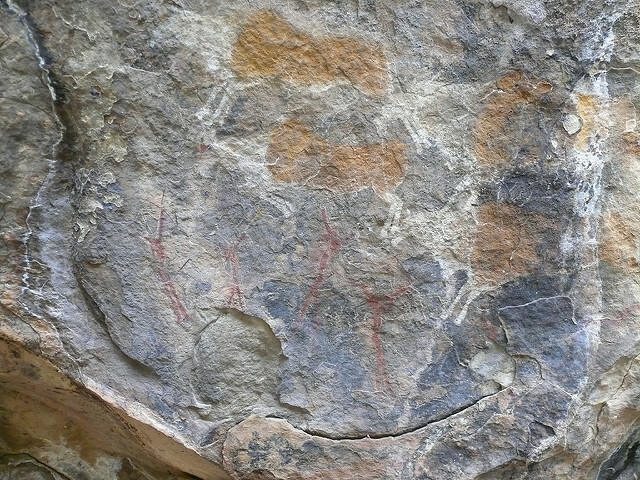 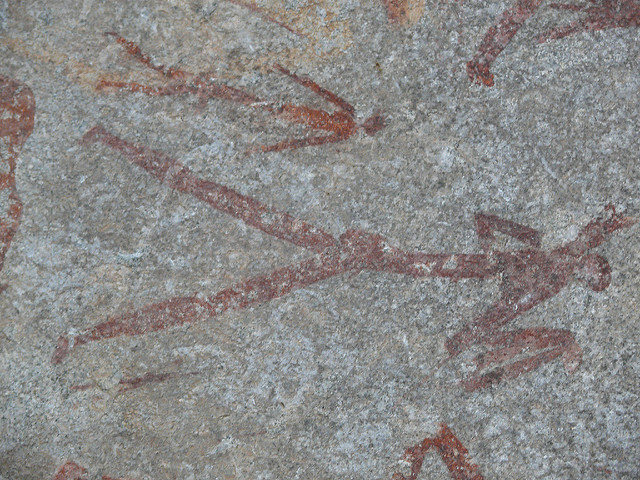 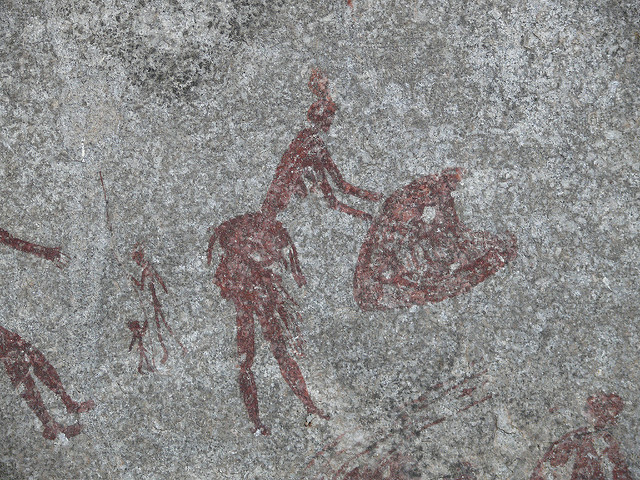 Louise and I made a long walk the next day to a waterfall and caves where we could see some rock drawings. 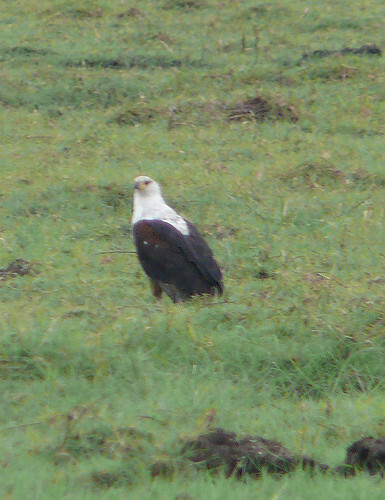 The bad weather forced us to move on a day early for Dundee. 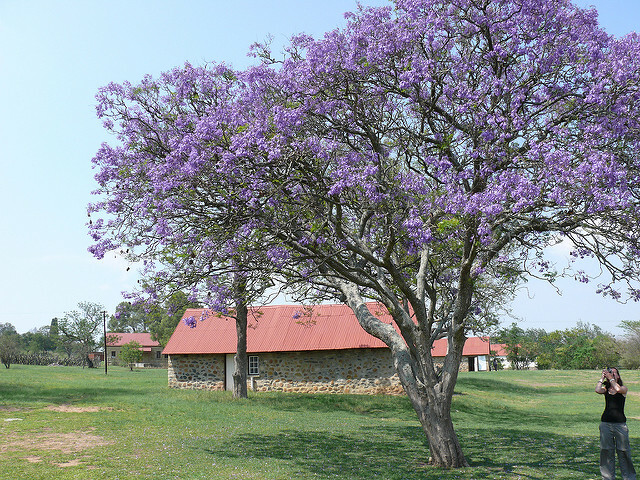 The camp at Dundee was a favorite as it h ad animals roaming, lakes and a 'Playground'! 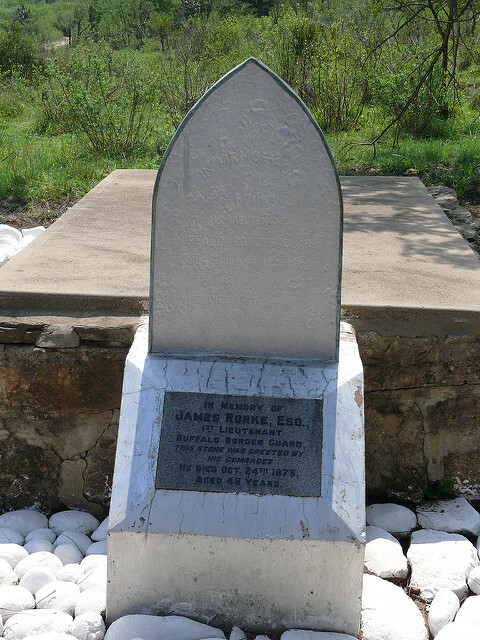 We left to visit the battlefields at Rorke's Drift. 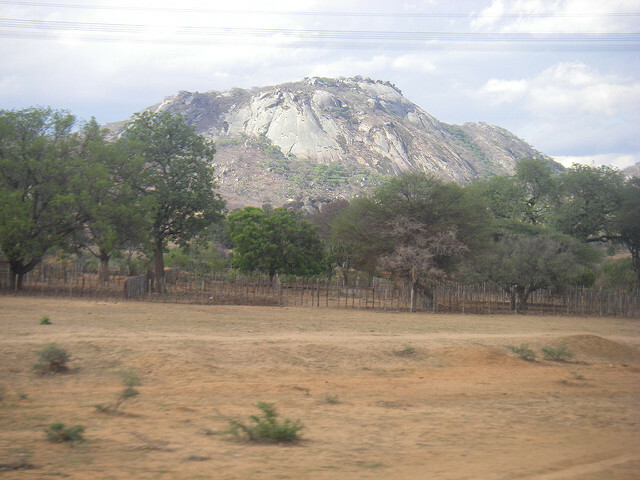 The garrison of 139 soldiers, 35 of whom were hospital patients, fought off an attack which lasted 12 hours. 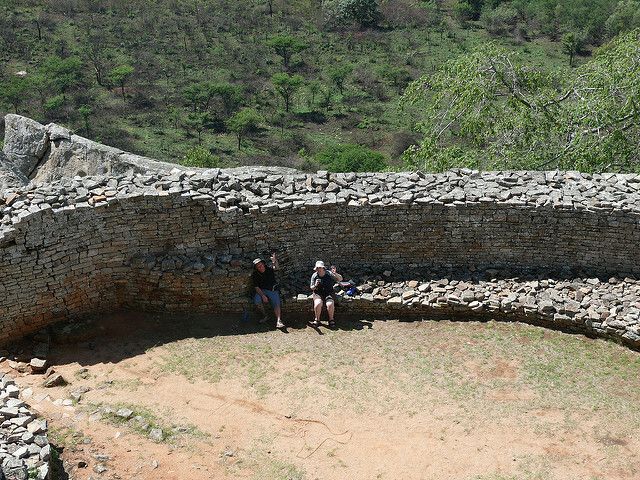 There were 600 Zulus and 17 British killed. 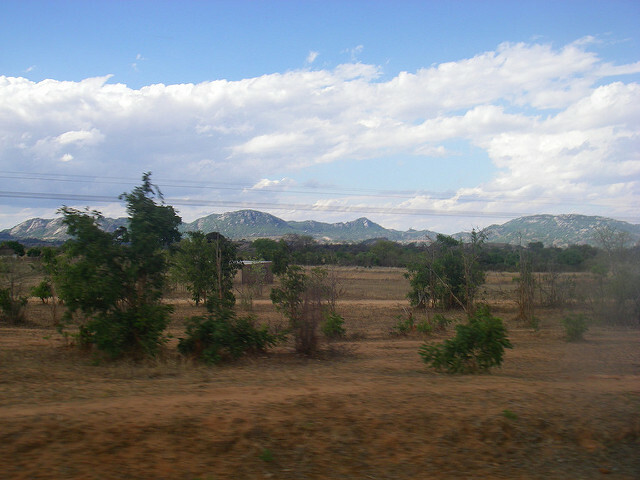 Eleven Victoria Crosses were awarded. 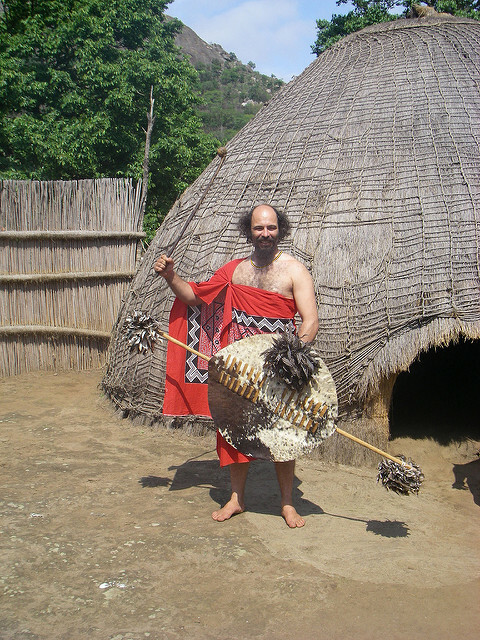 A late arrival at Milwane in Swaziland. 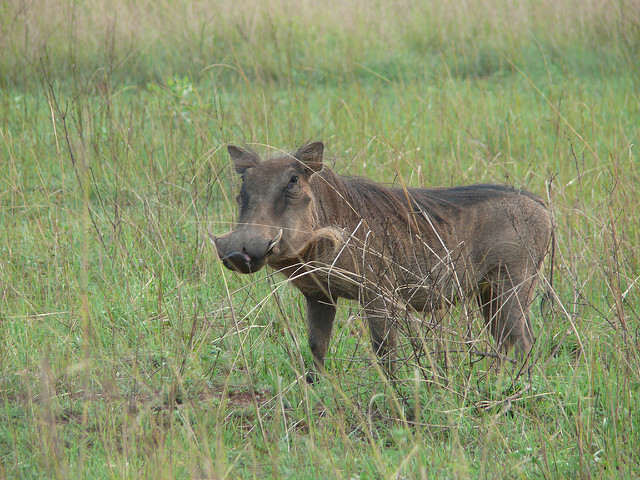 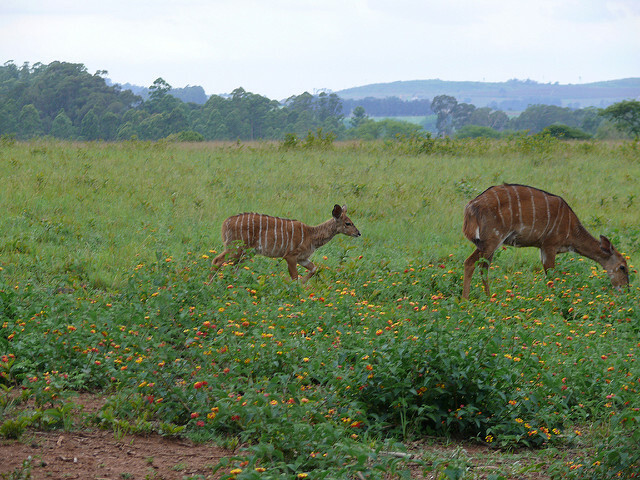 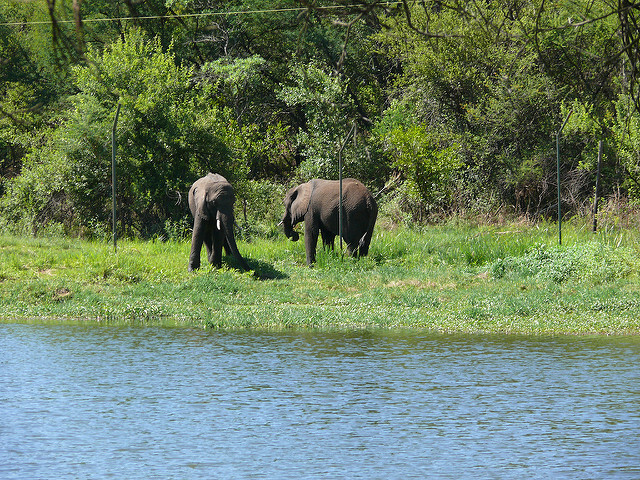 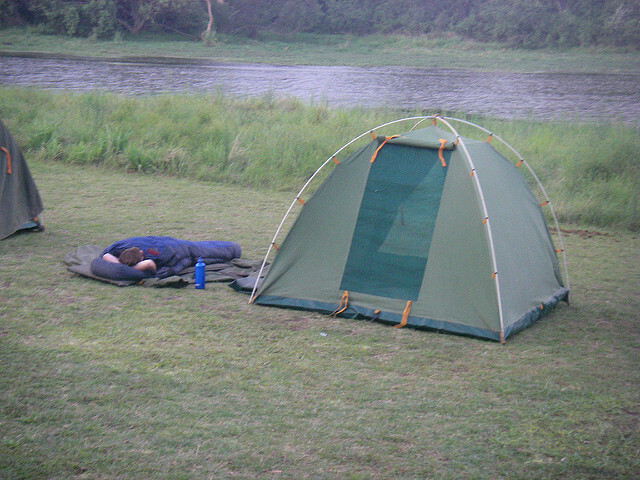 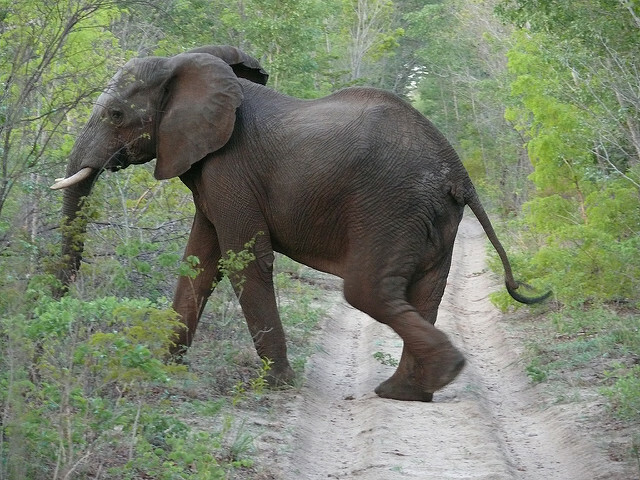 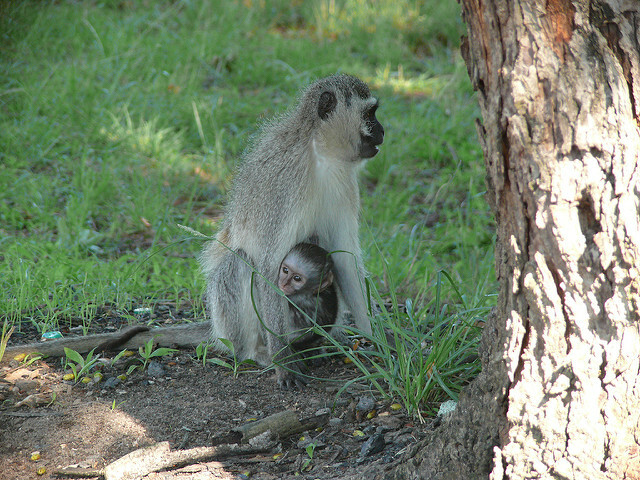 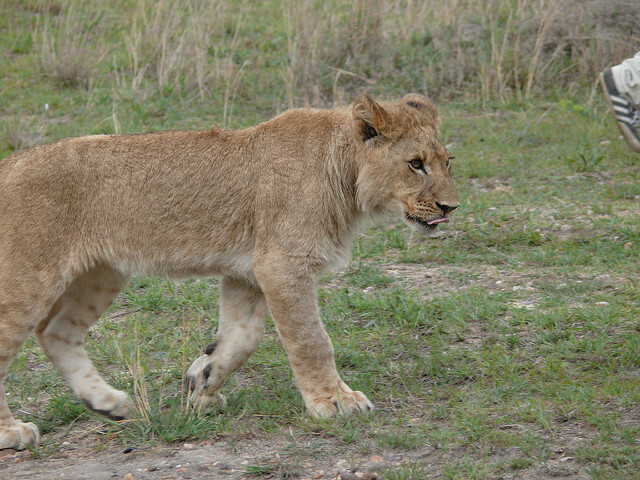 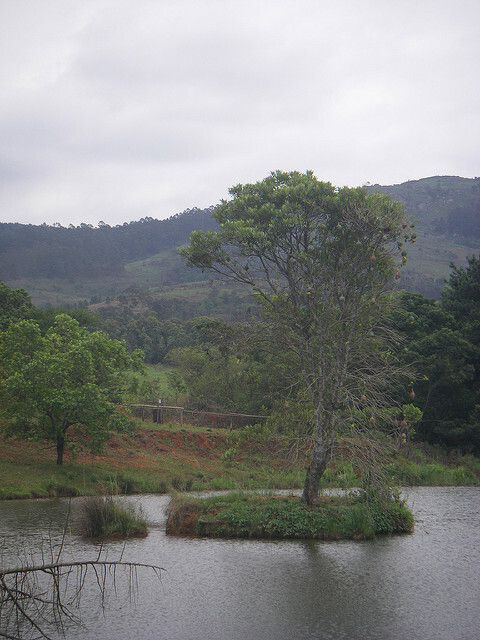 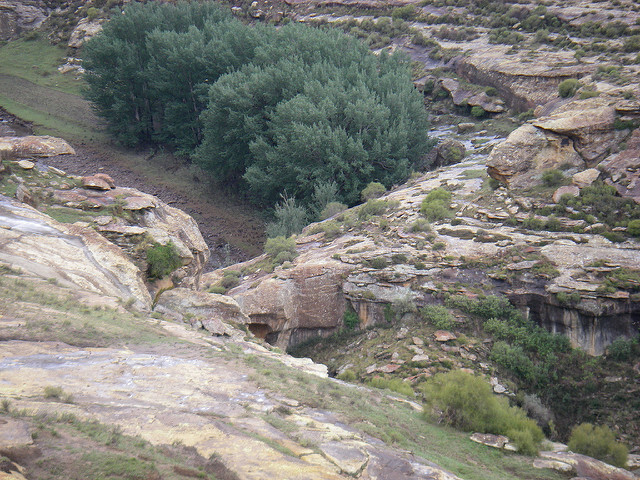 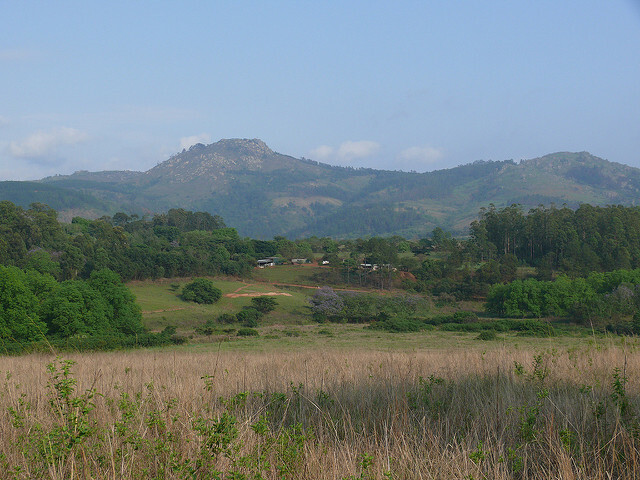 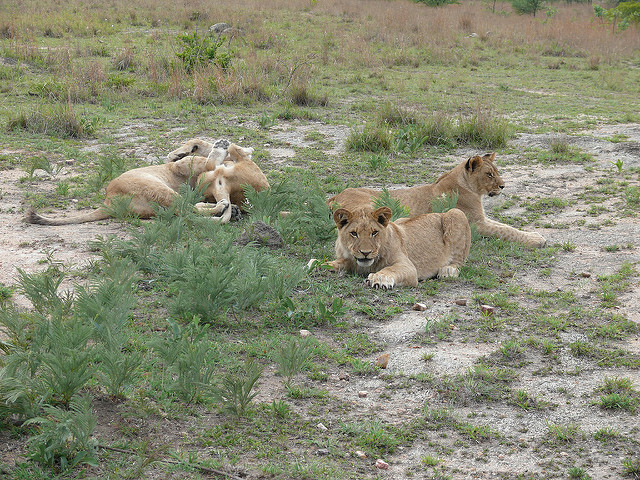 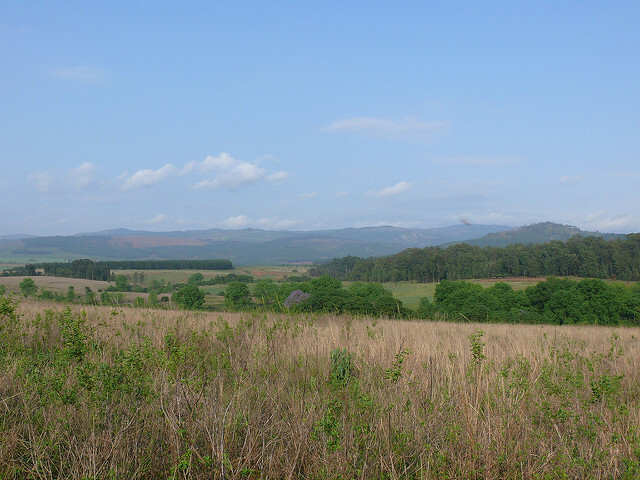 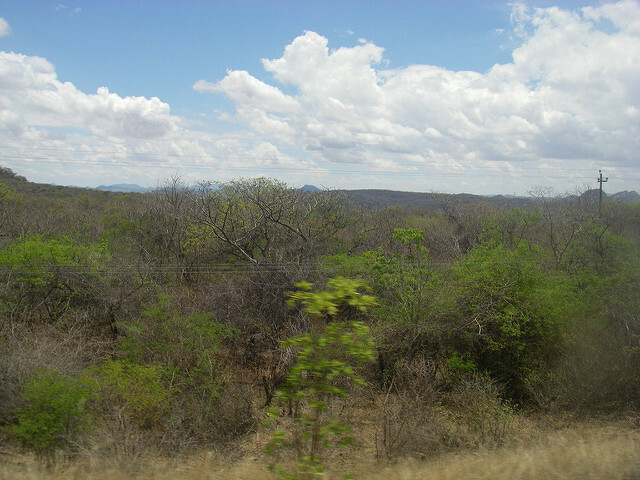 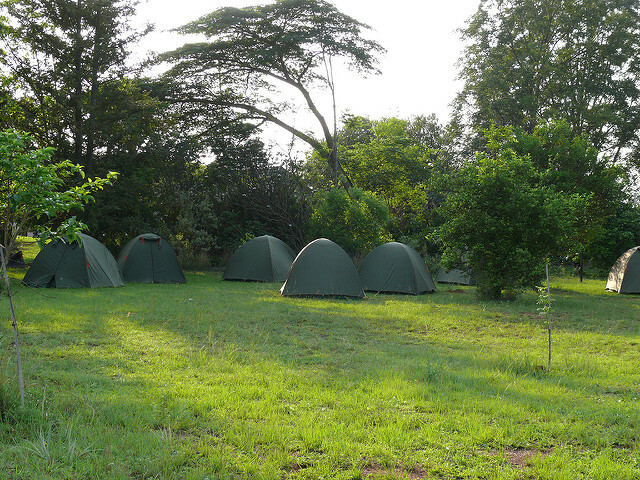 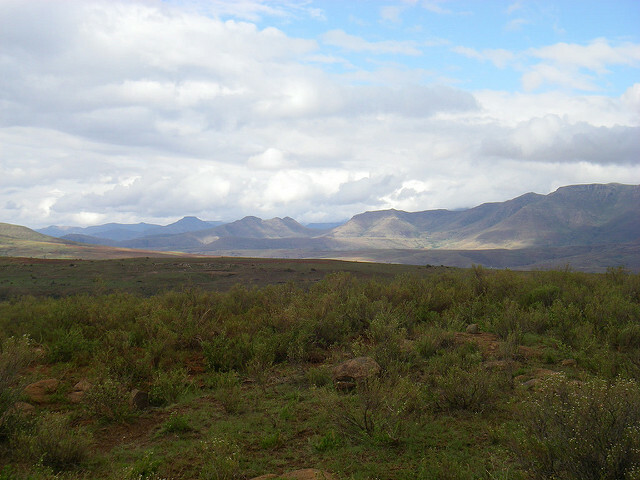 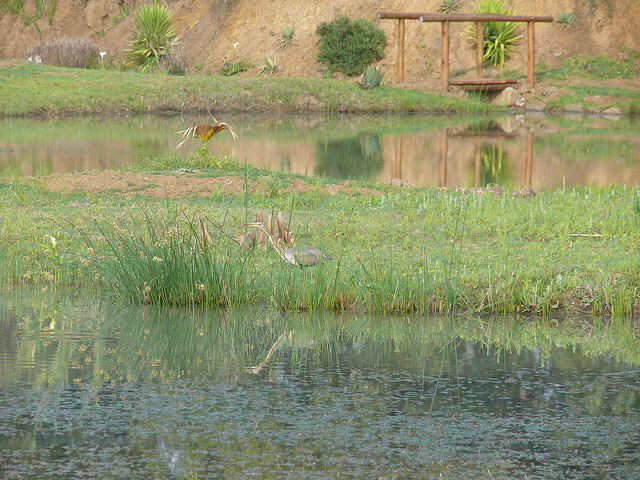 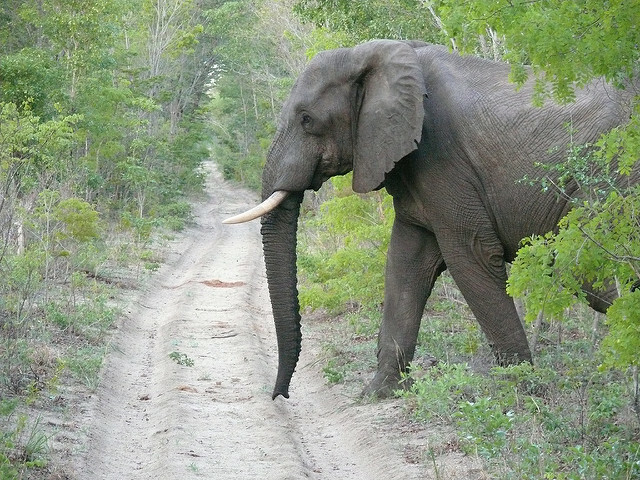 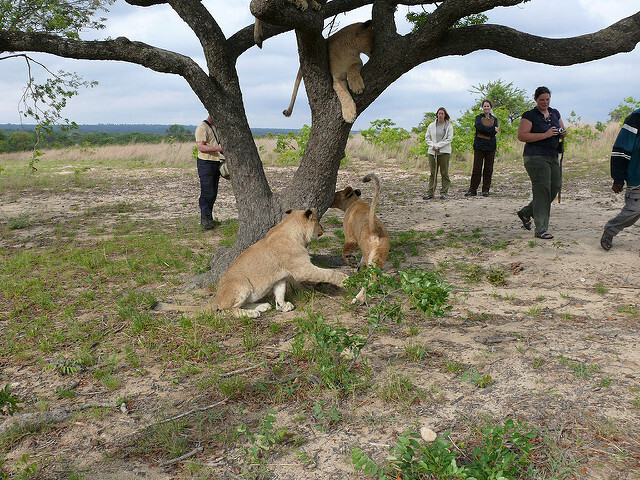 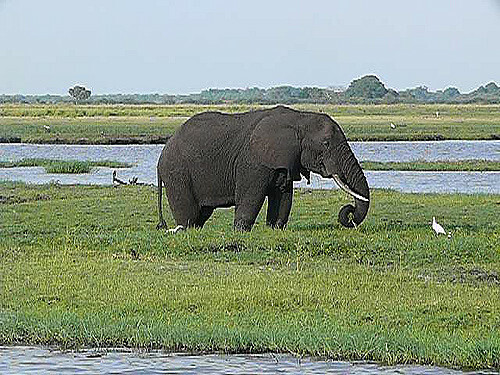 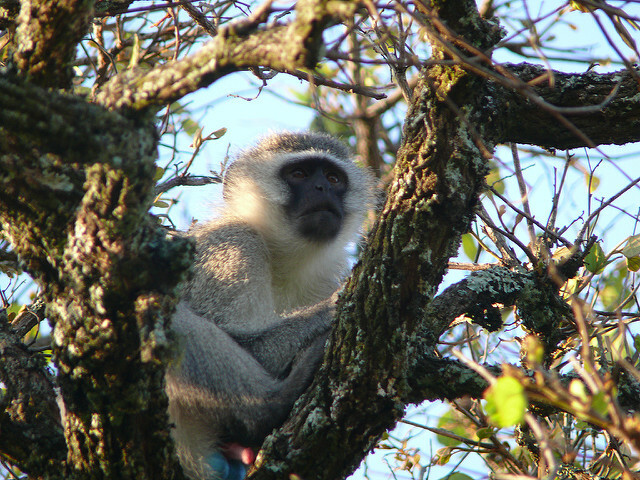 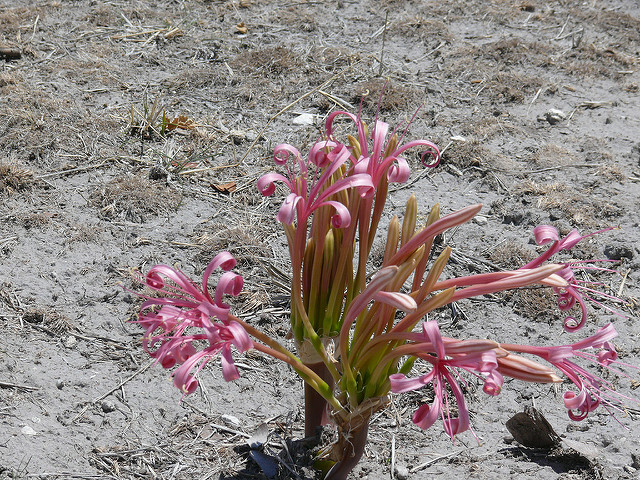 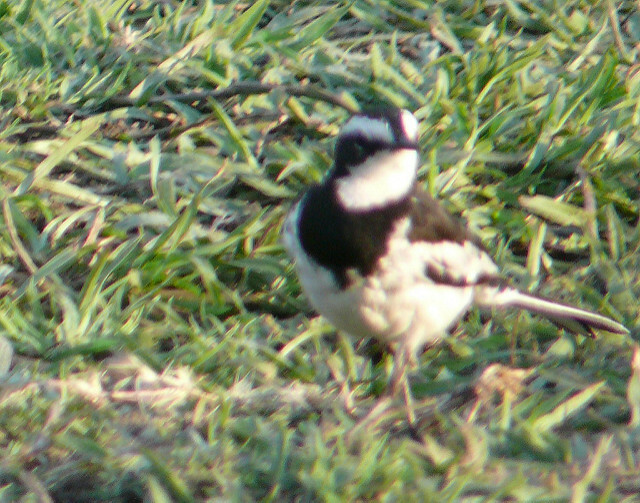 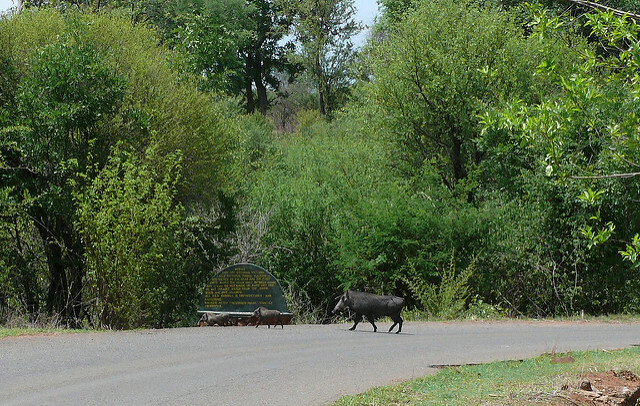 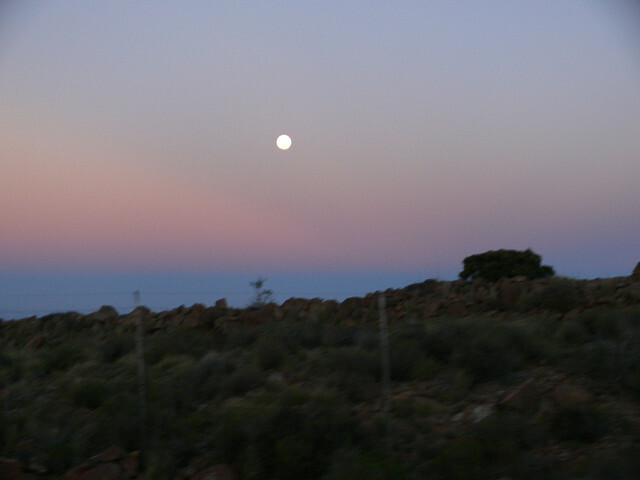 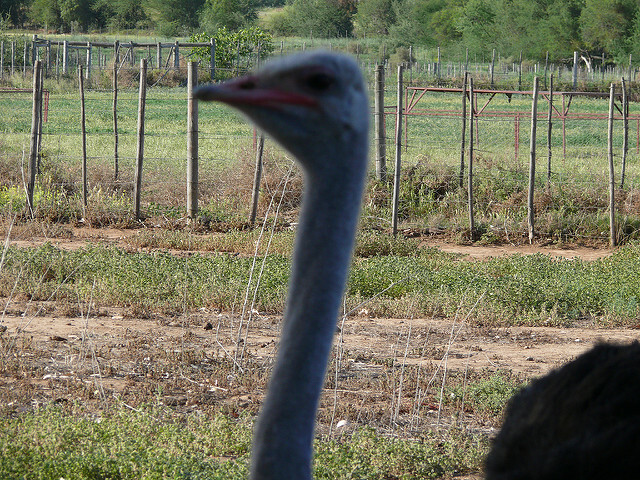 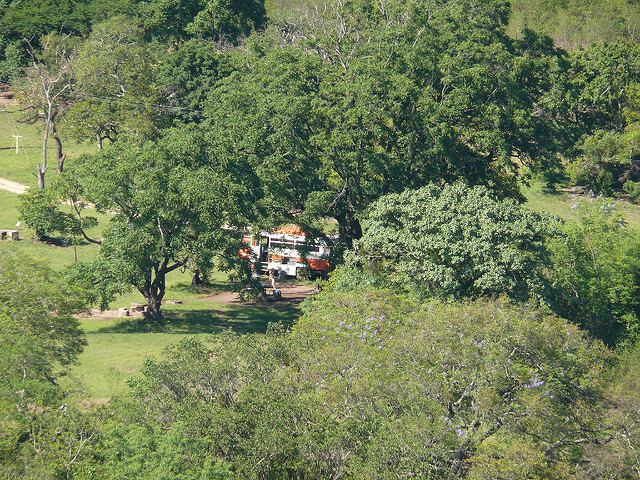 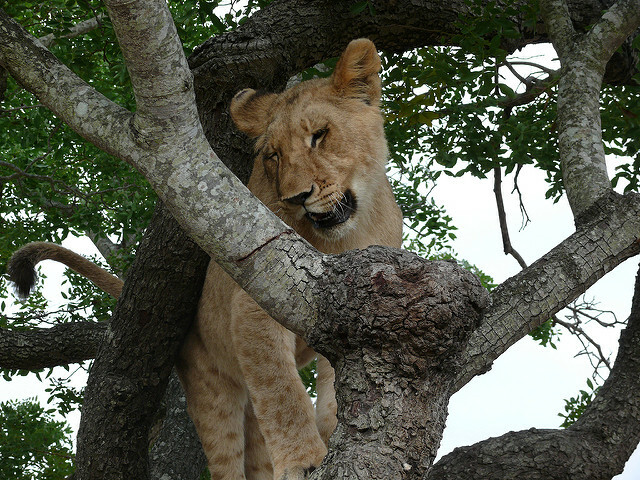 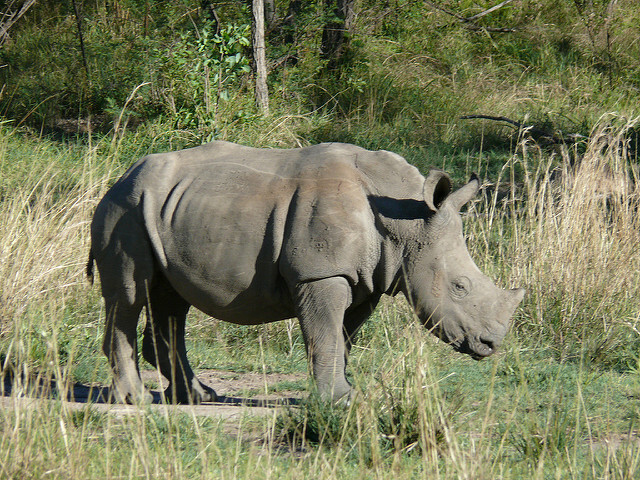 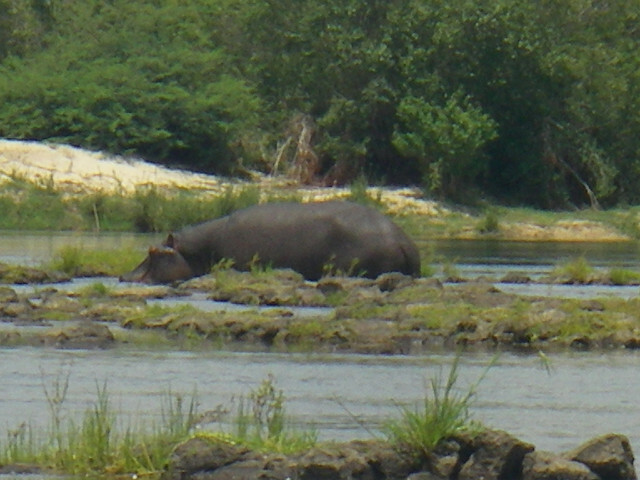 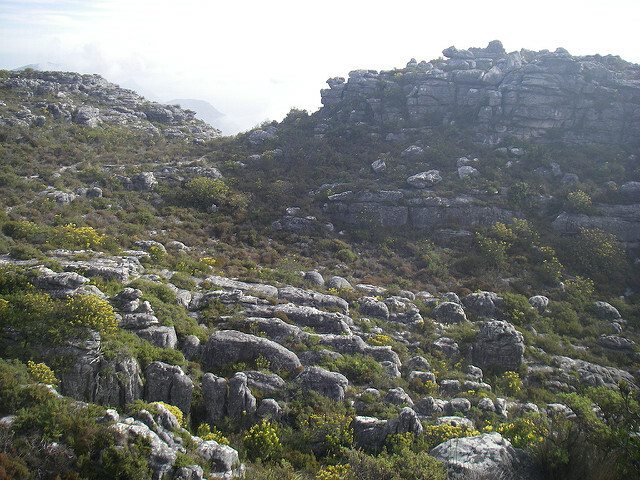 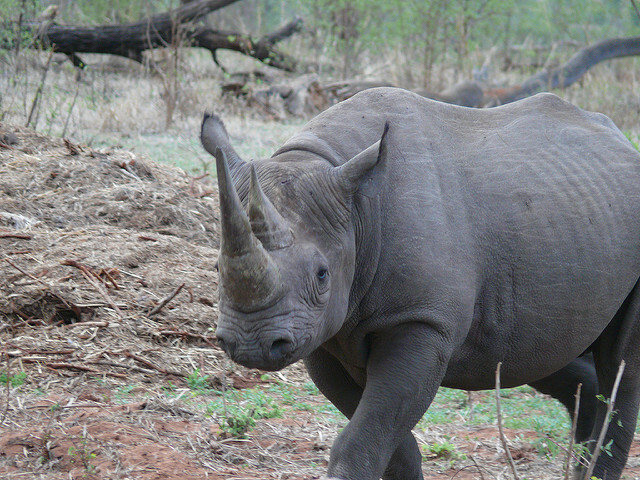 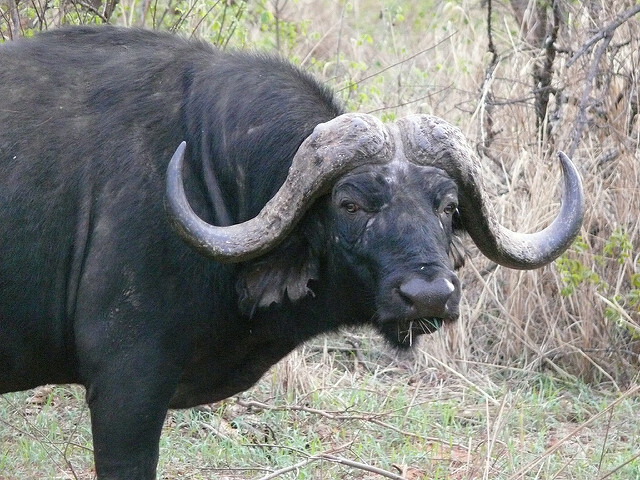 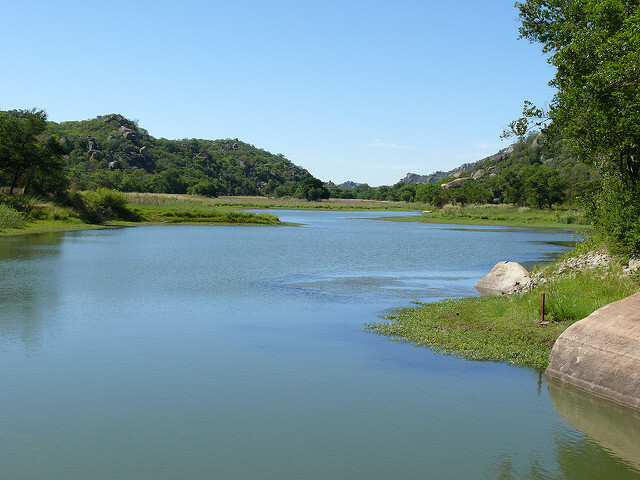 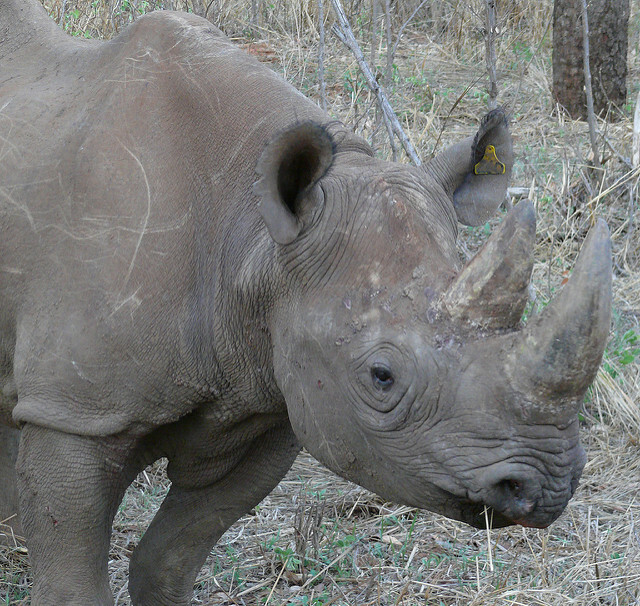 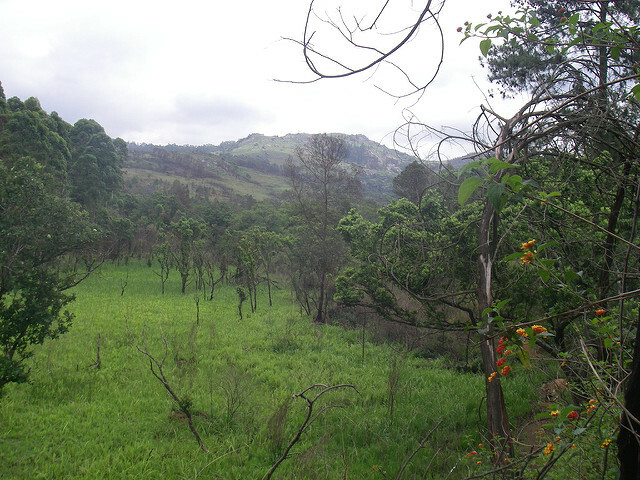 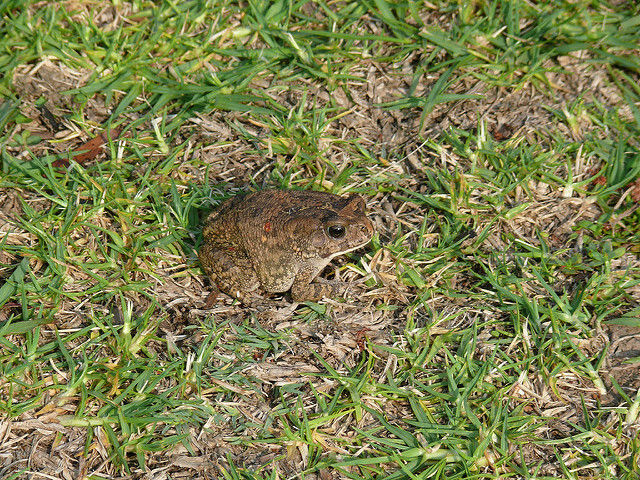 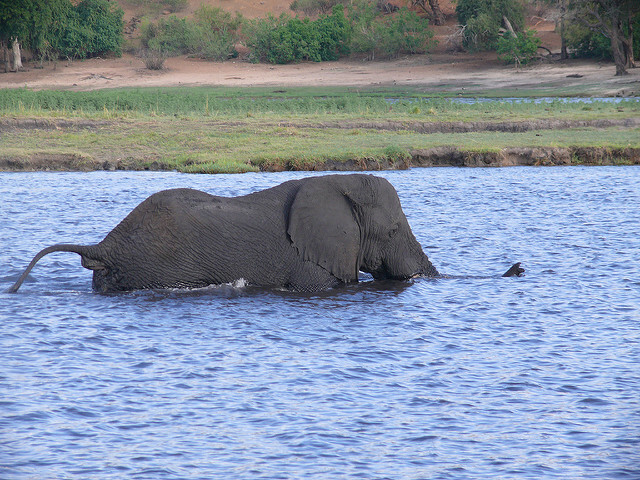 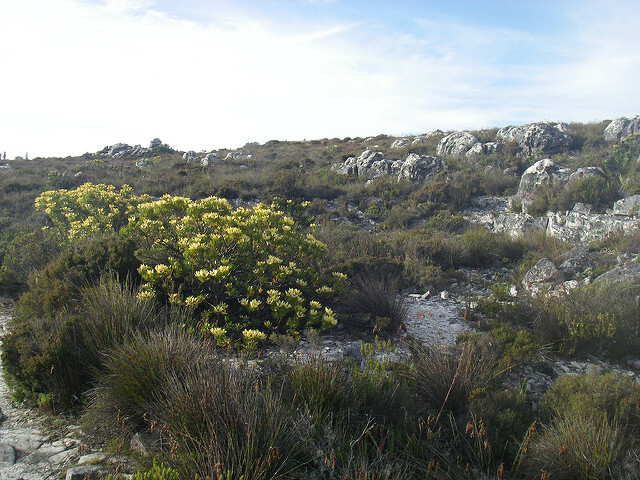 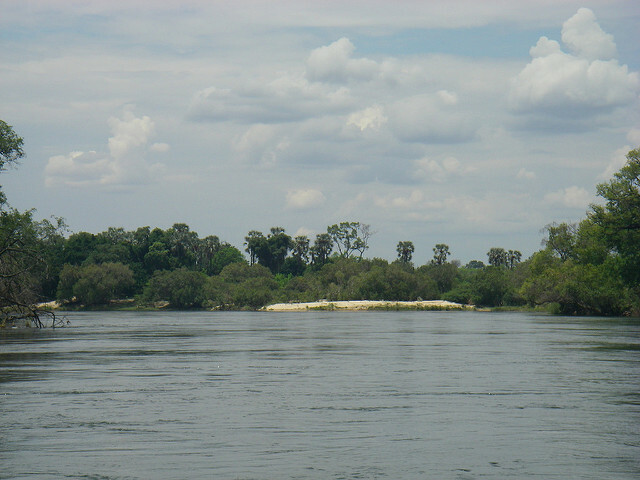 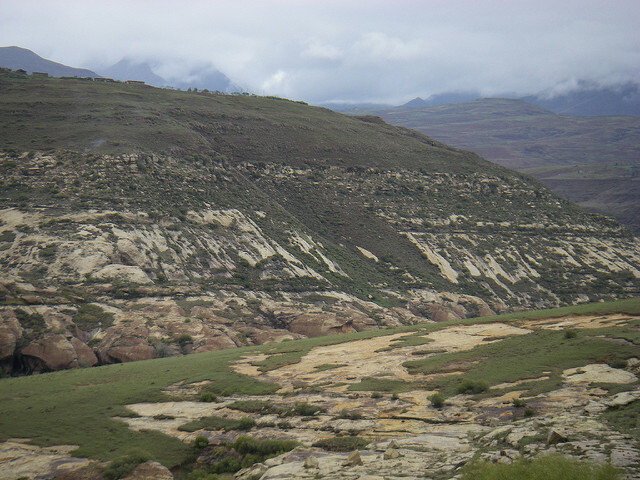 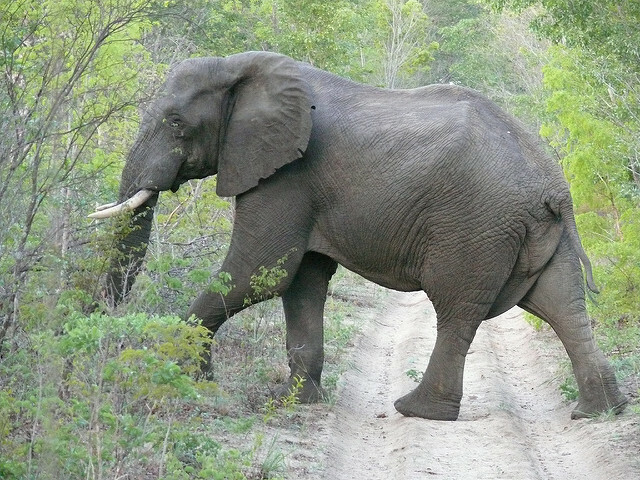 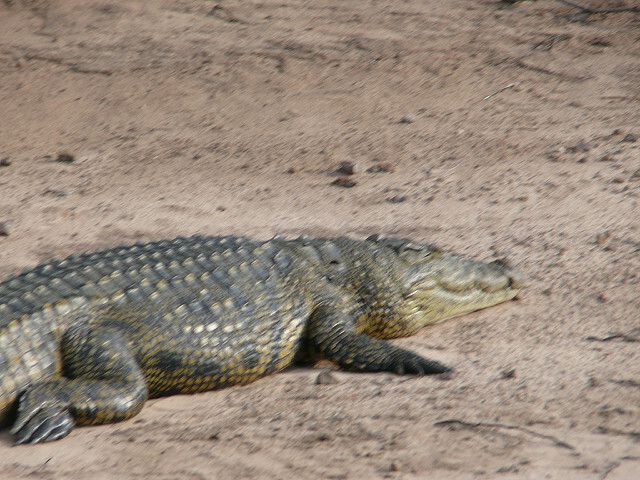 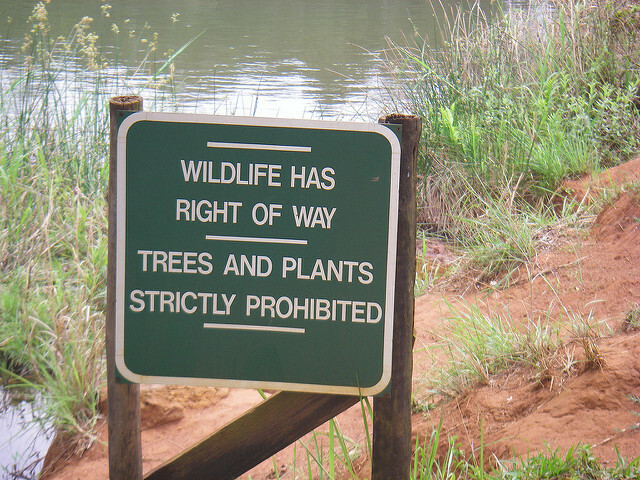 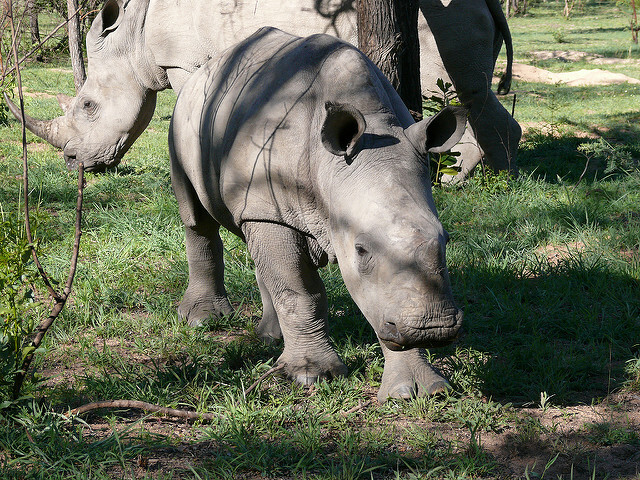 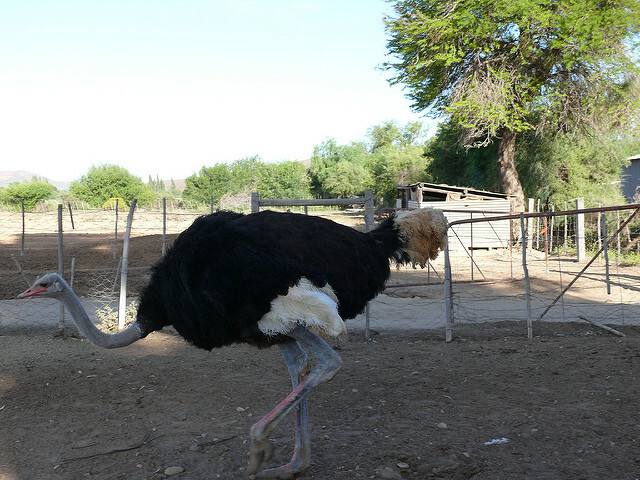 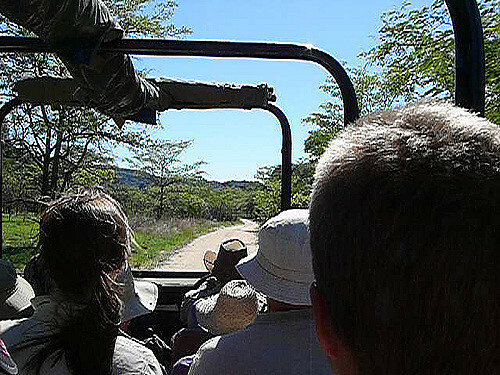 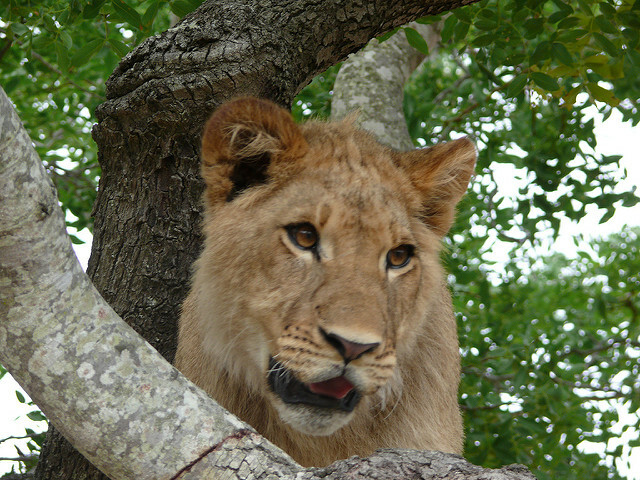 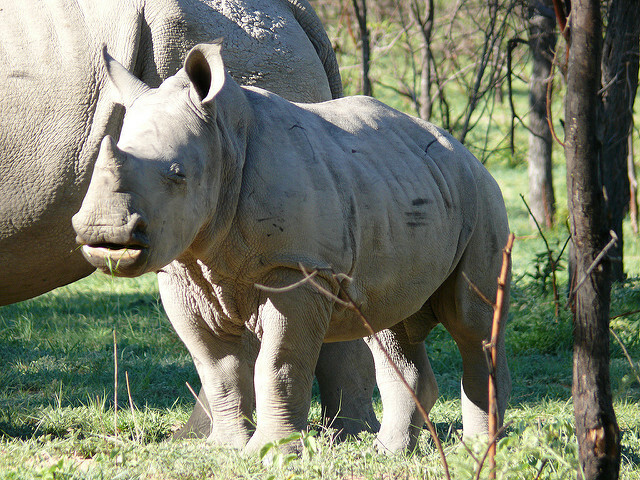 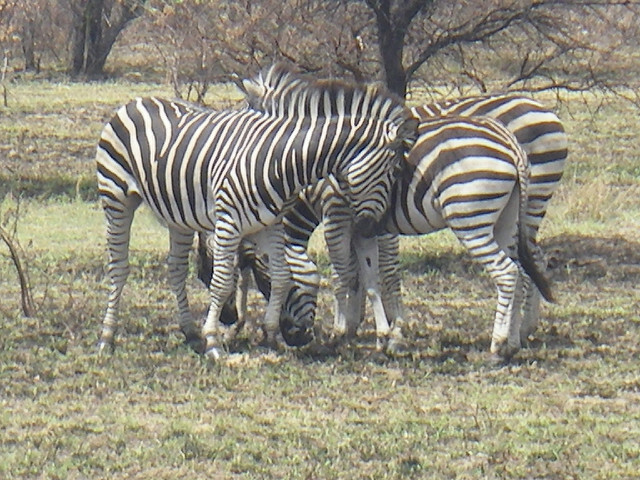 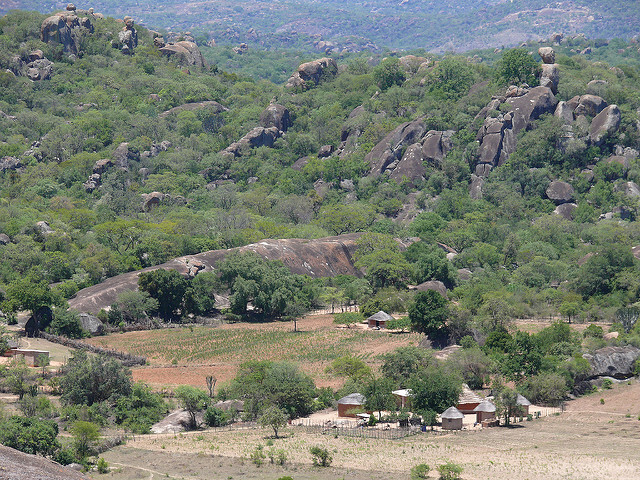 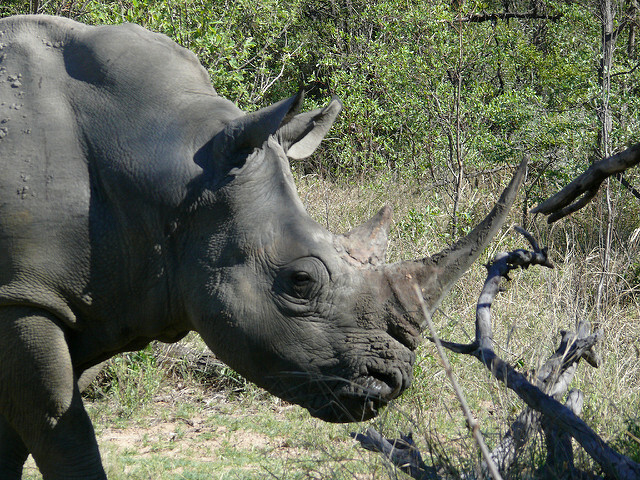 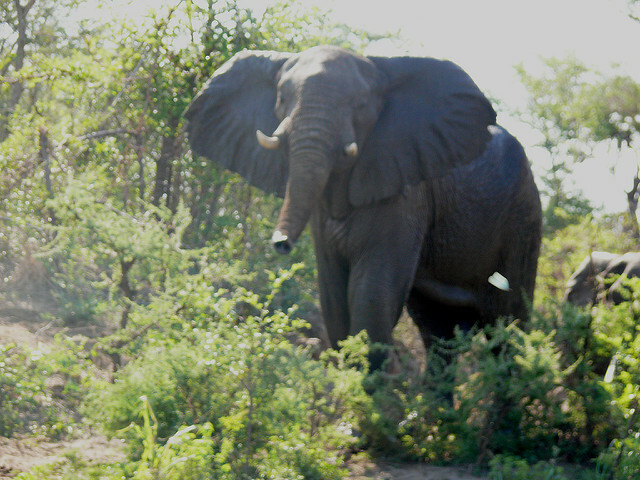 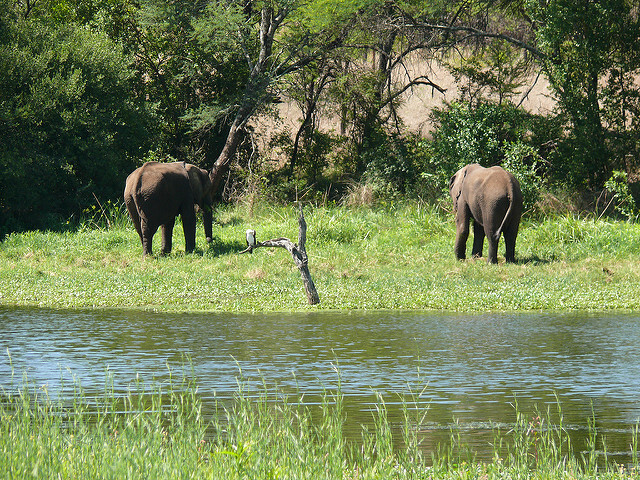 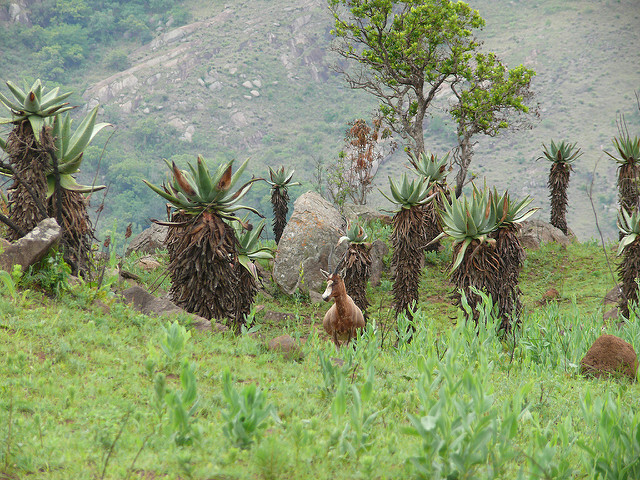 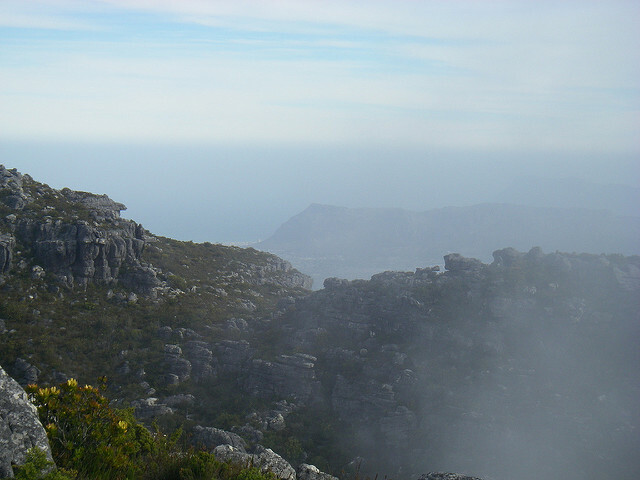 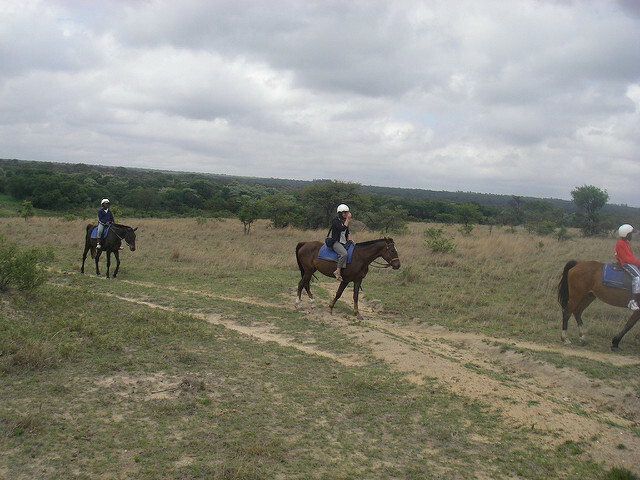 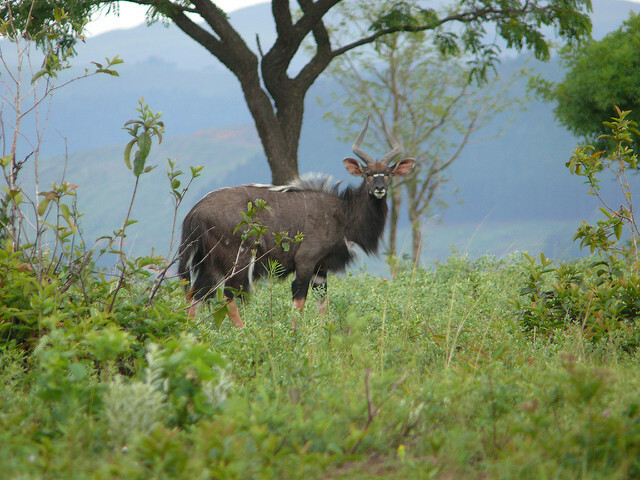 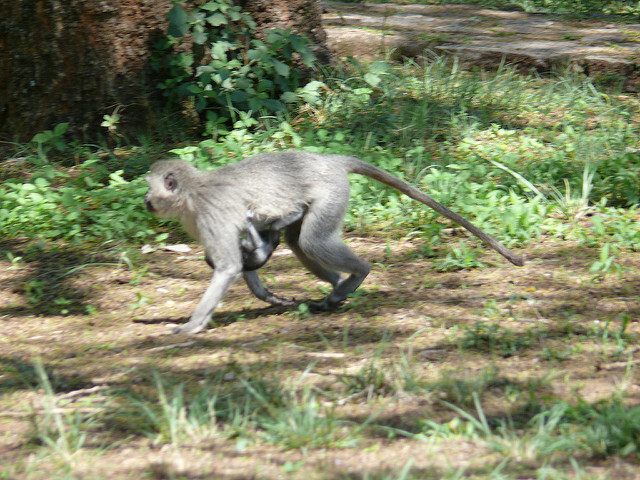 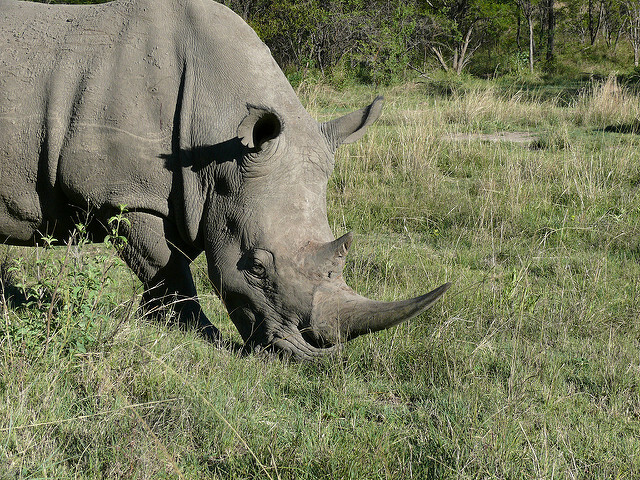 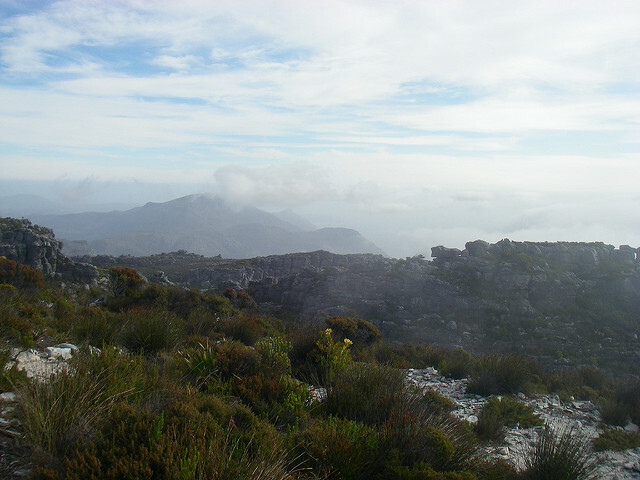 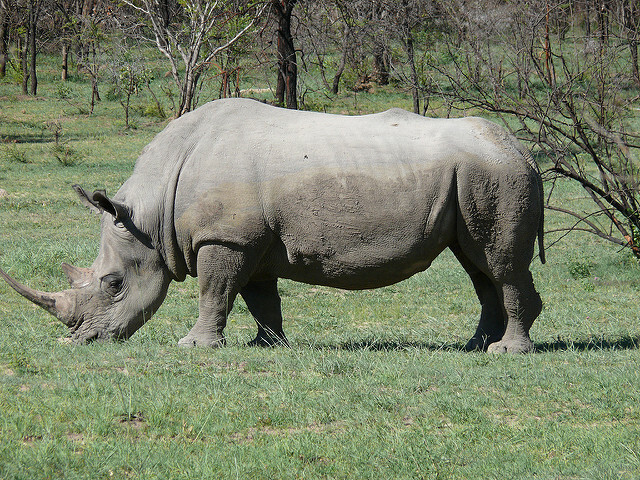 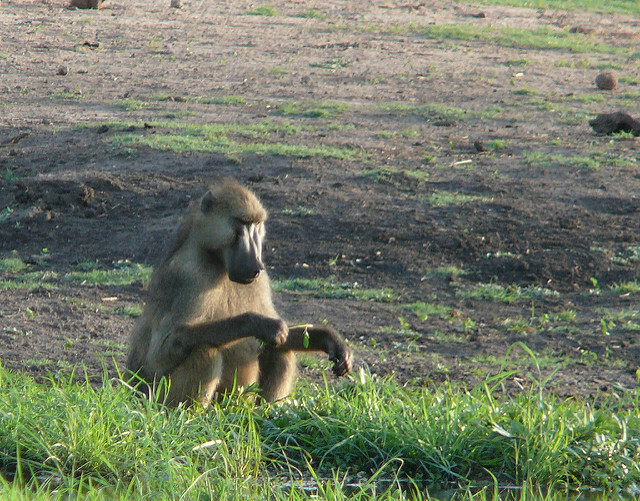 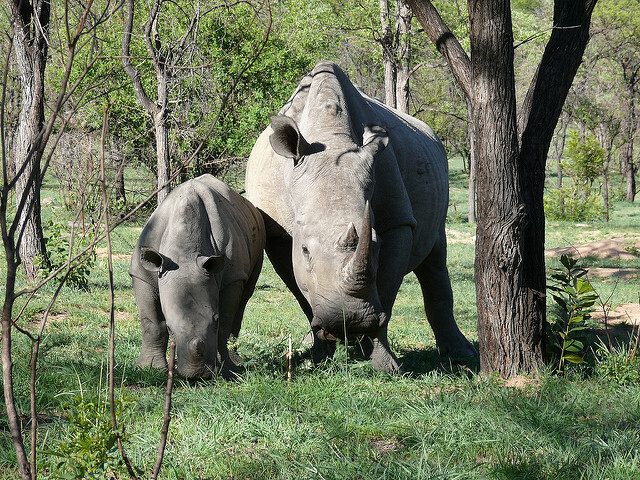 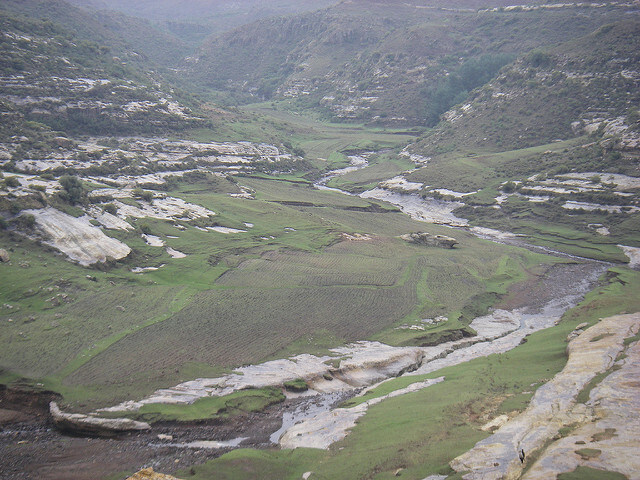 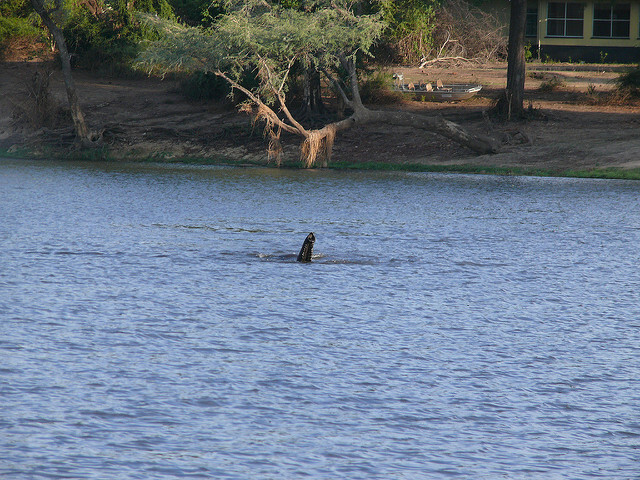 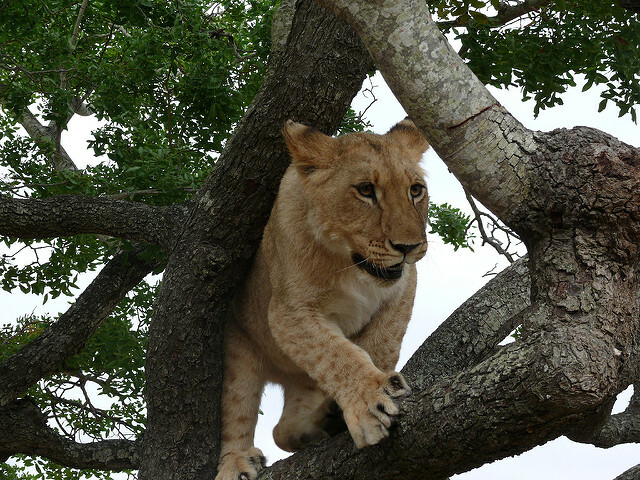 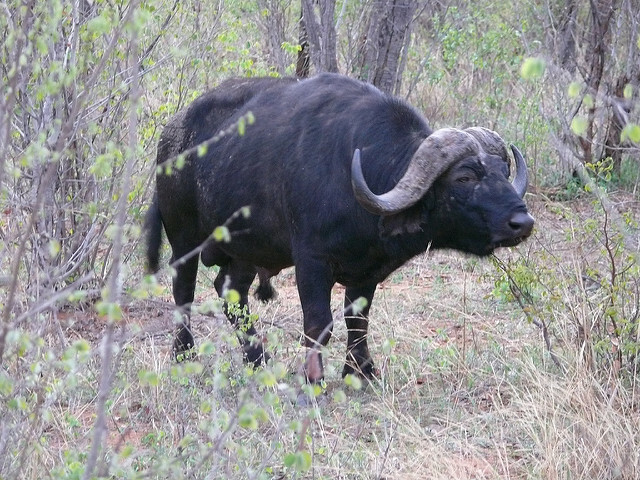 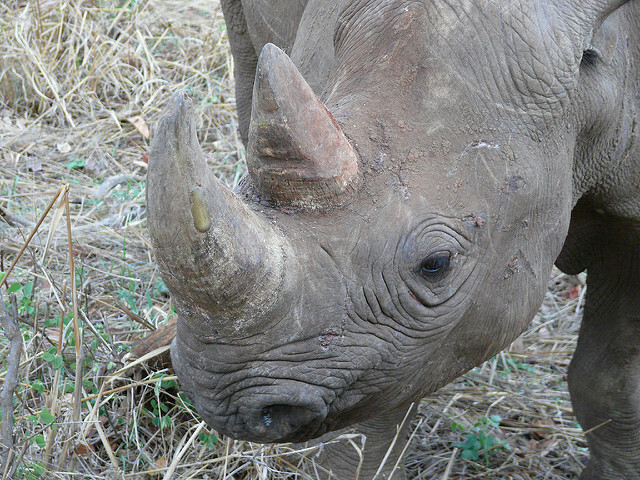 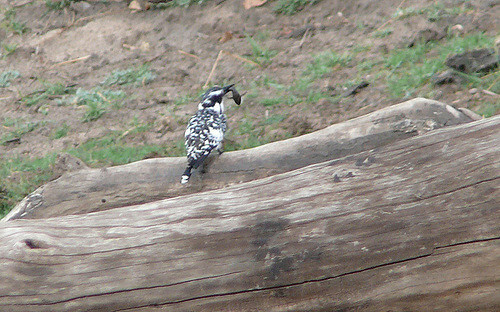 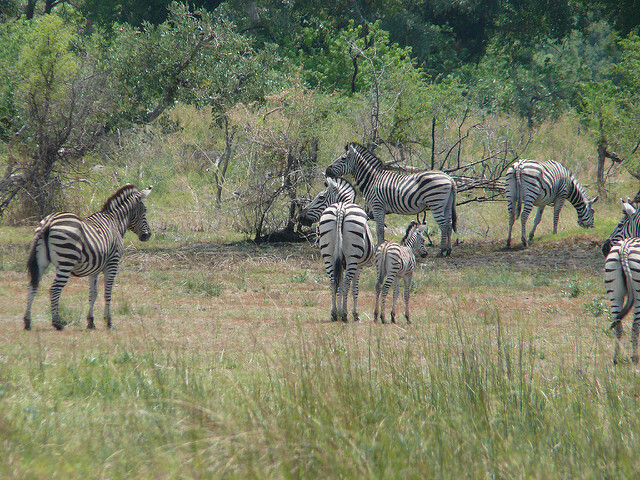 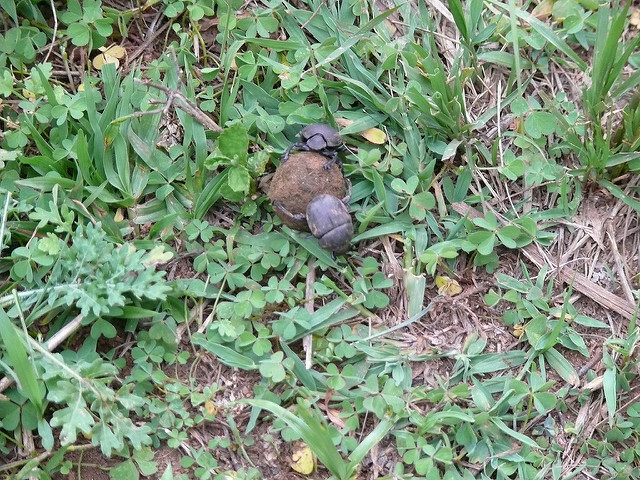 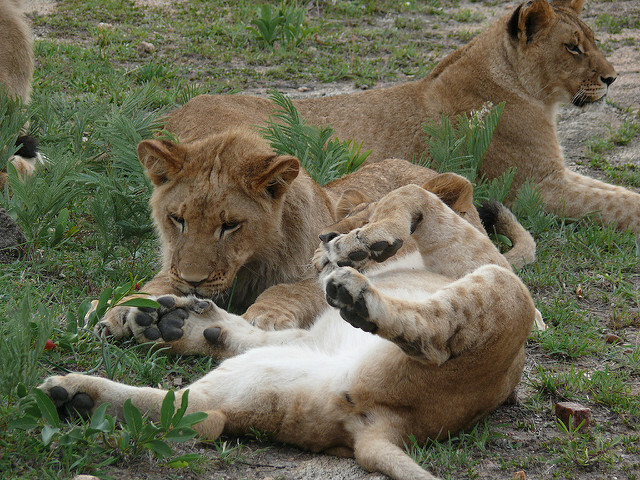 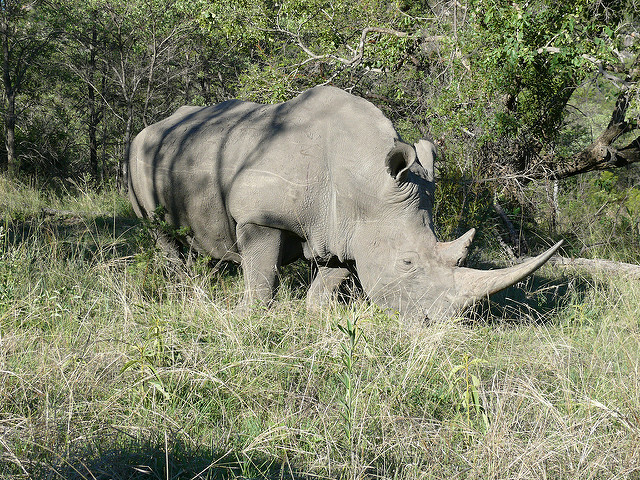 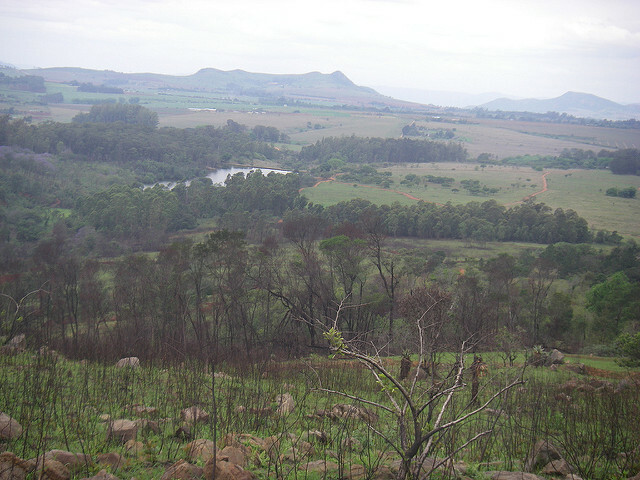 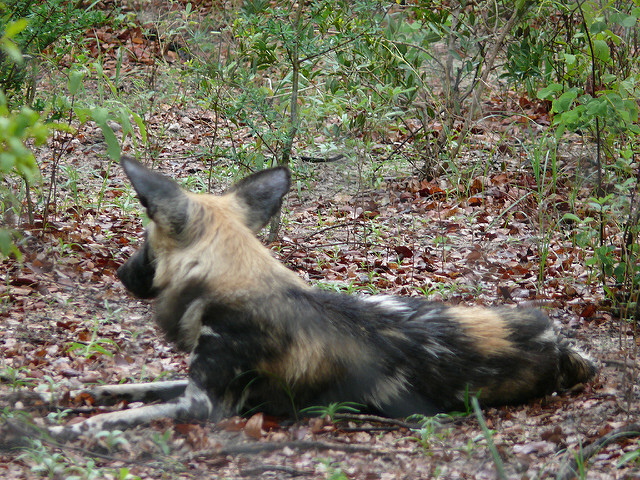 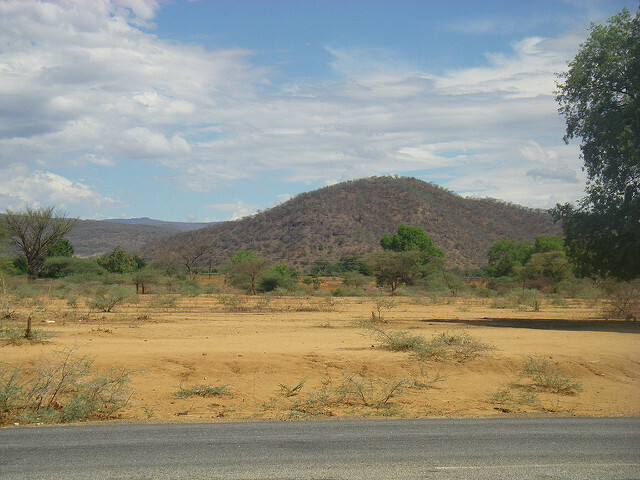 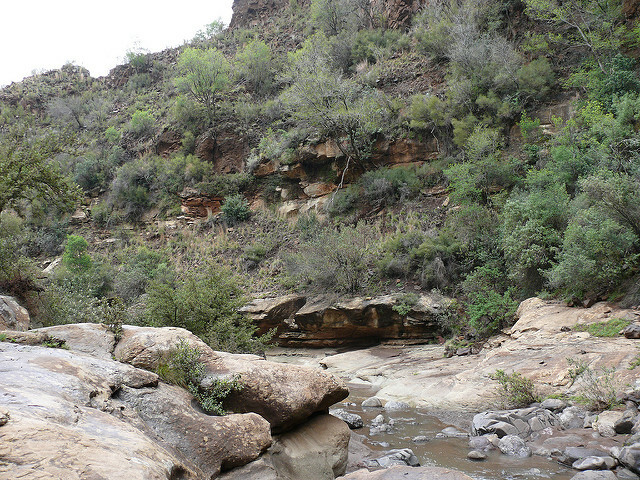 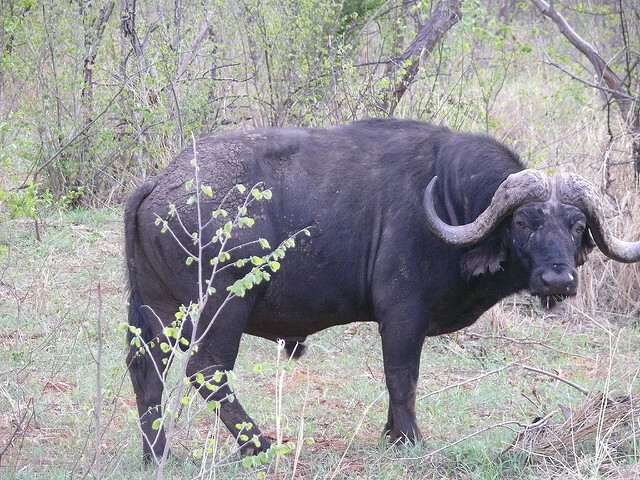 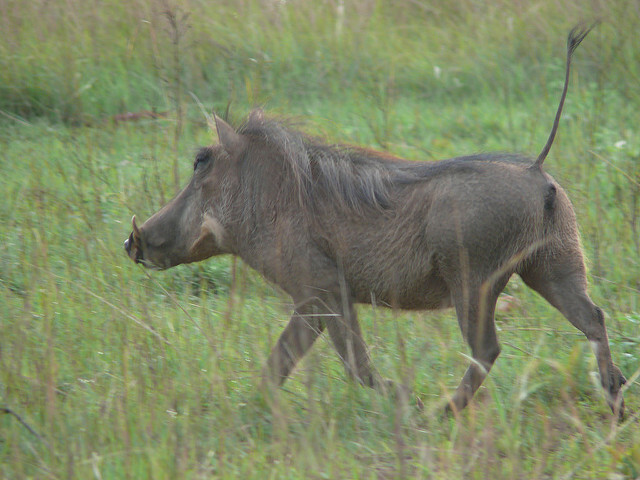 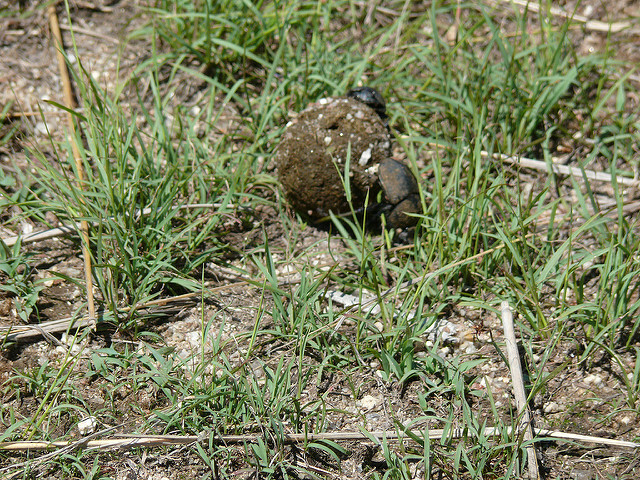 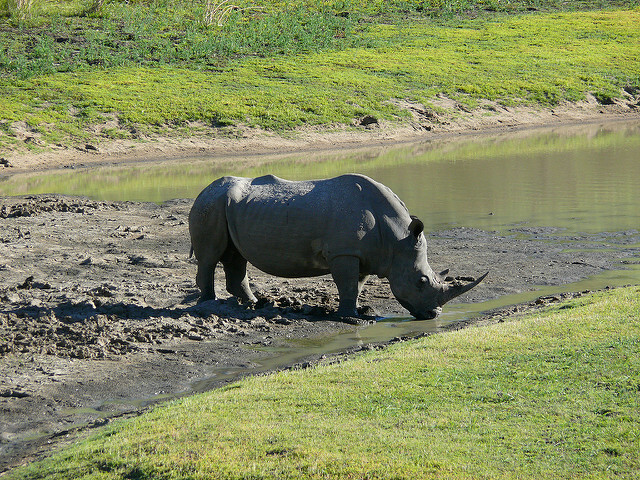 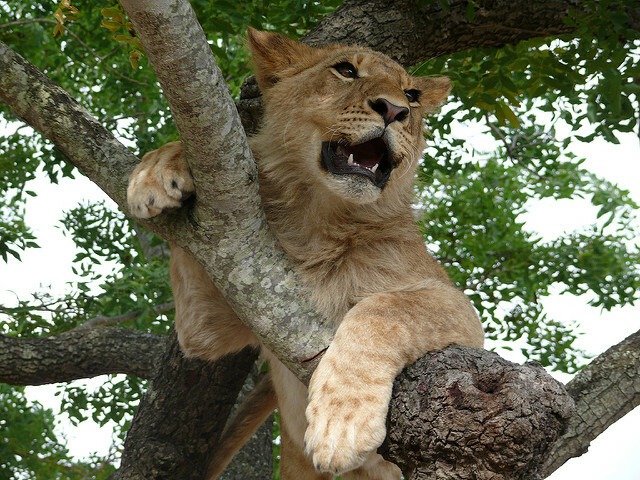 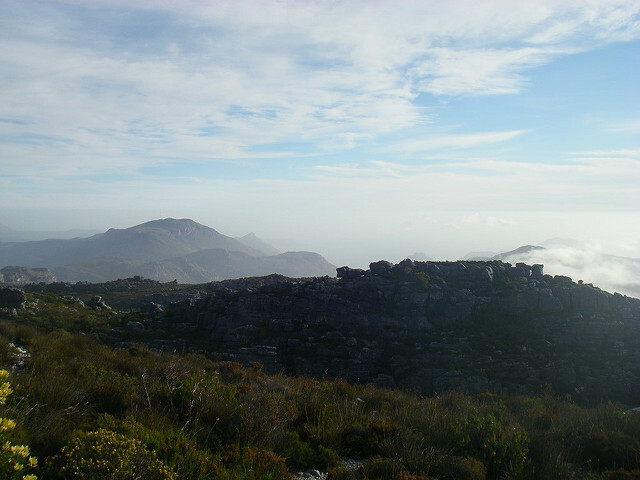 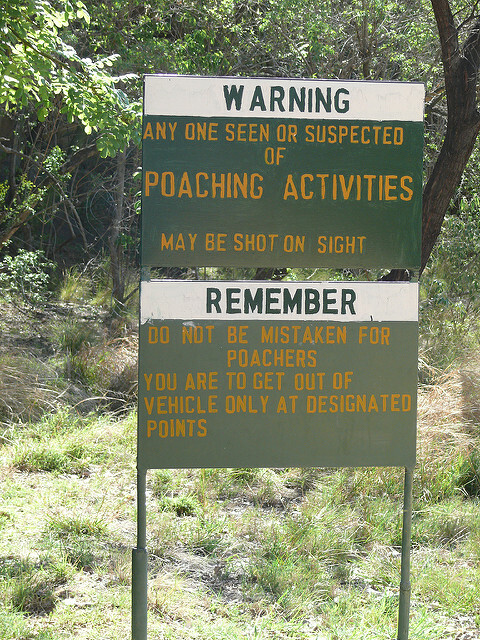 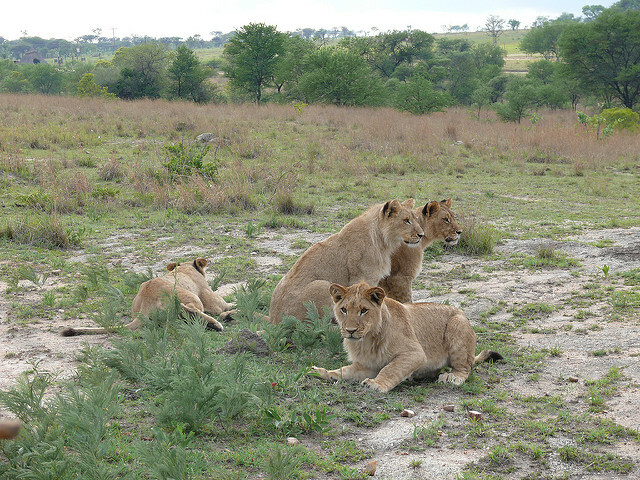 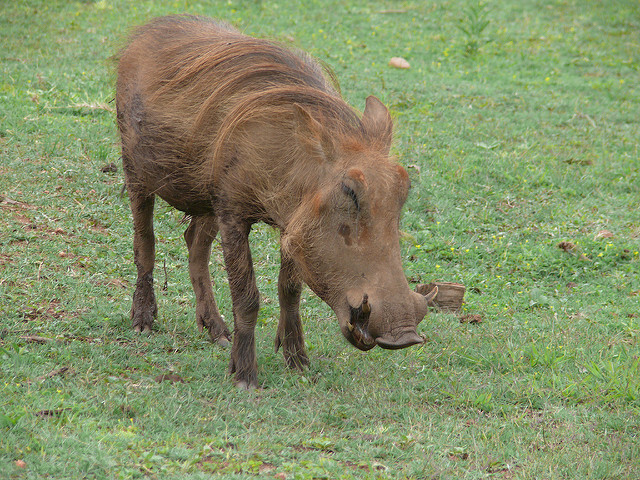 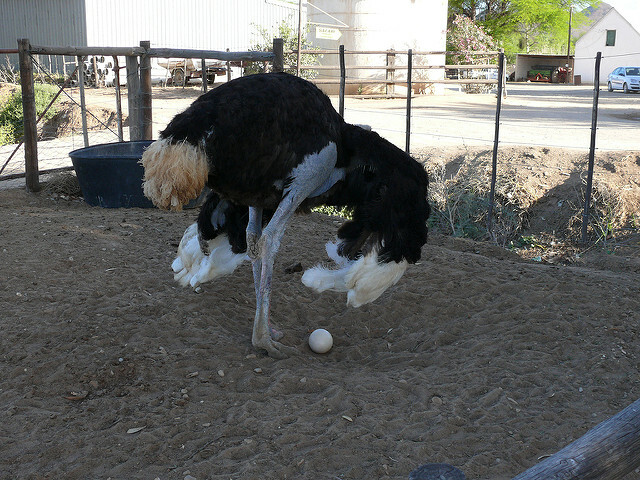 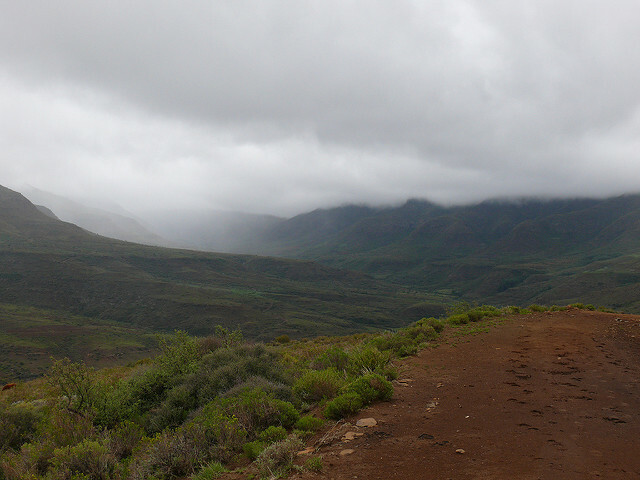 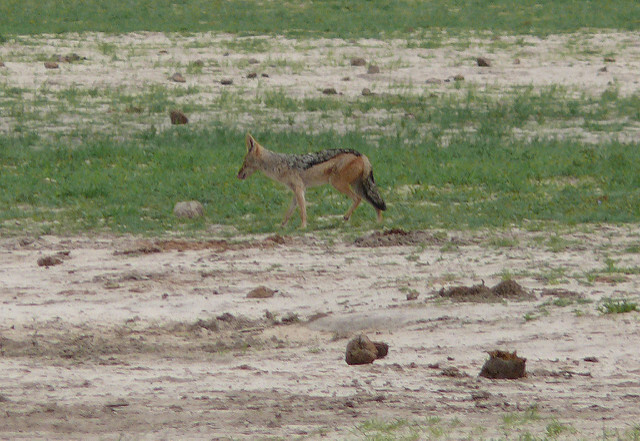 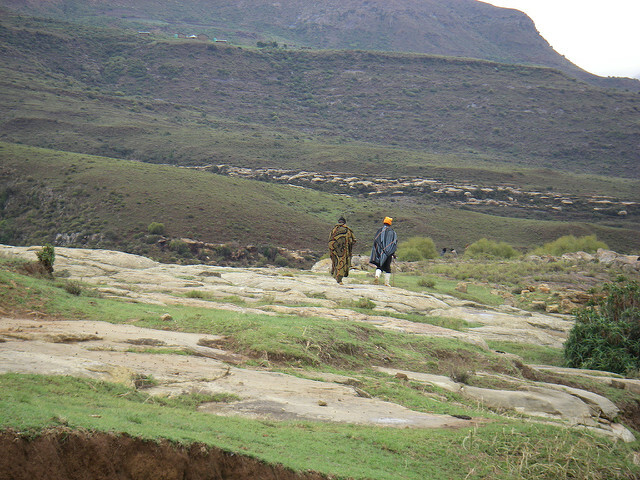 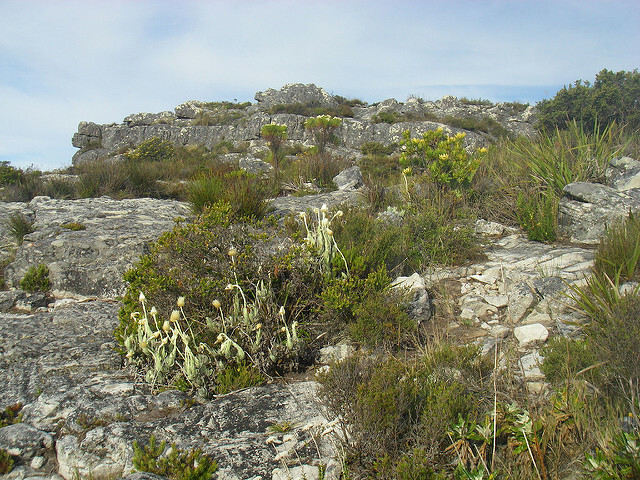 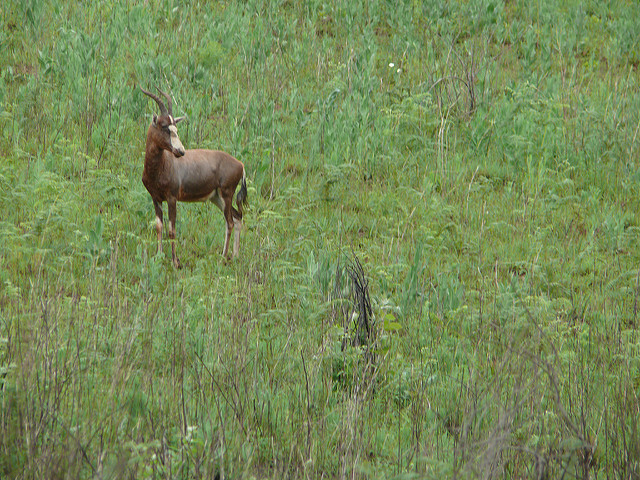 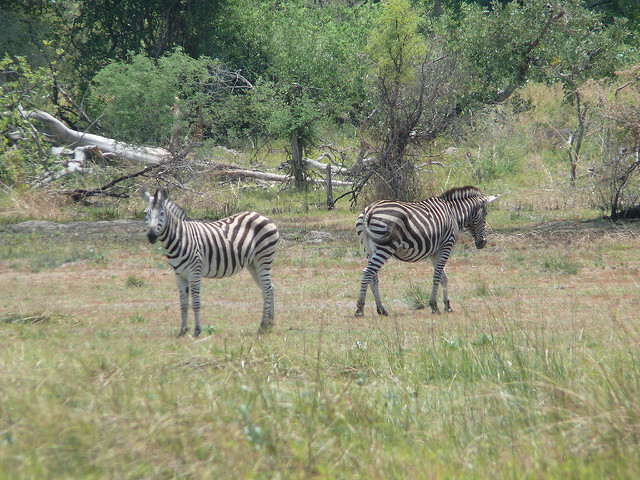 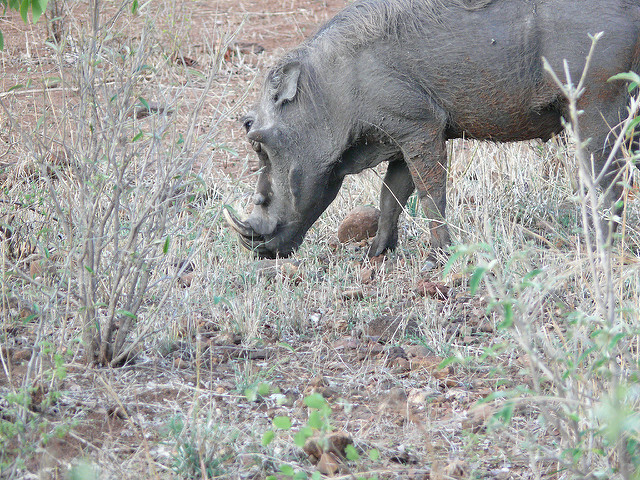 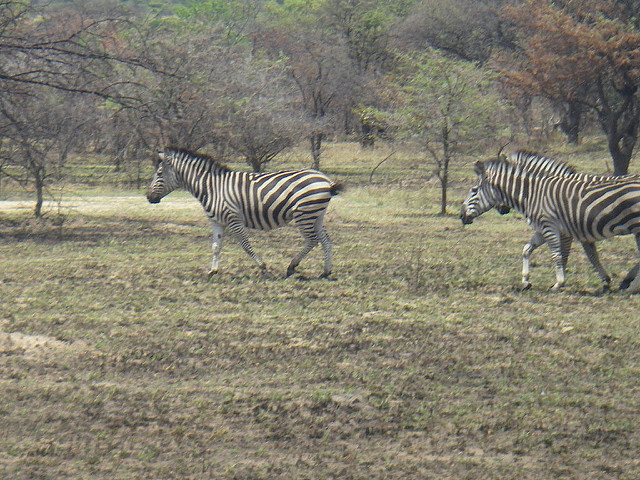 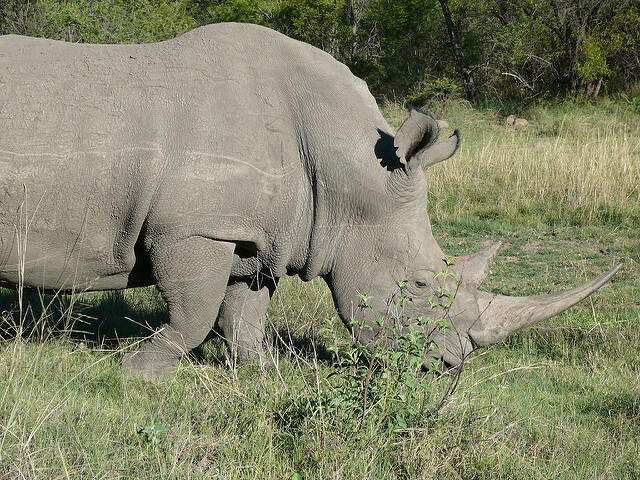 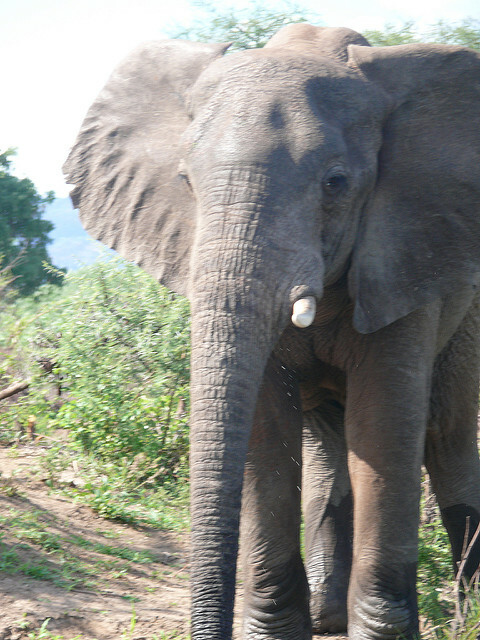 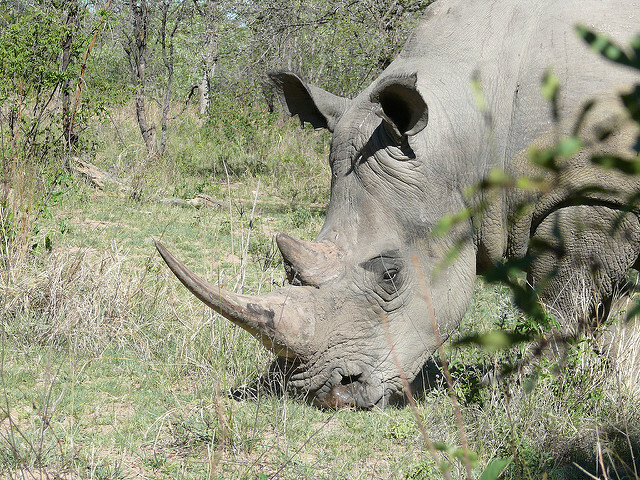 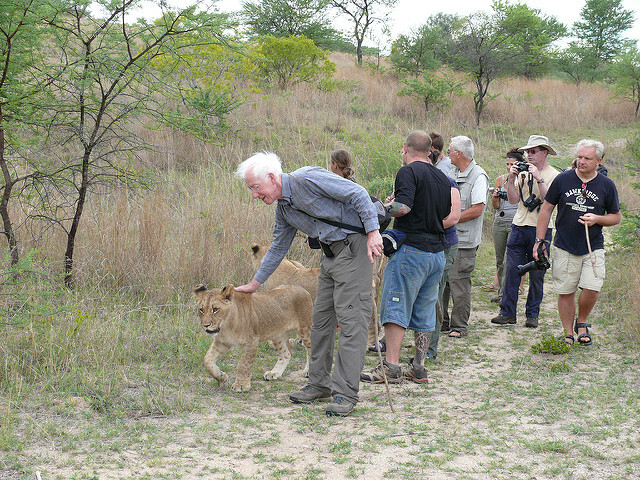 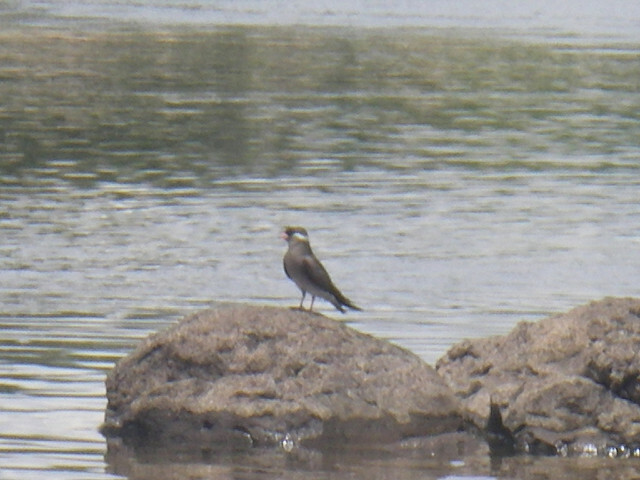 The camp site is located within a game reserve. 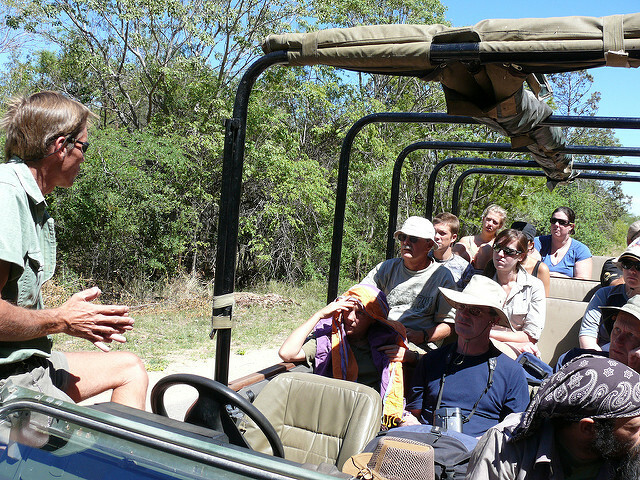 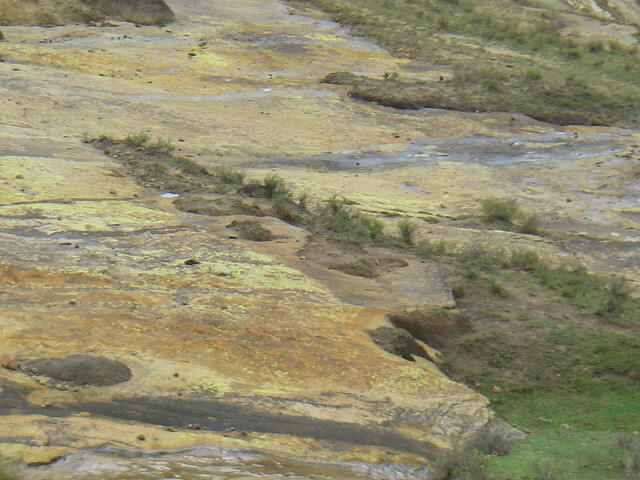 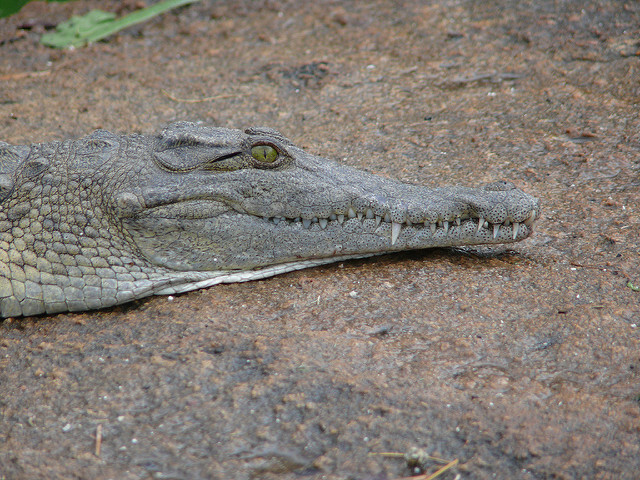 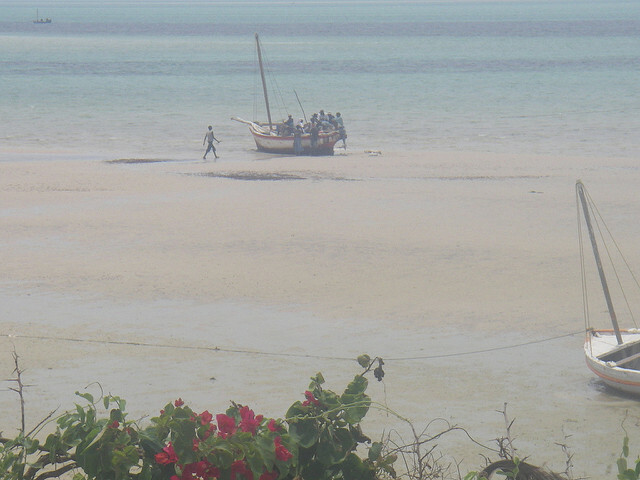 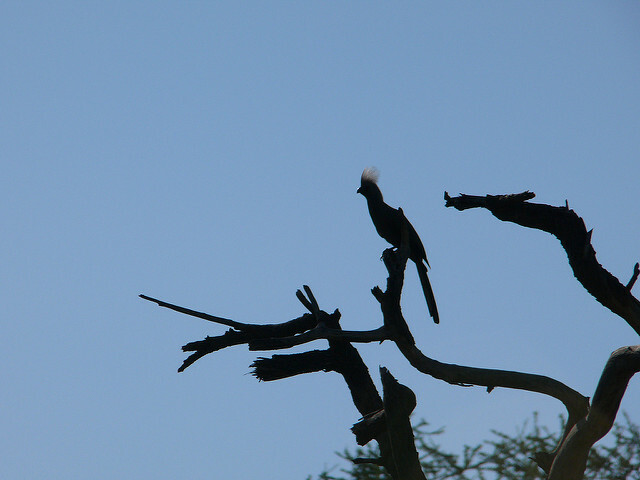 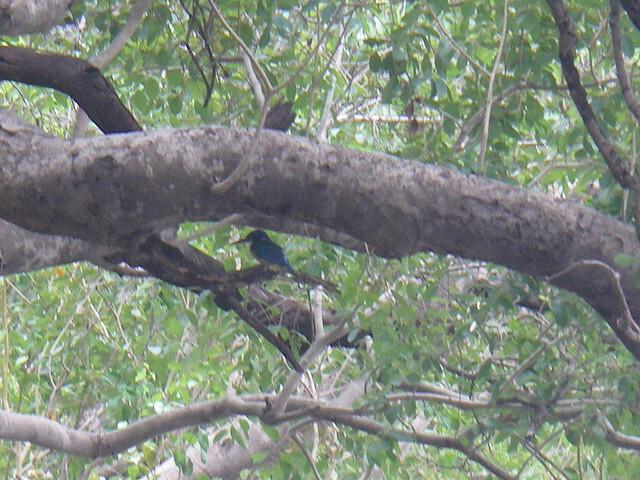 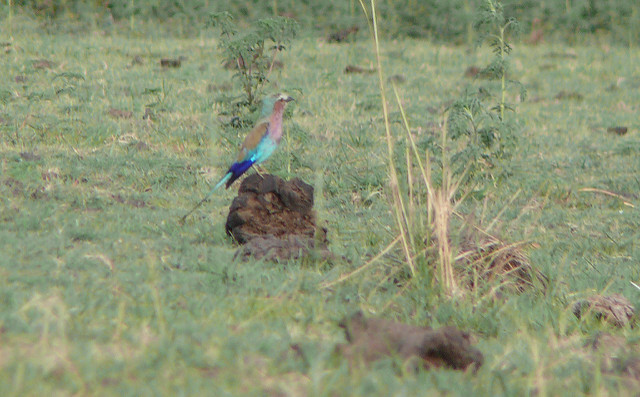 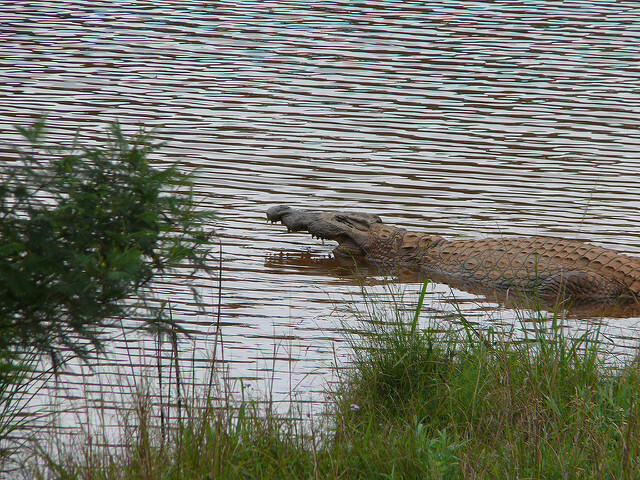 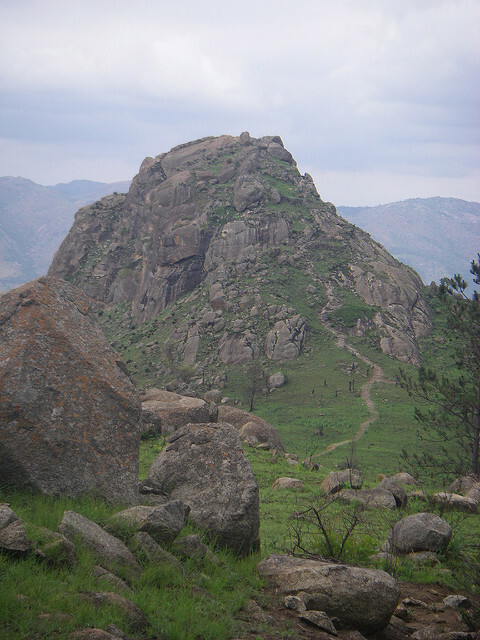 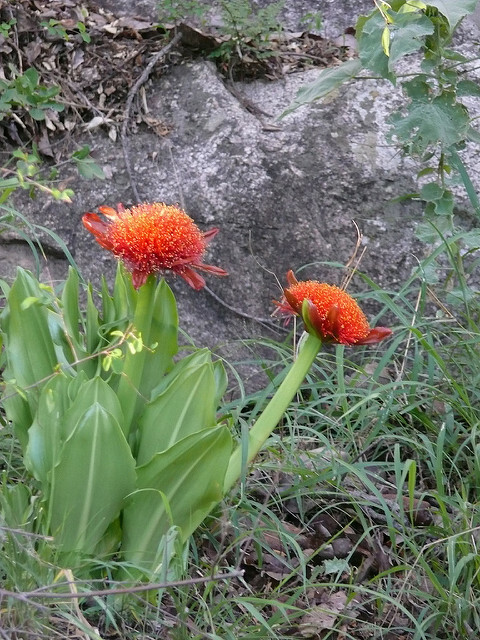 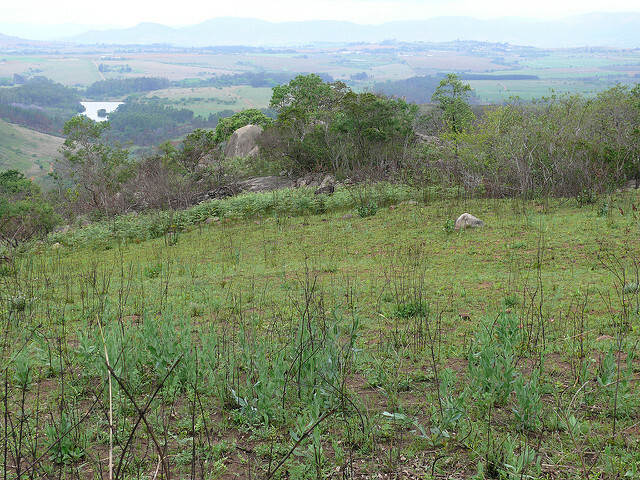 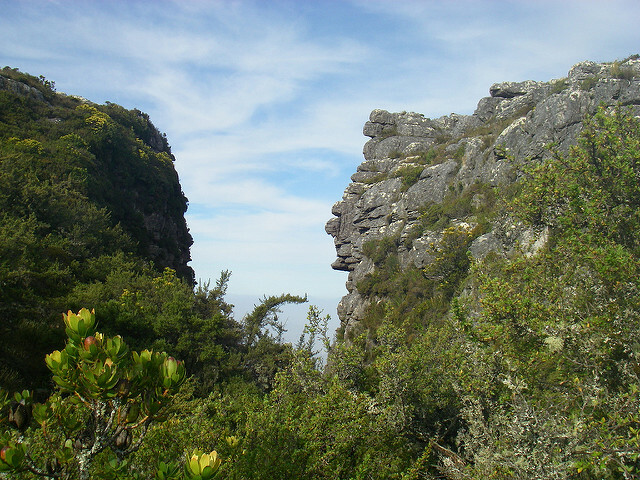 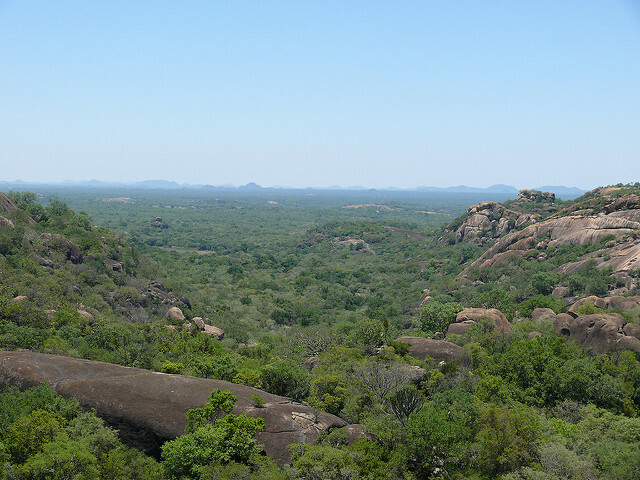 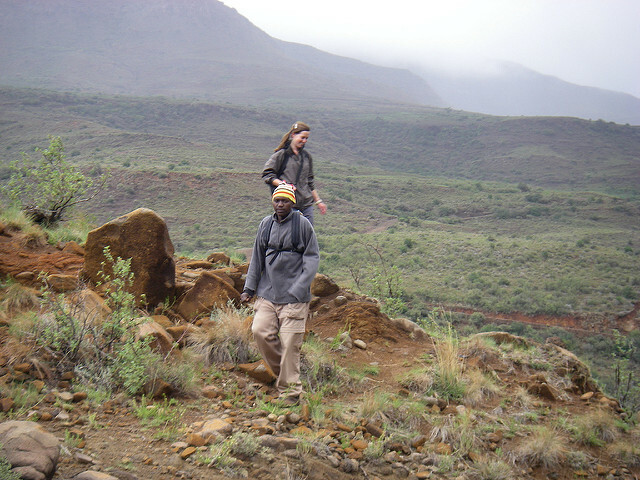 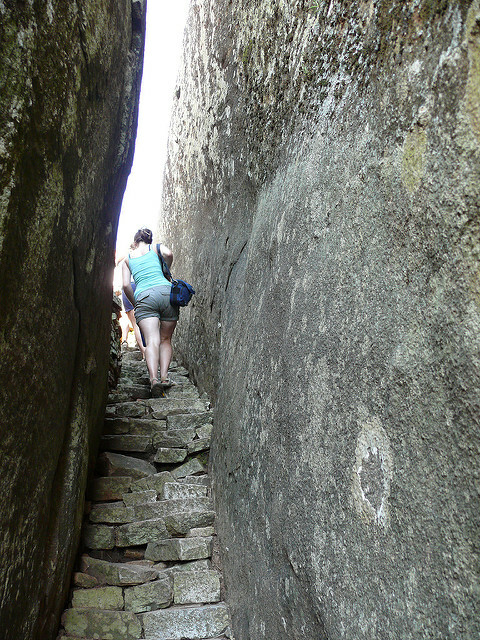 The day was spent walking in the reserve seeing the animals including a trek up to Execution Rock. 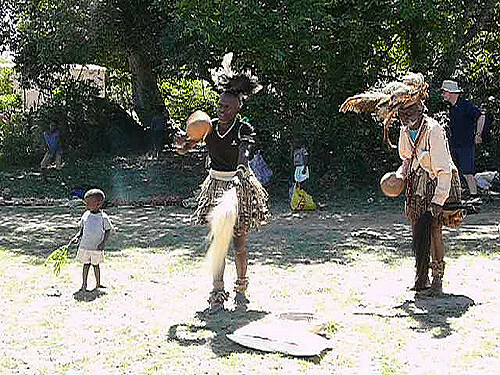 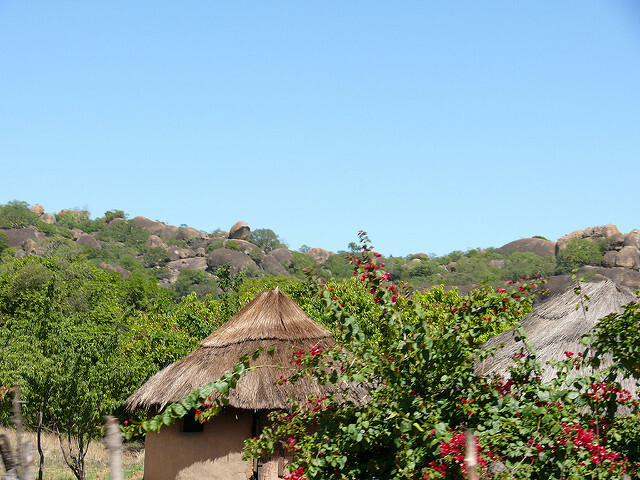 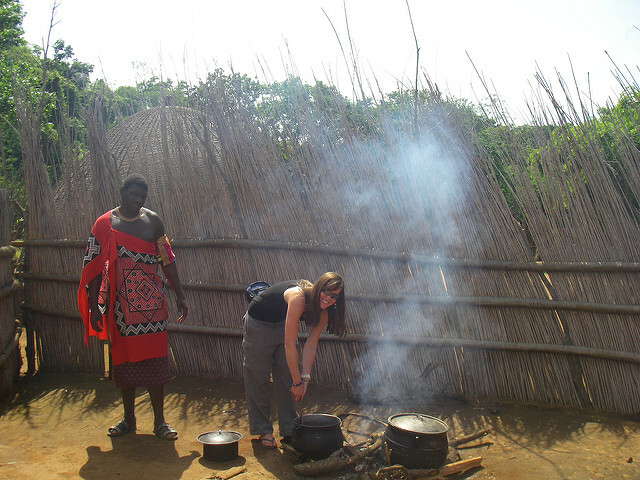 The following morning we visited a Cultural Village before our journey to Maputo. 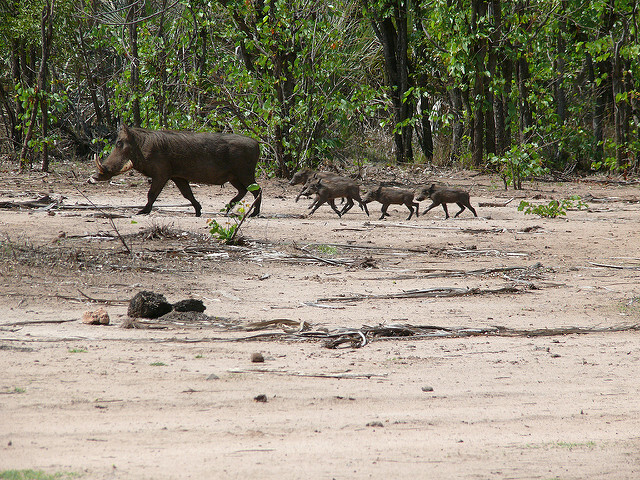 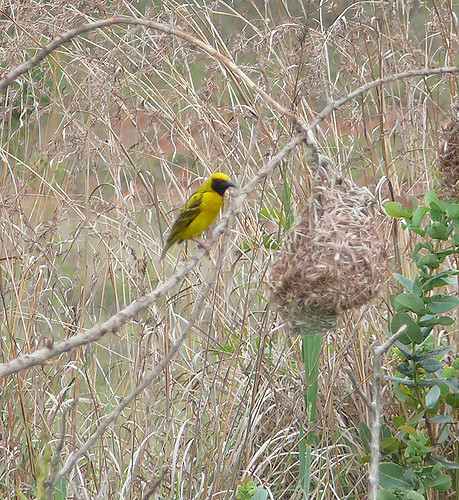 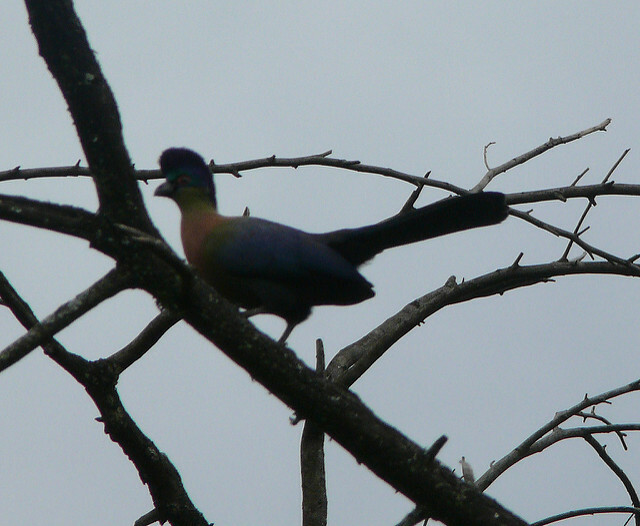 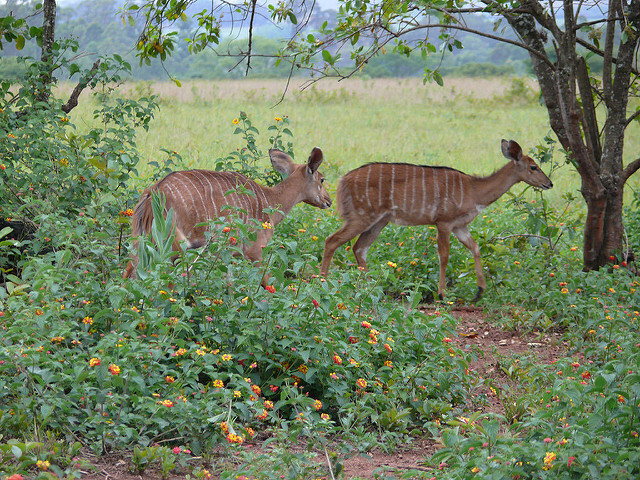 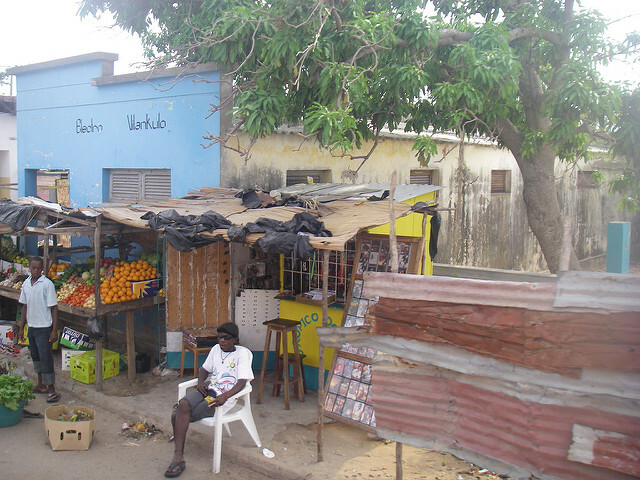 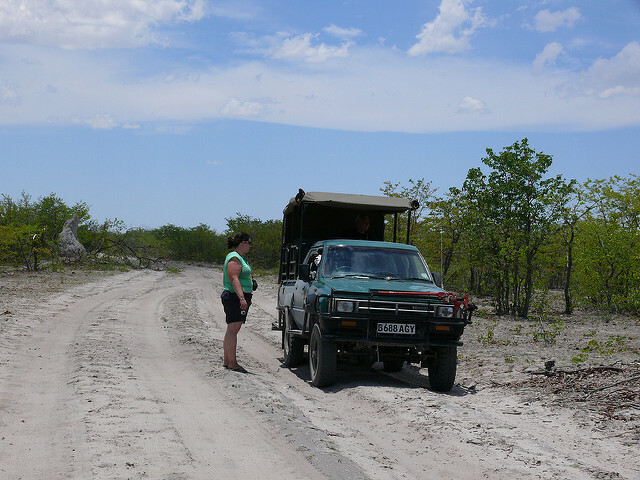 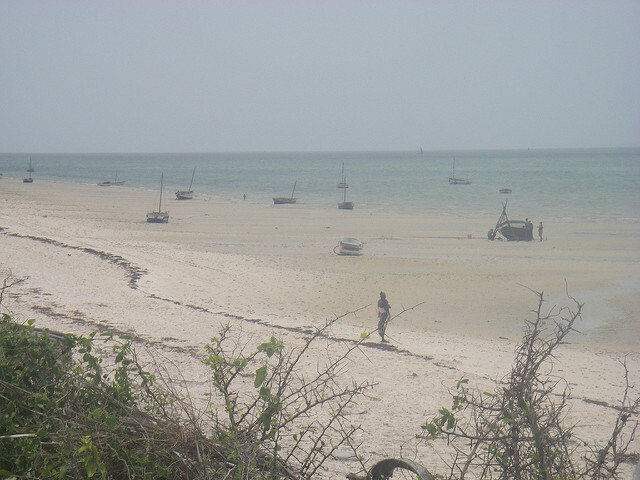 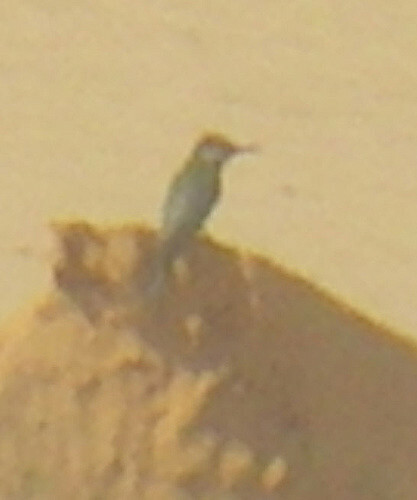 After a day in Maputo we had a long drive through bush veldt to the small beach resort of Tofo. 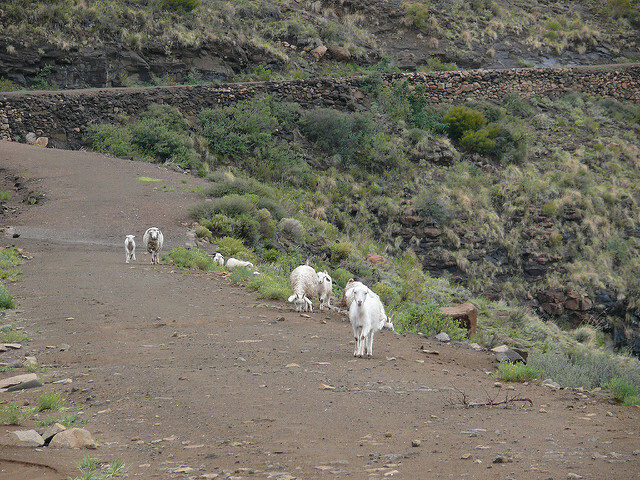 Our next stop was further up the coast, after a long drive, to Villanclulos. 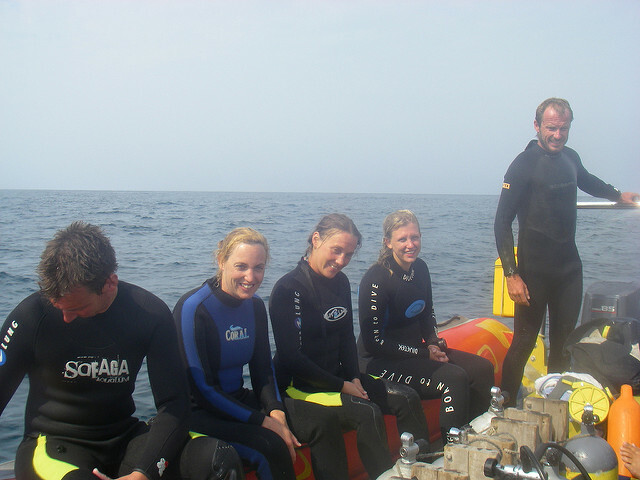 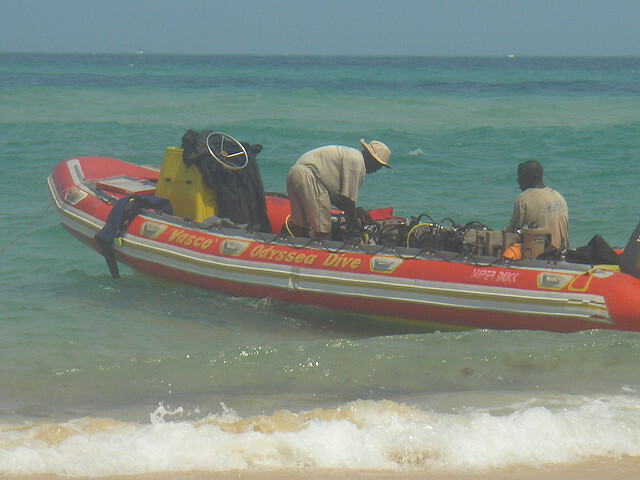 Here I had four scuba dives out at two mile reef. 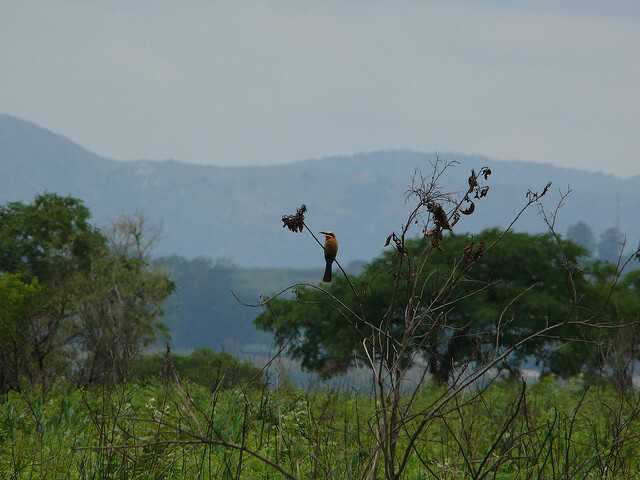 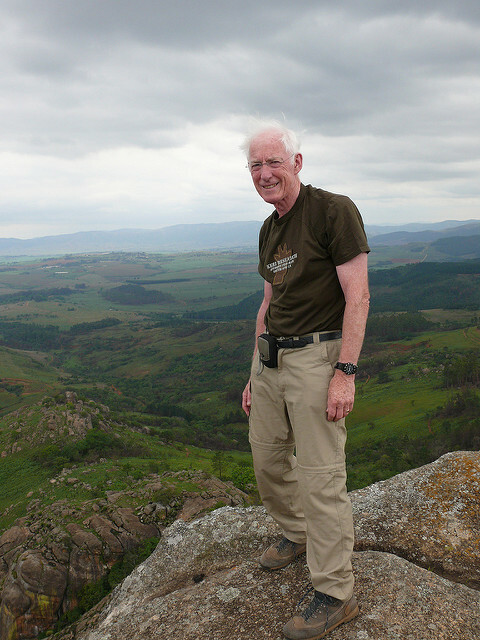 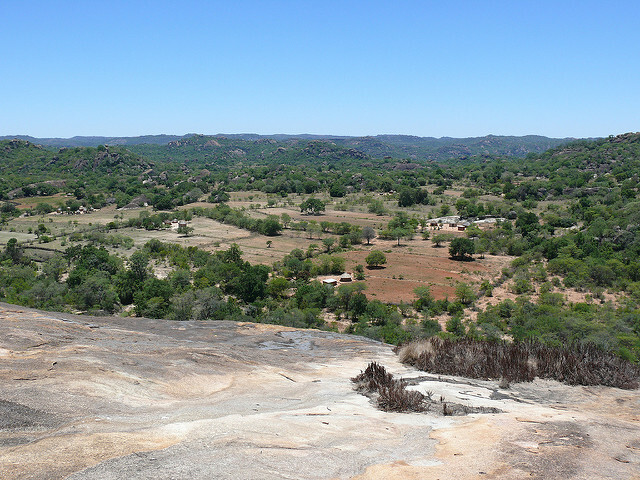 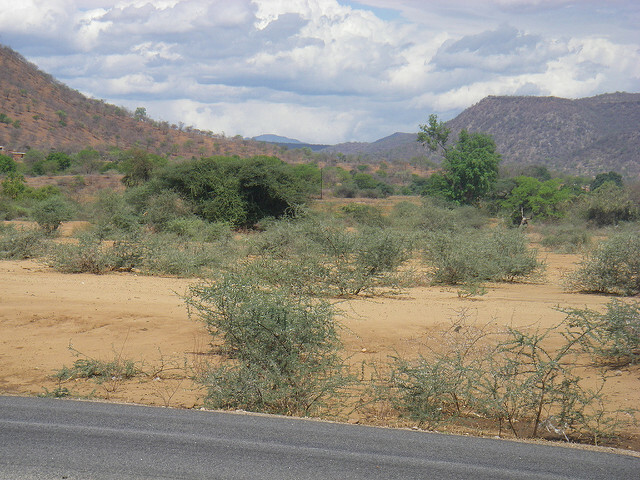 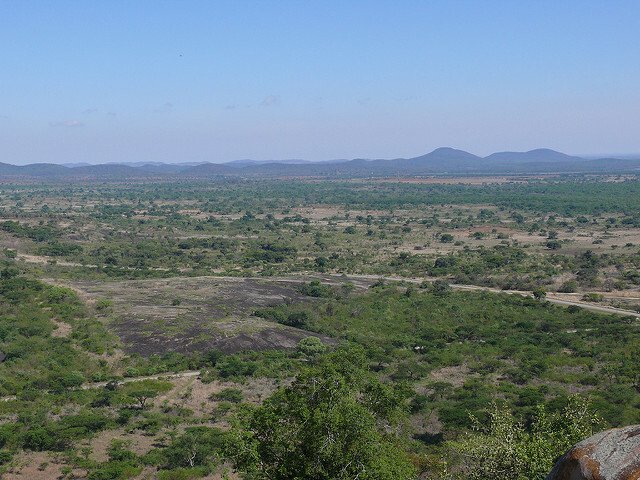 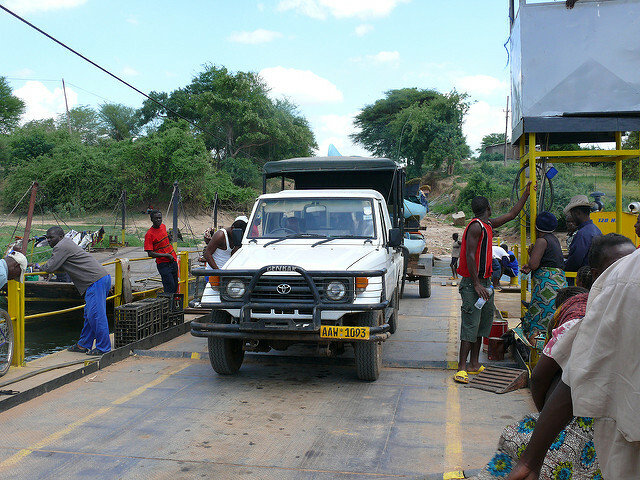 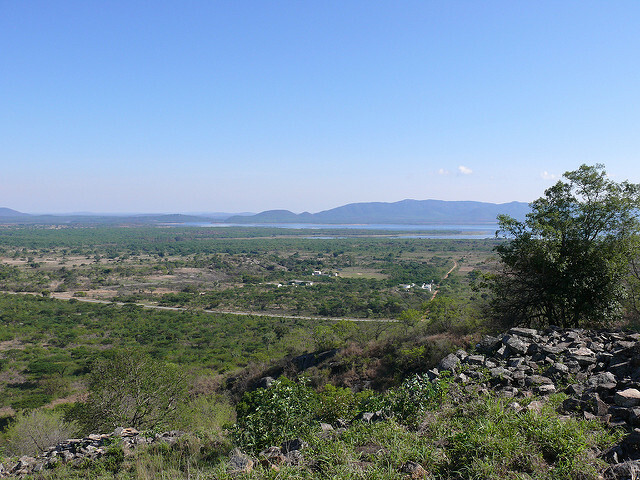 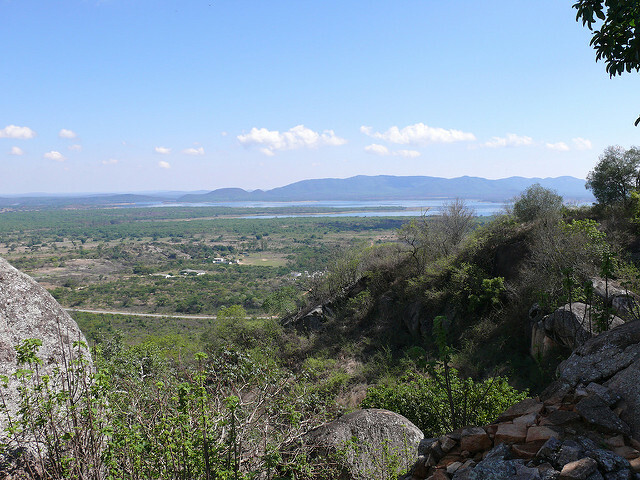 A long drive took us up the Biera corridor to camp near the Zimbabwe border. 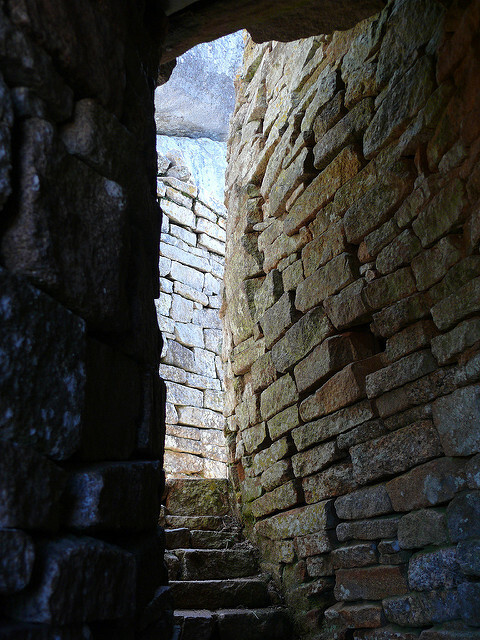 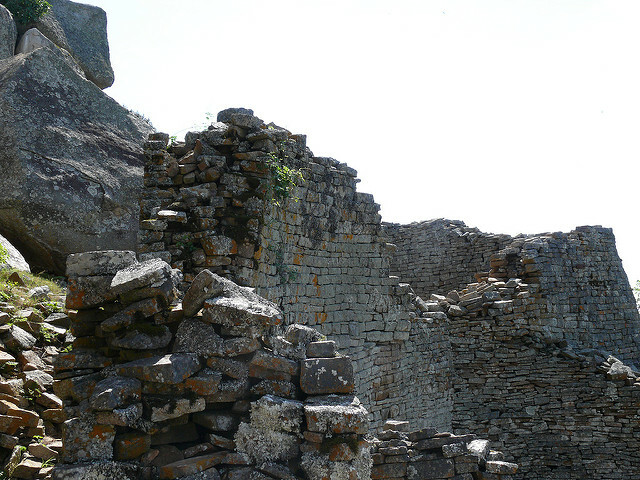 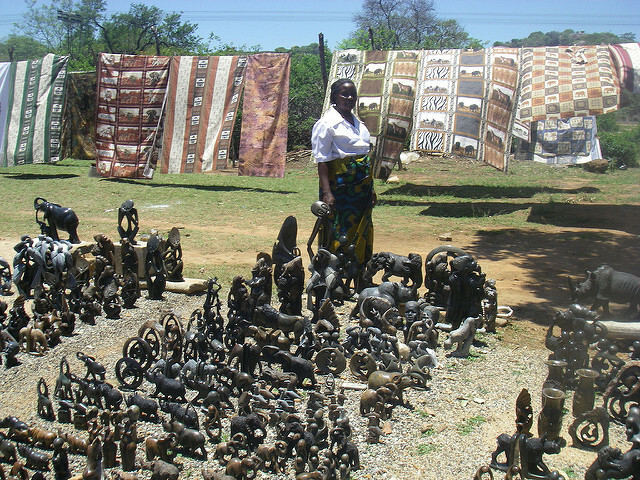 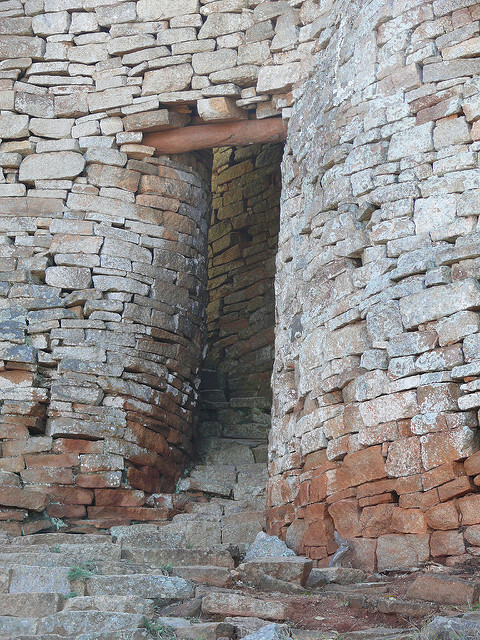 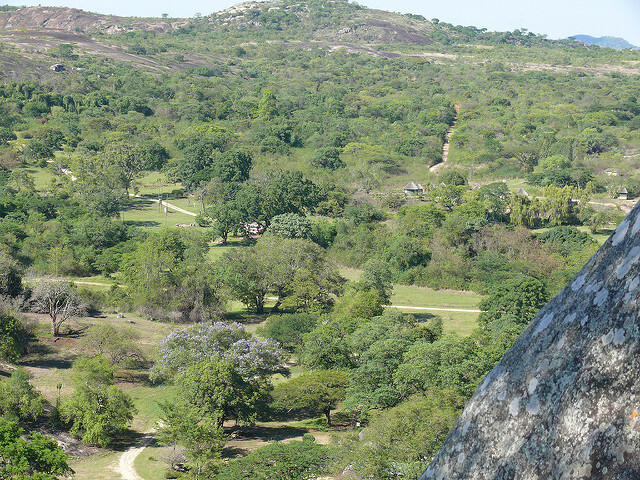 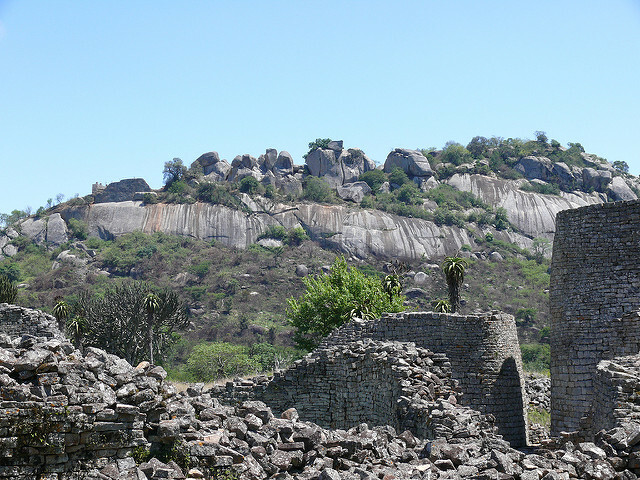 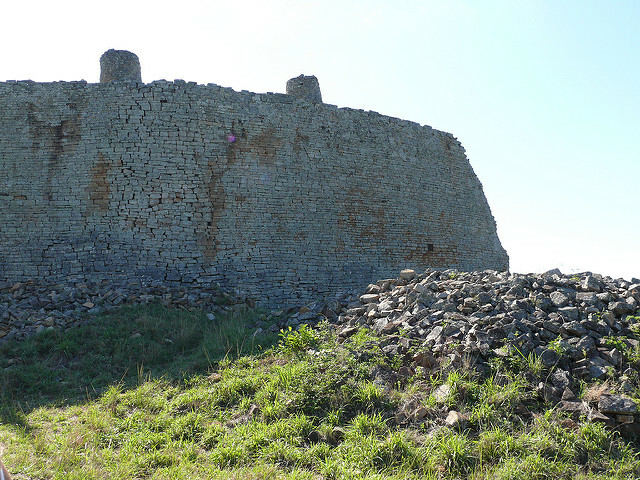 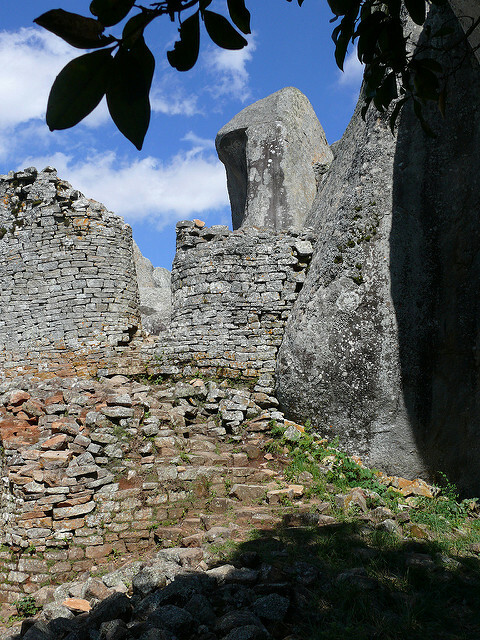 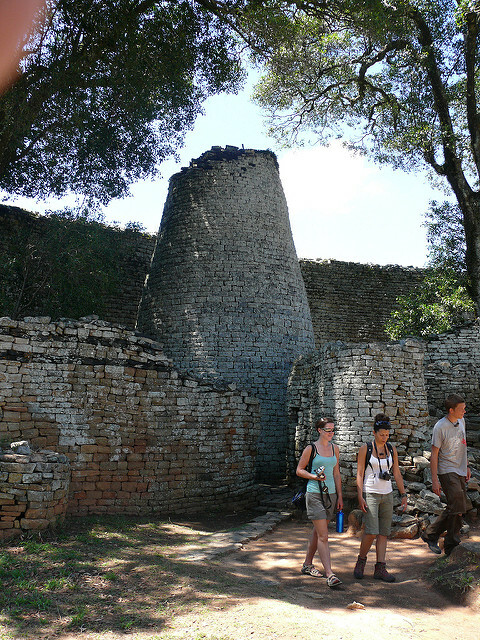 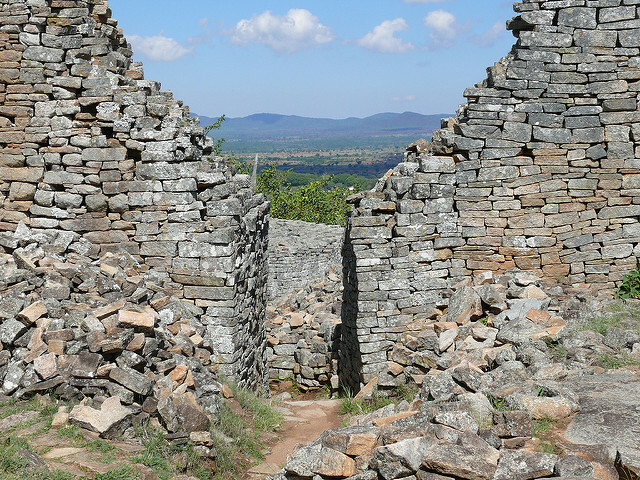 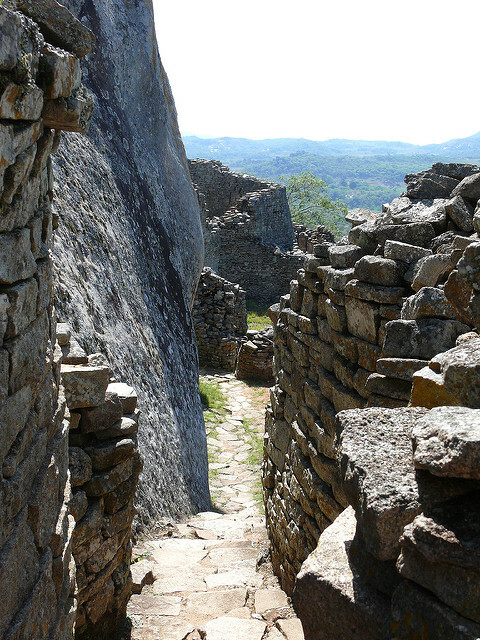 Our first visit in Zimbabwe was to the Zimbabwe Ruins. 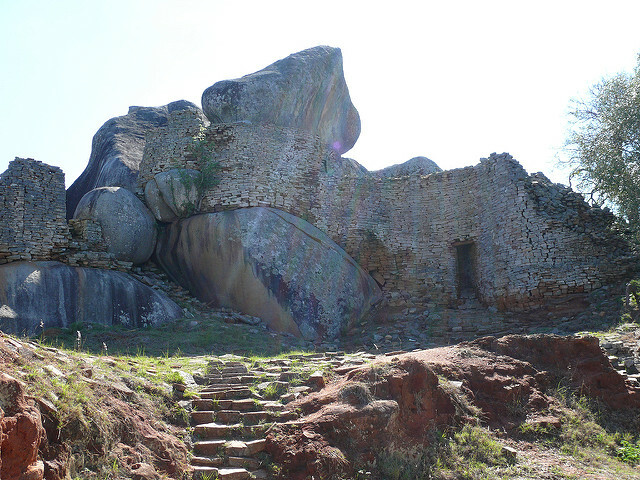 This complex was started in the thirteenth century, took about 200 years to complete and was occupied for 300 years. 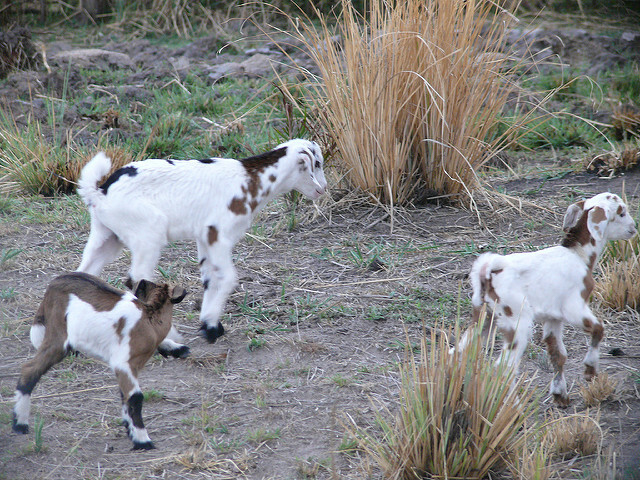 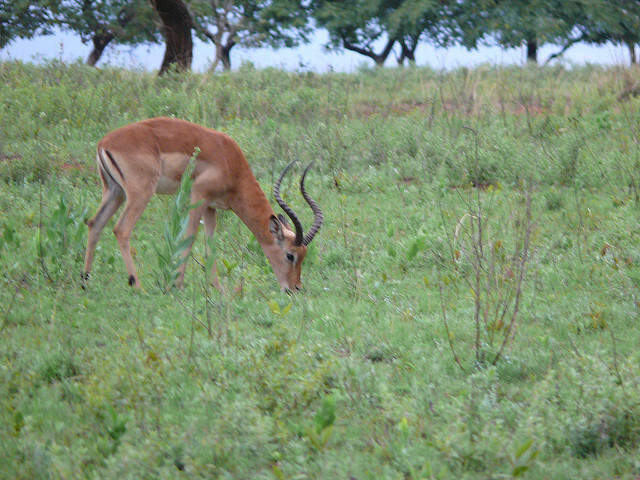 At Gweru we stayed at a nice lodge called Antelope Park. 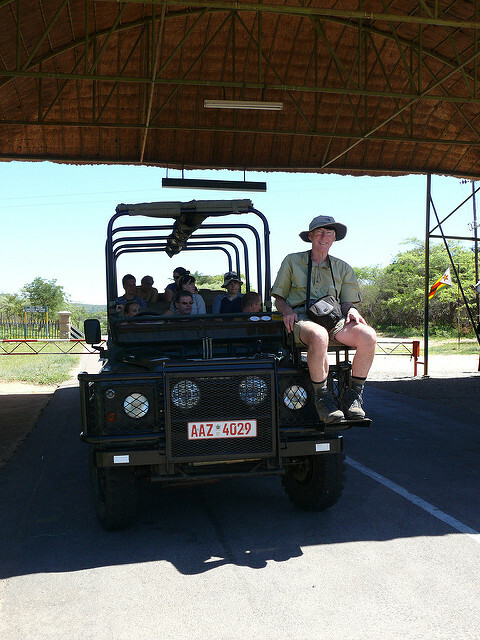 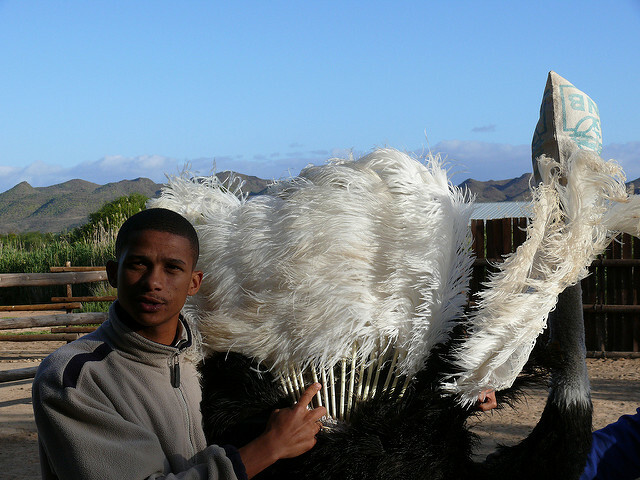 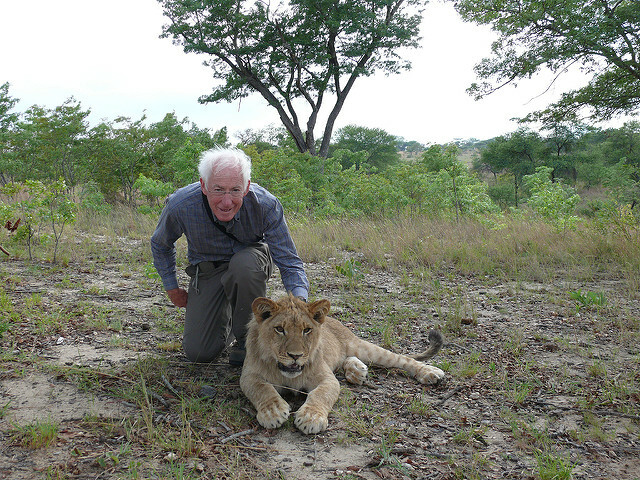 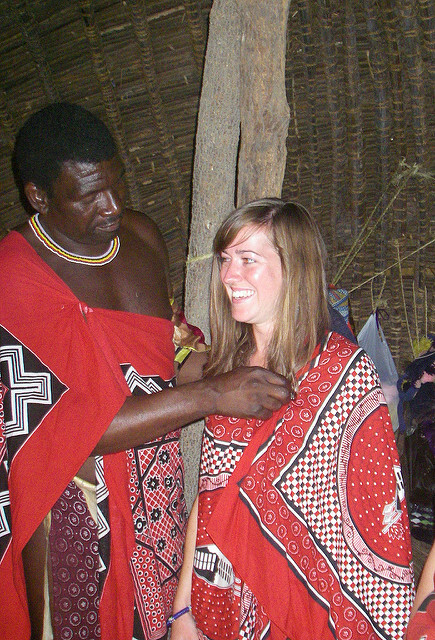 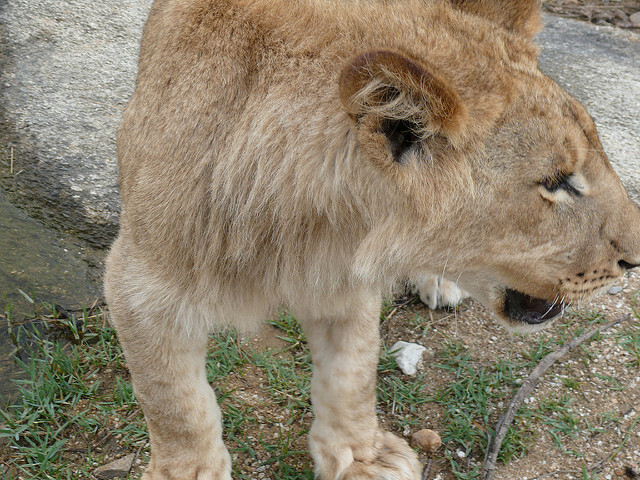 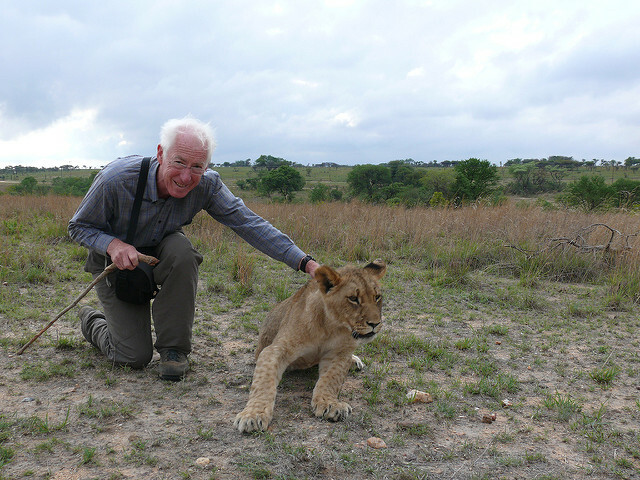 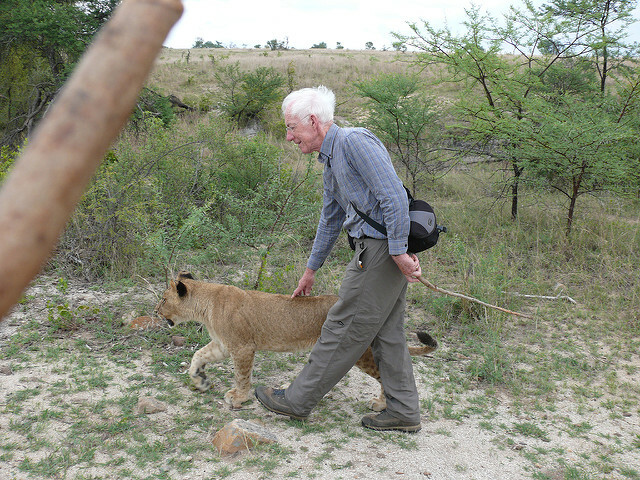 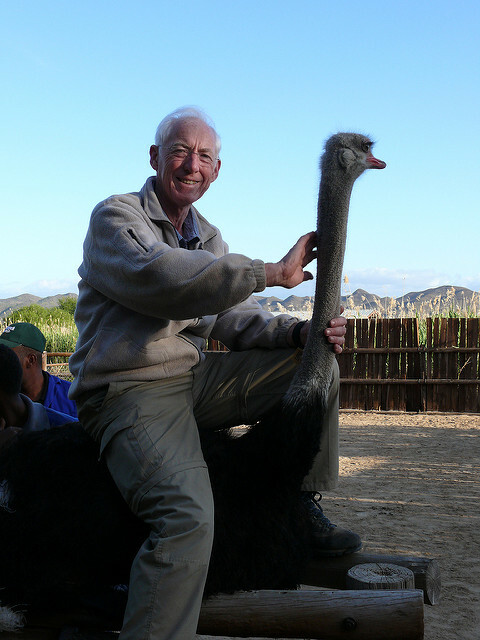 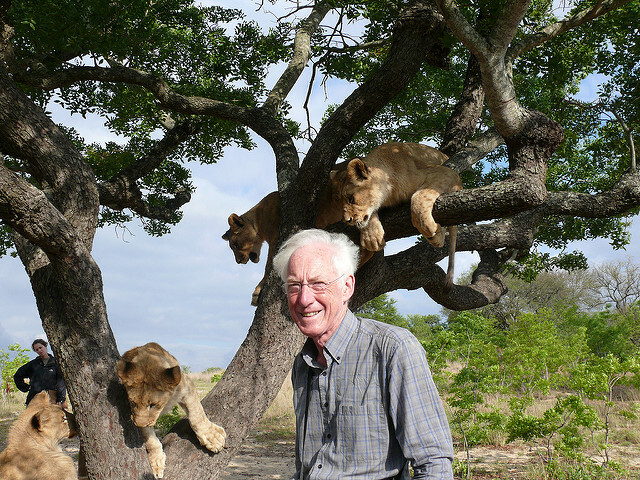 The activities I did included walking with Lions, horse ride to view the animals and a night stalk to teach the hand bred lions how to hunt. 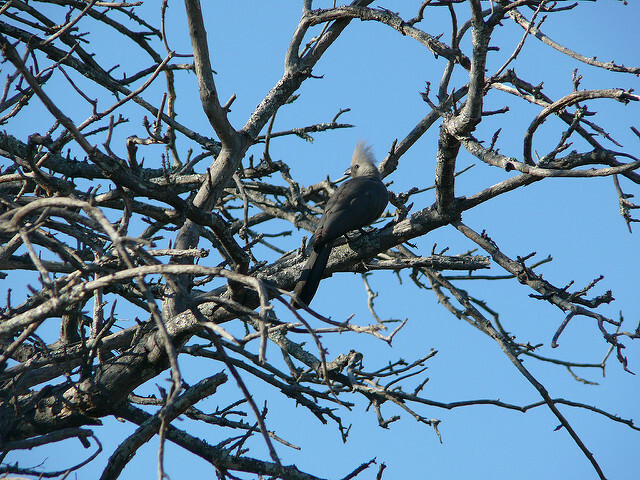 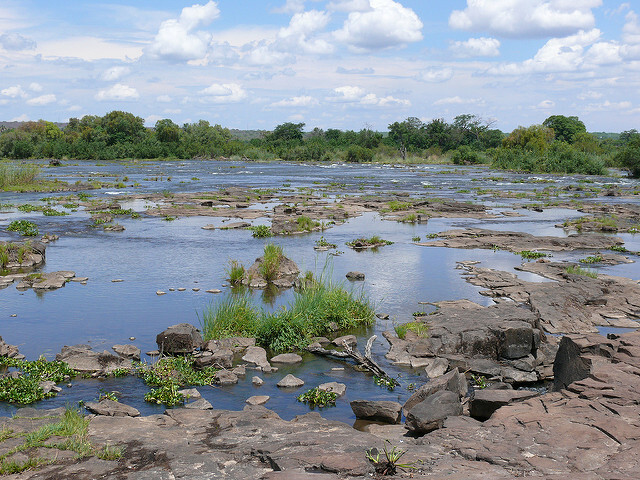 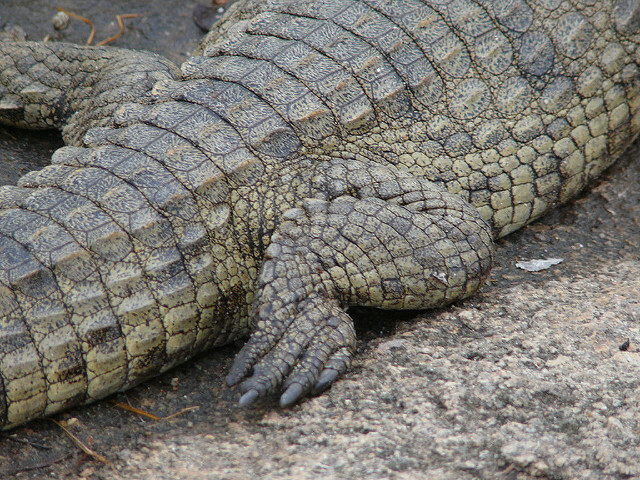 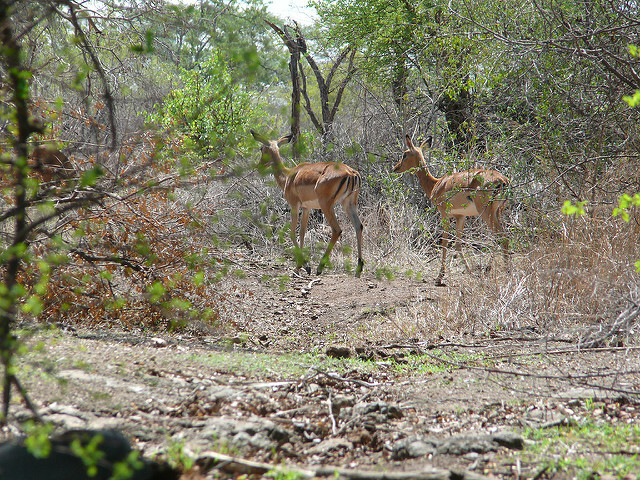 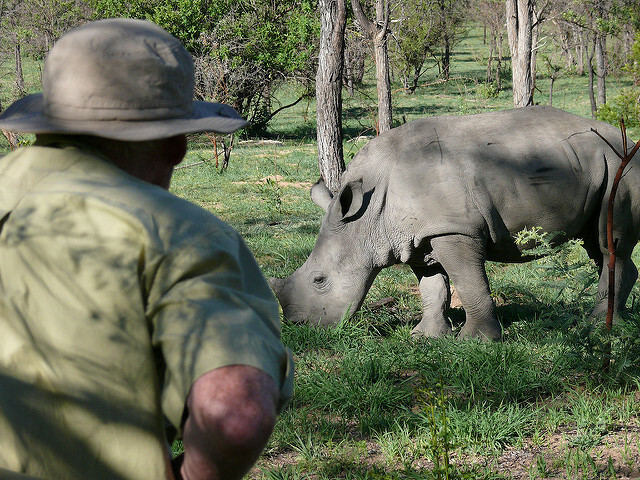 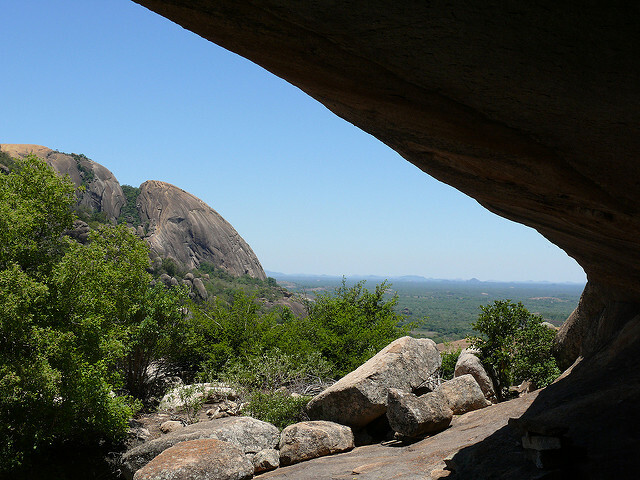 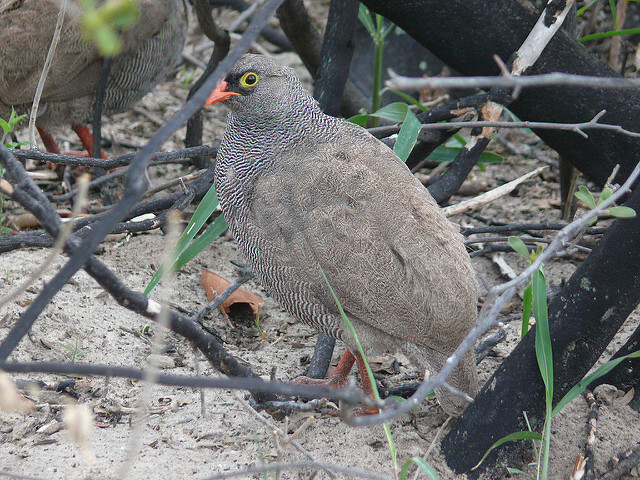 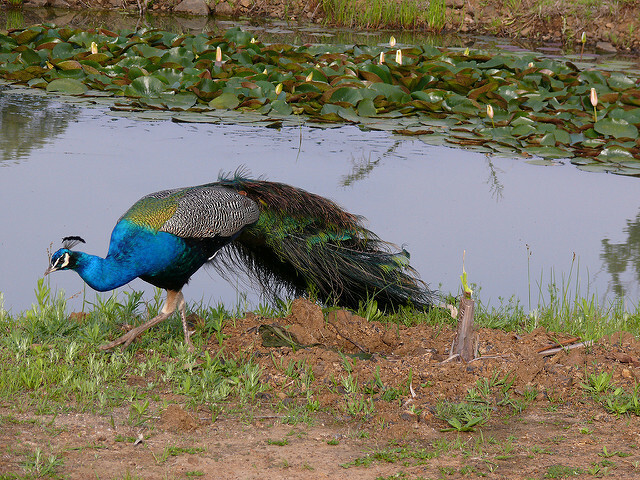 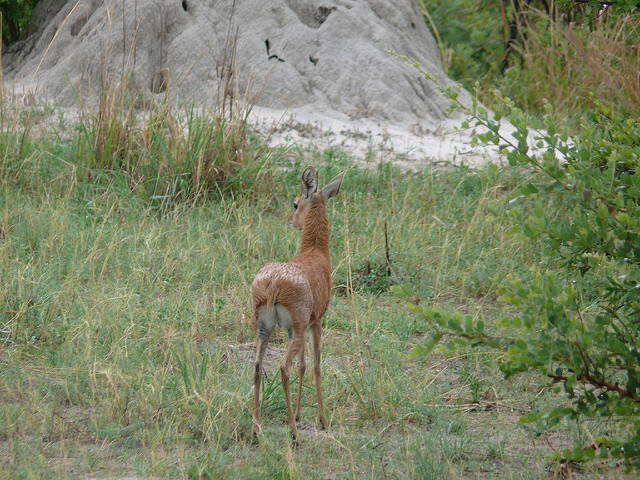 A pleasant camp in the grounds of a bungalow in the suburbs of Bulawayo gave us the chance to visit Matoba National Park. 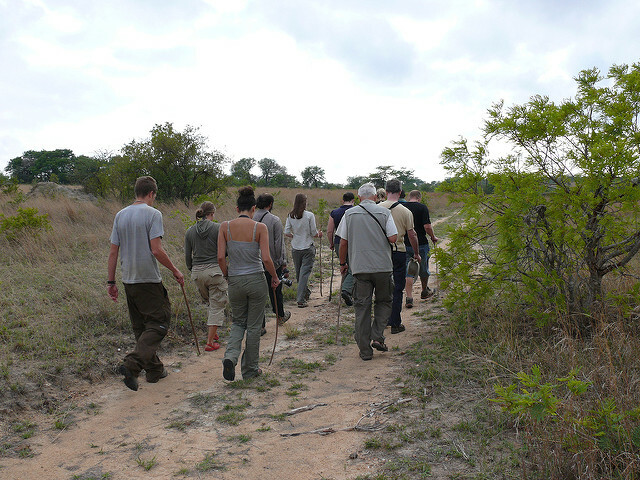 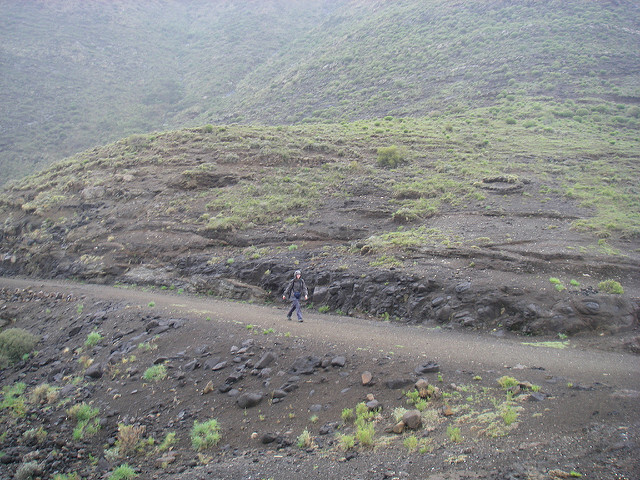 Here we walked up to some caves where there were some excellent cave paintings and a walk in to see White Rhinos. 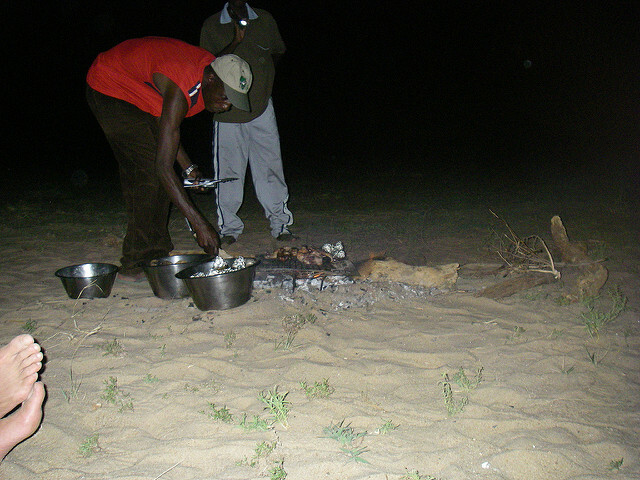 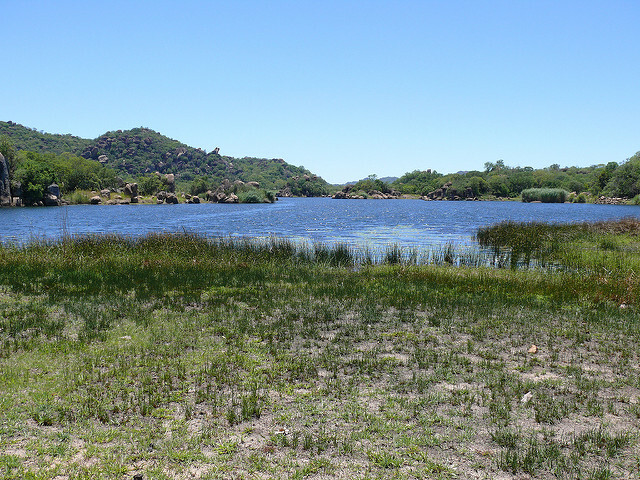 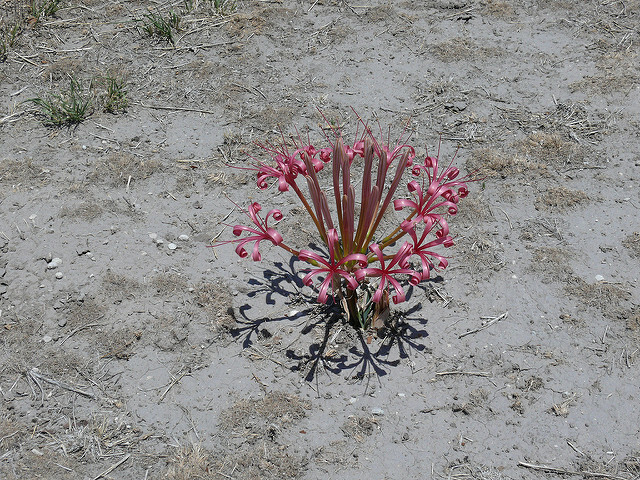 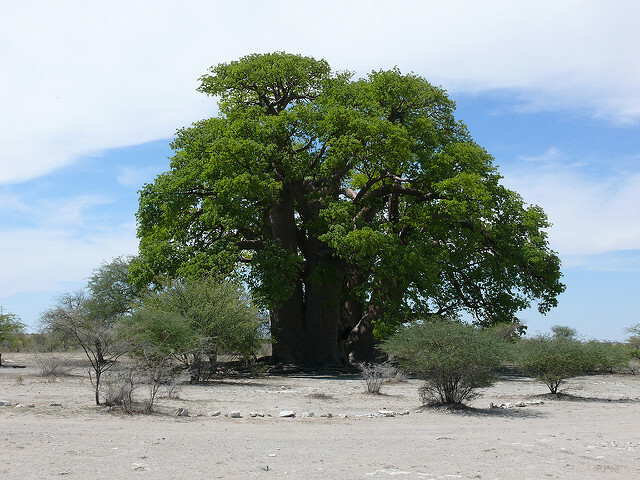 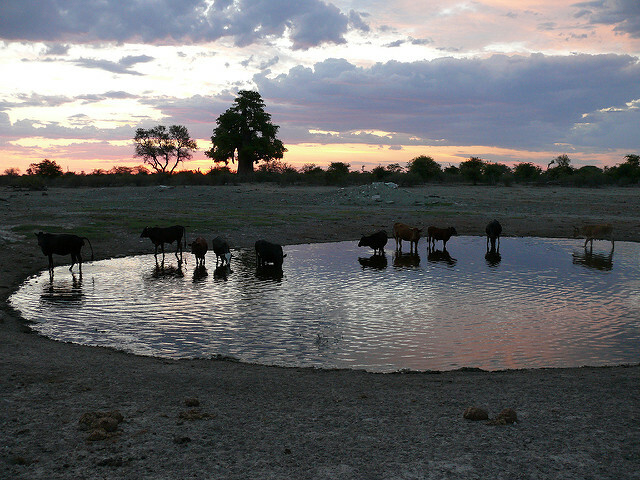 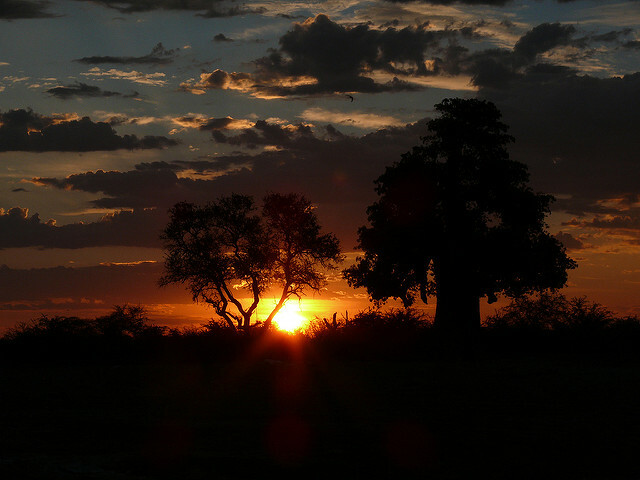 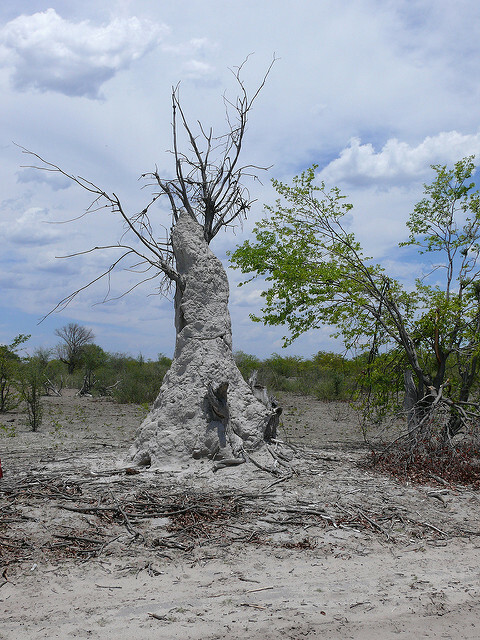 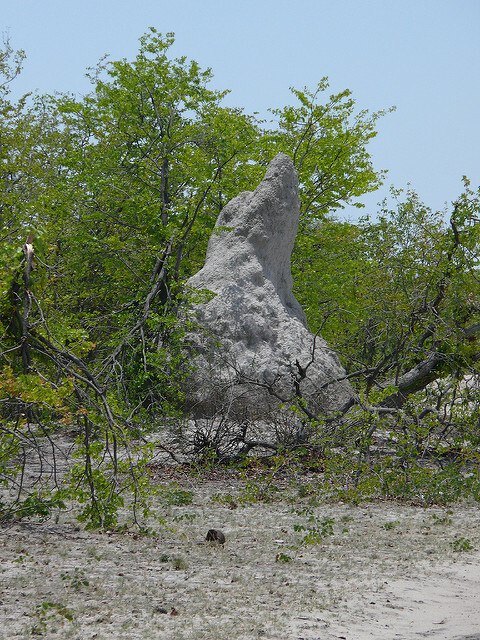 Next stop was Planet Baobab, a camp between Francistown and Chobe. 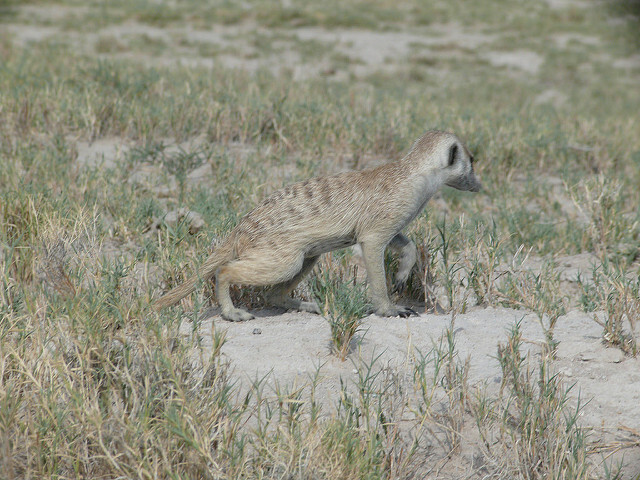 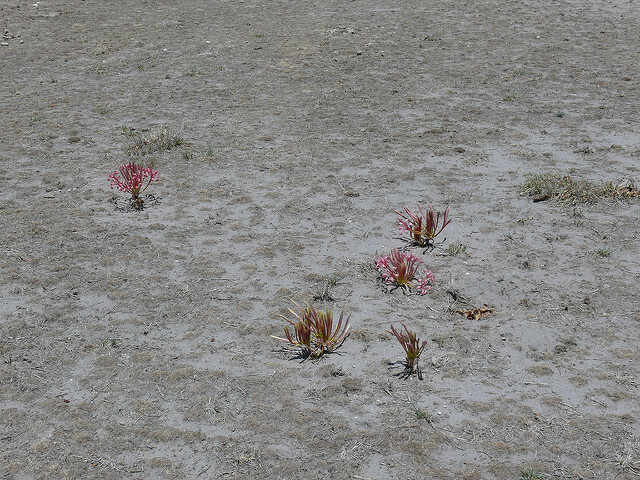 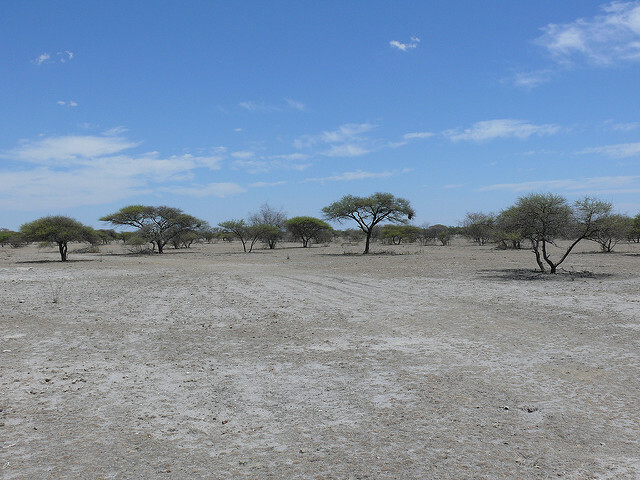 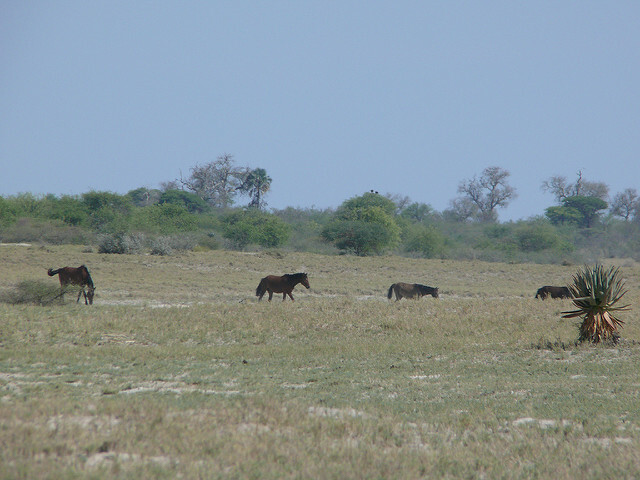 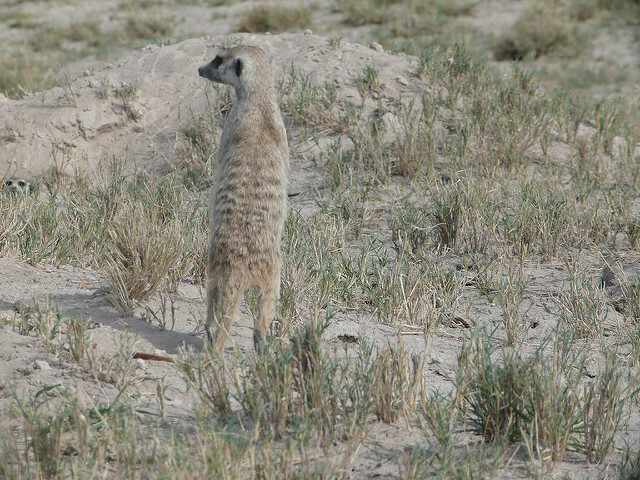 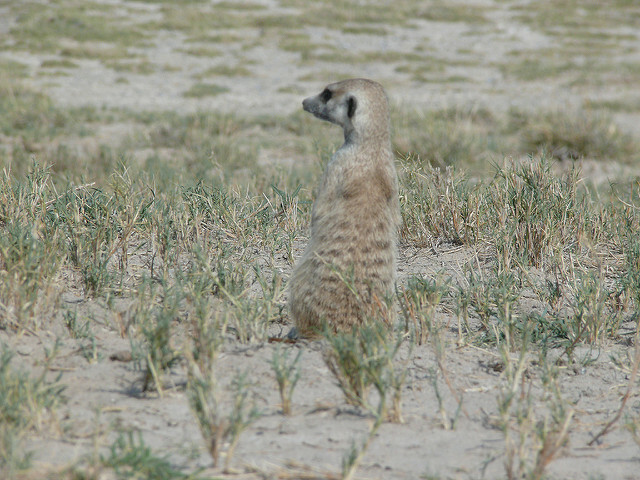 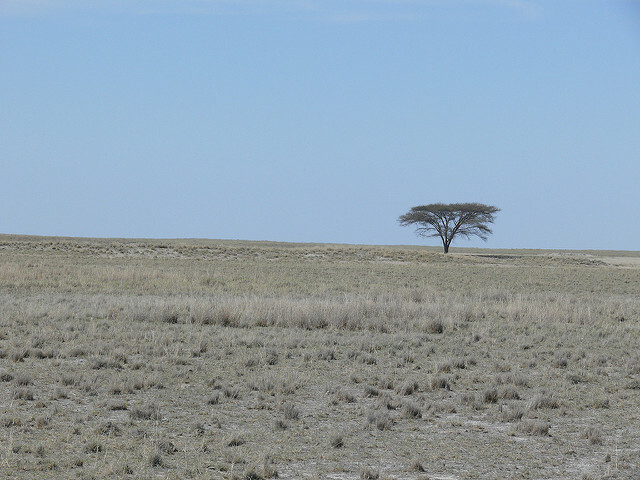 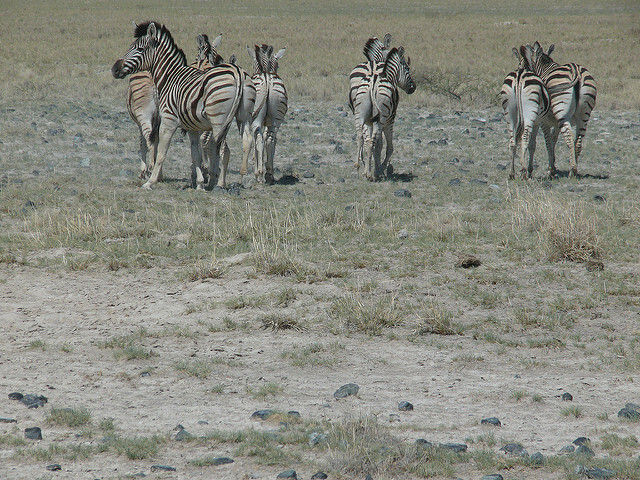 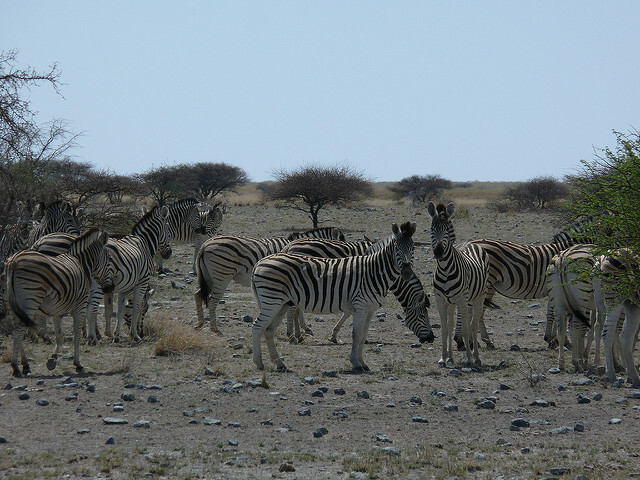 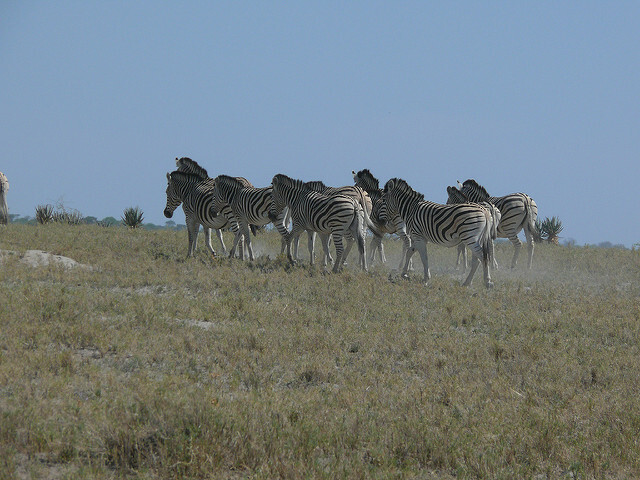 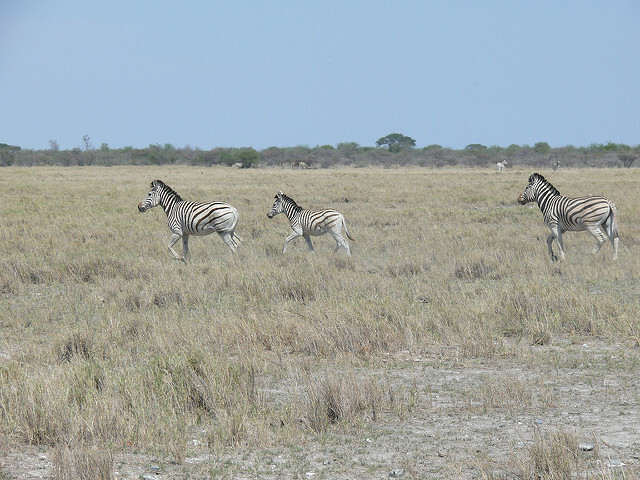 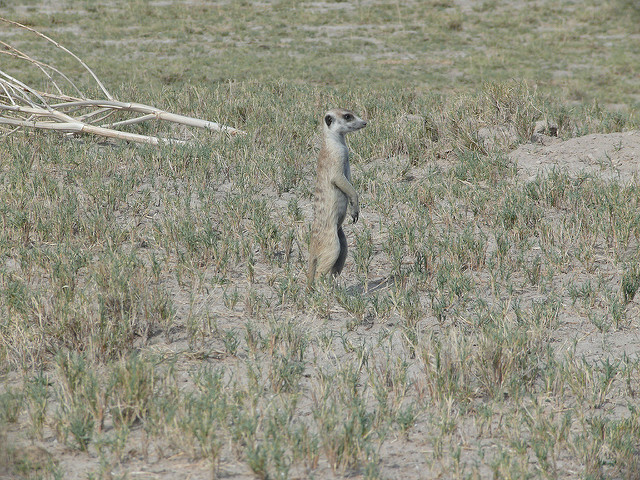 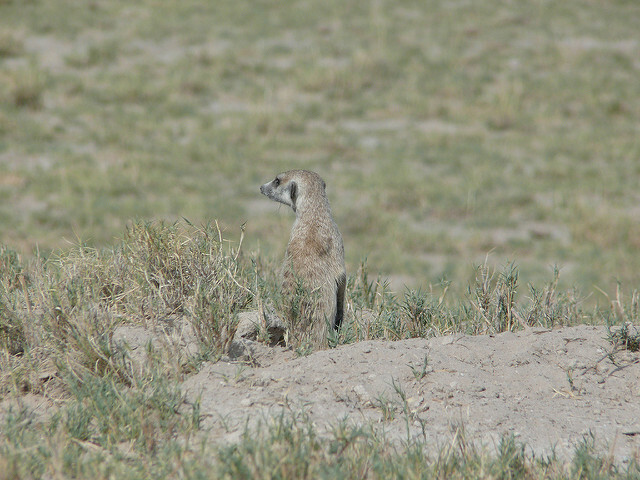 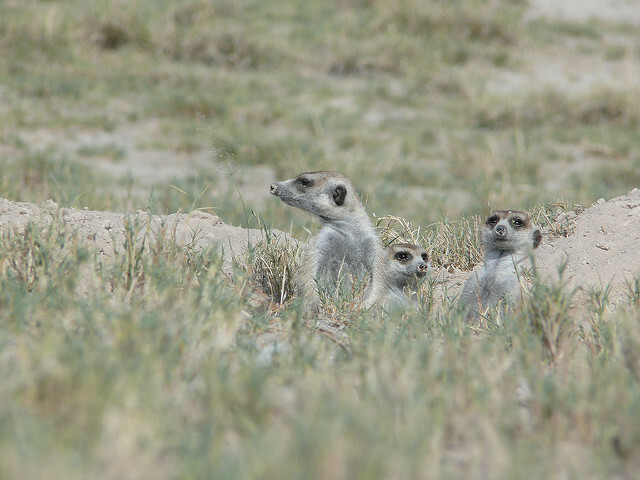 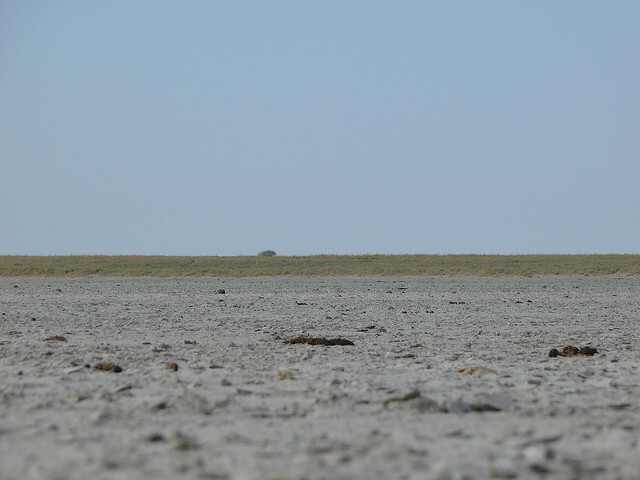 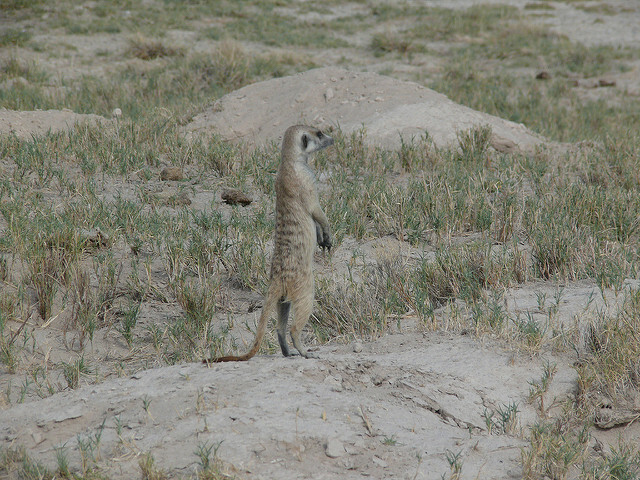 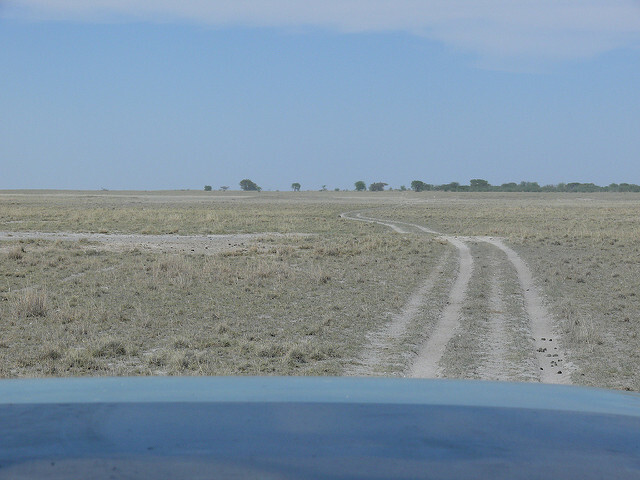 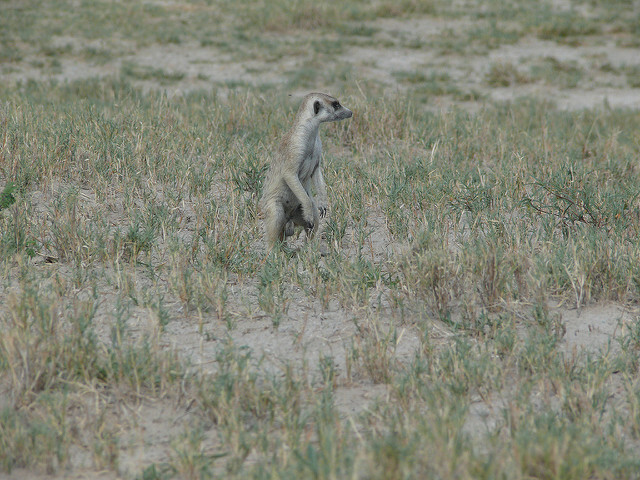 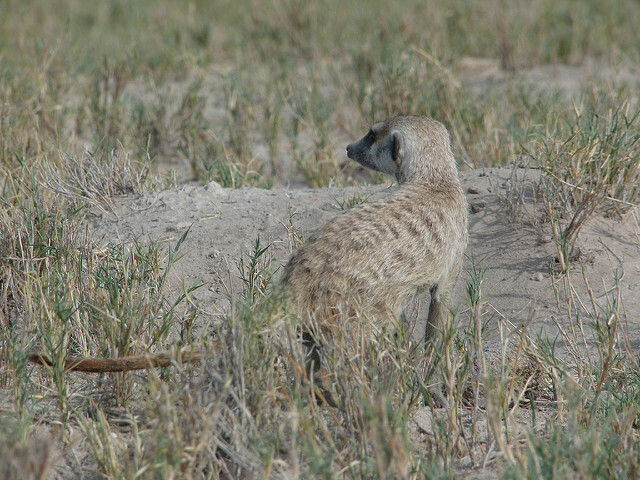 A trip to the Makgadikgadi Pans gave a few of us the chance to Mere Cats and large numbers of Zebra. 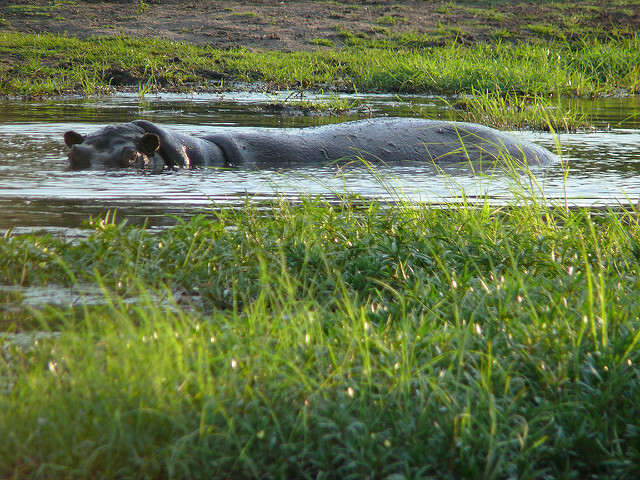 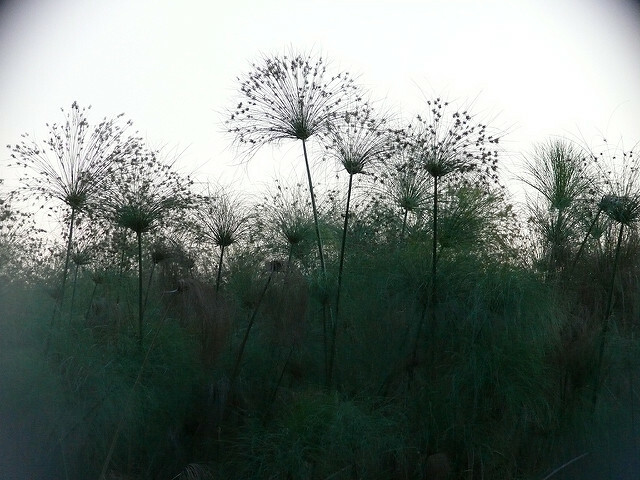 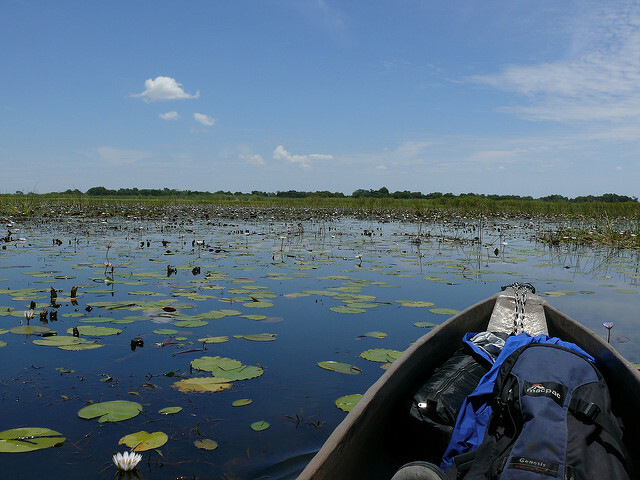 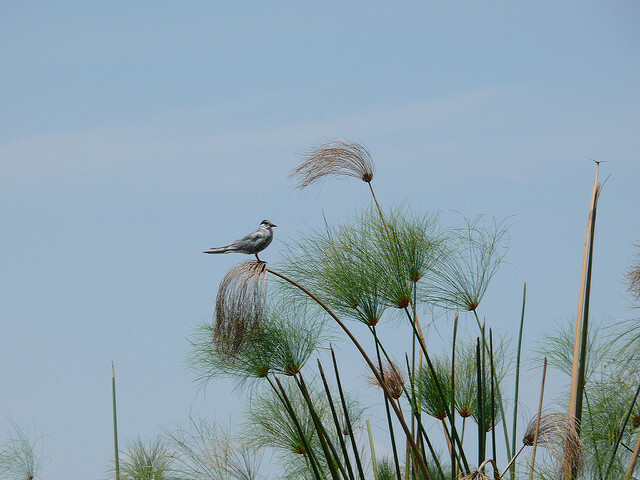 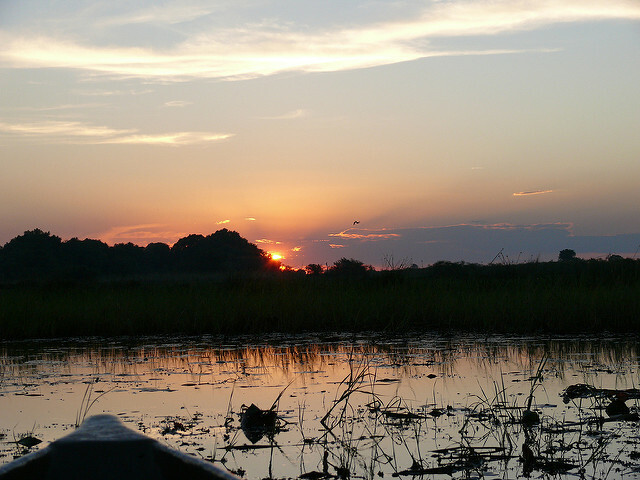 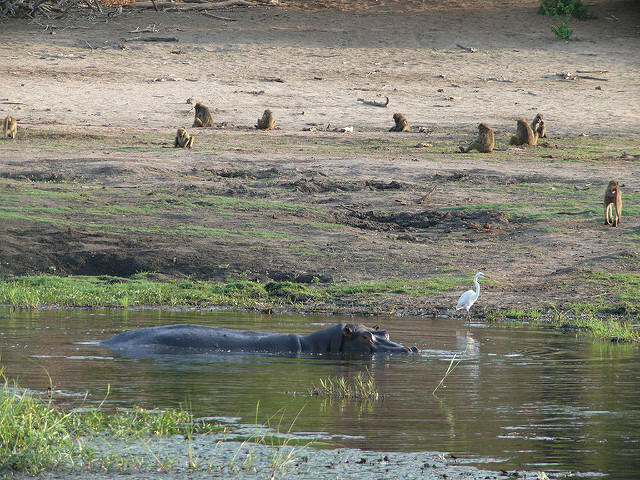 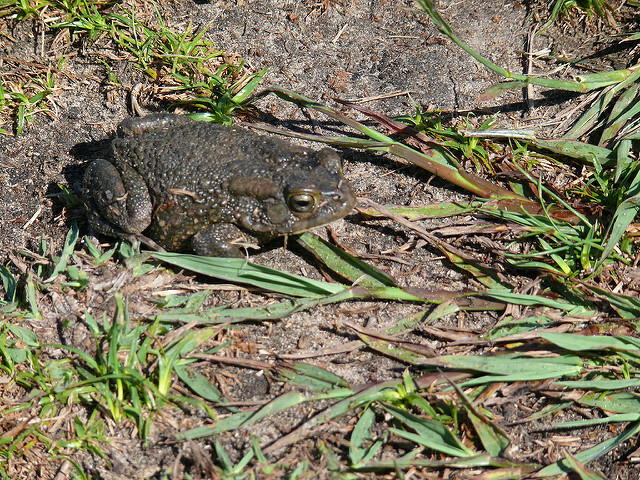 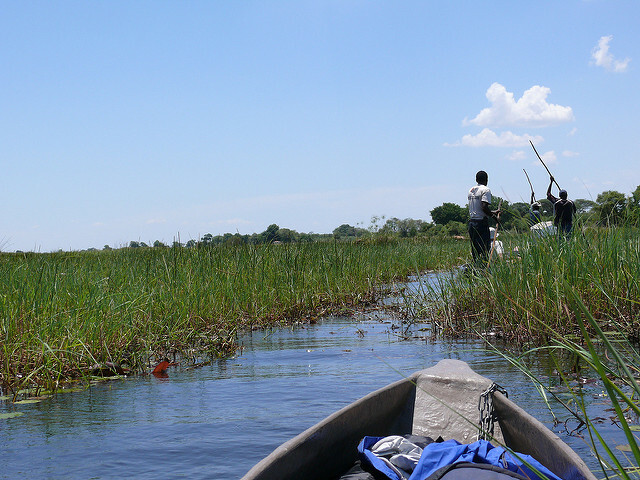 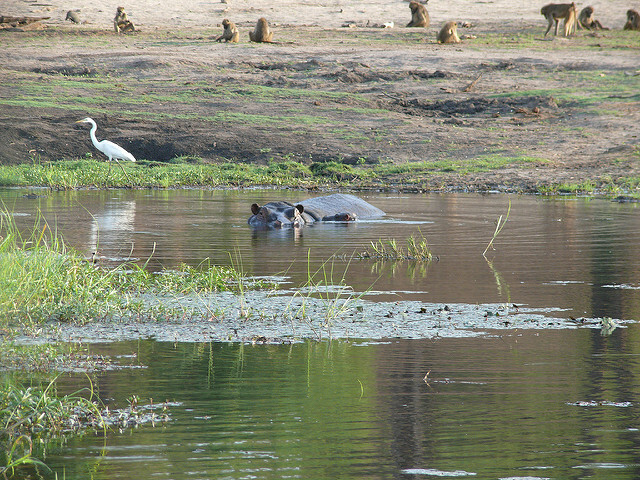 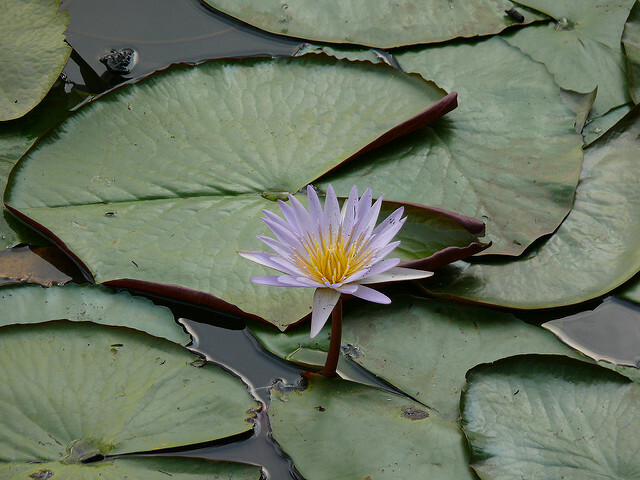 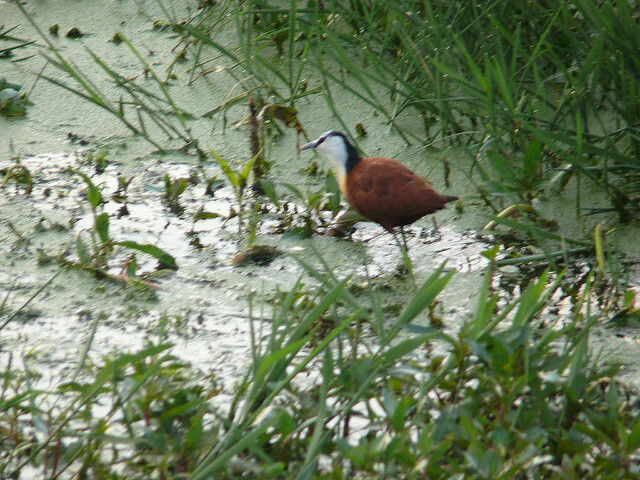 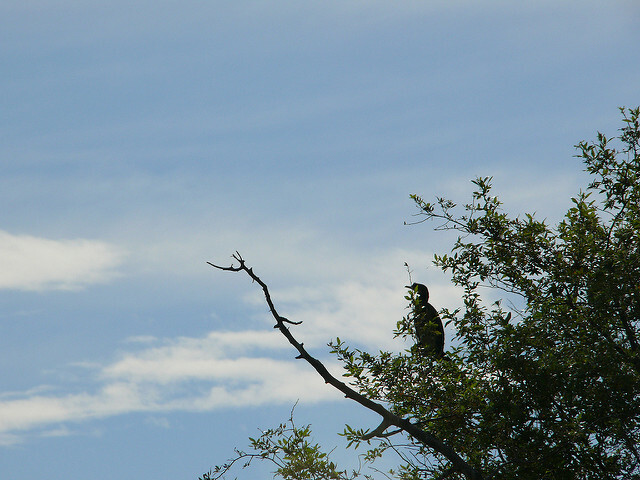 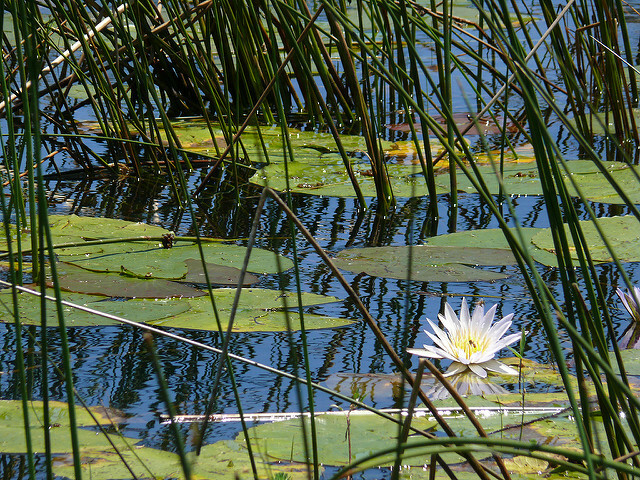 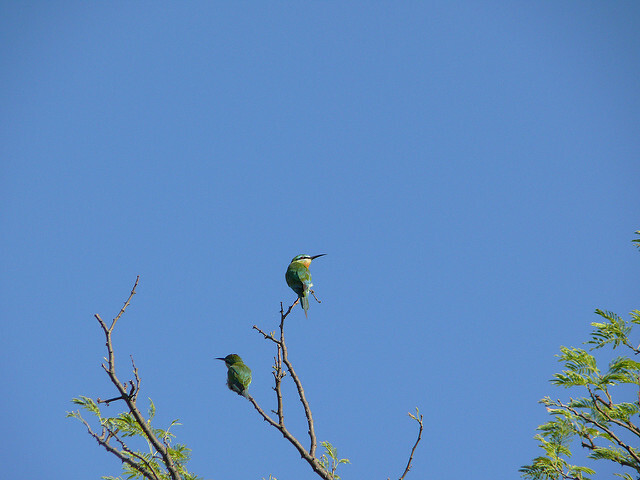 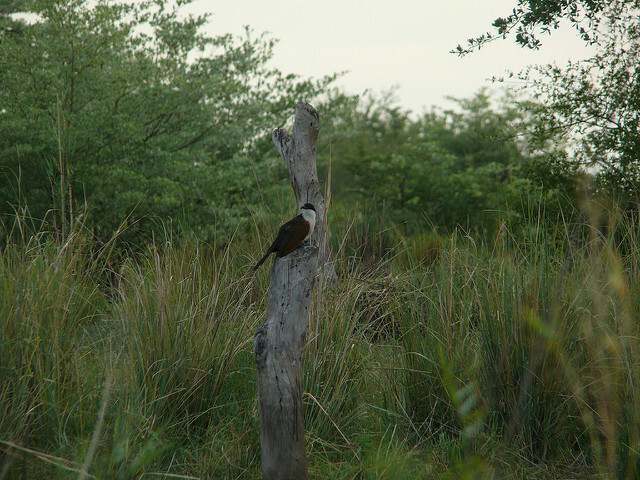 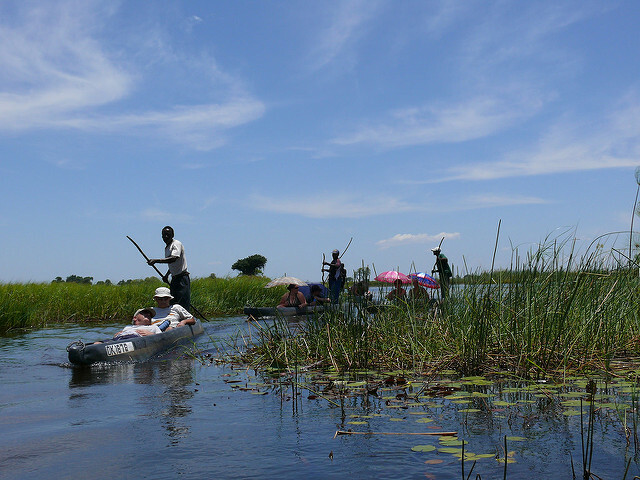 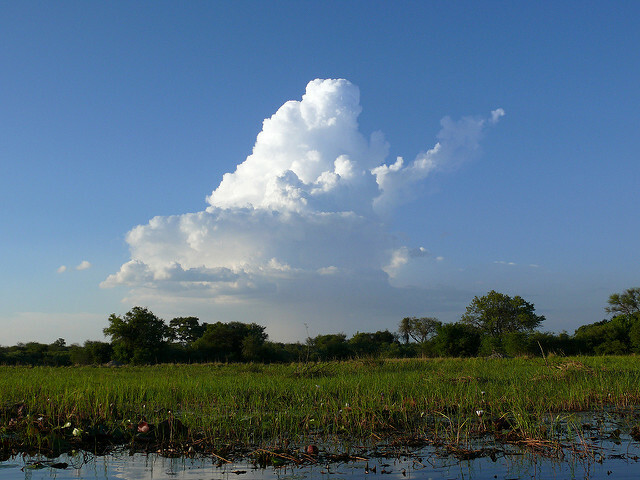 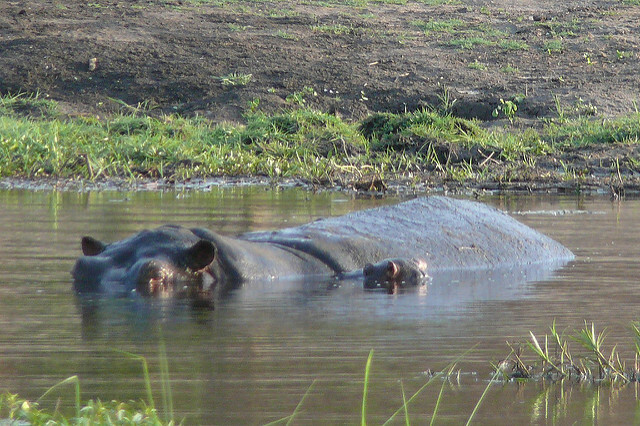 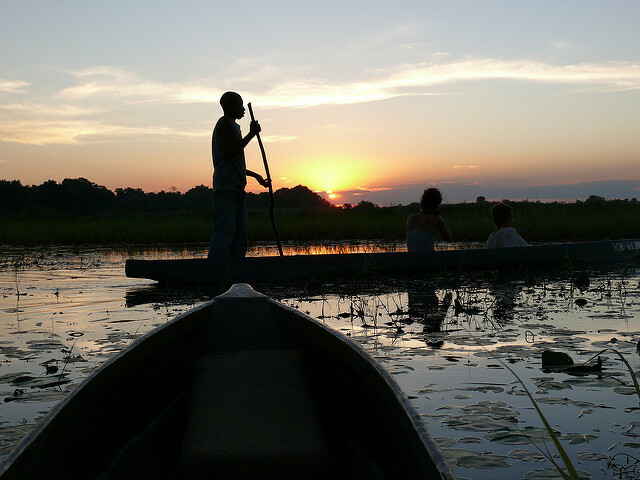 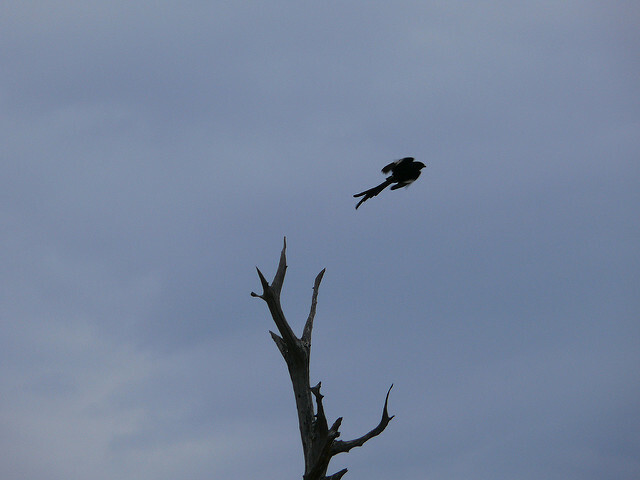 Our visit to the Okavango delta started with a stay on Swamp Island. 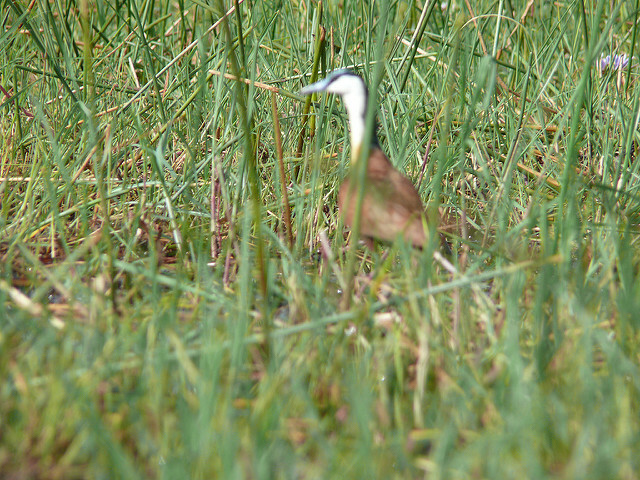 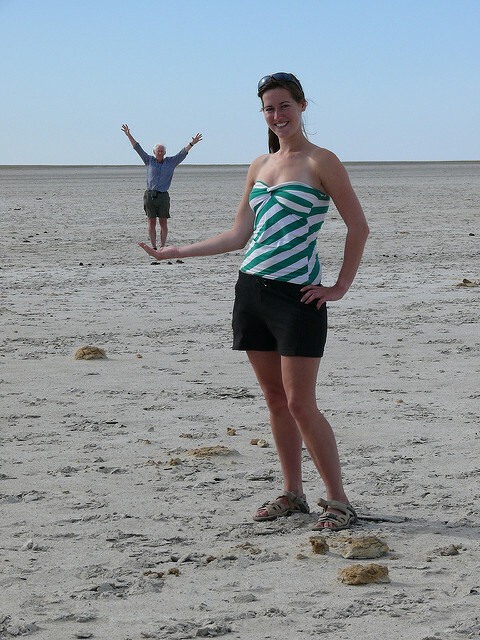 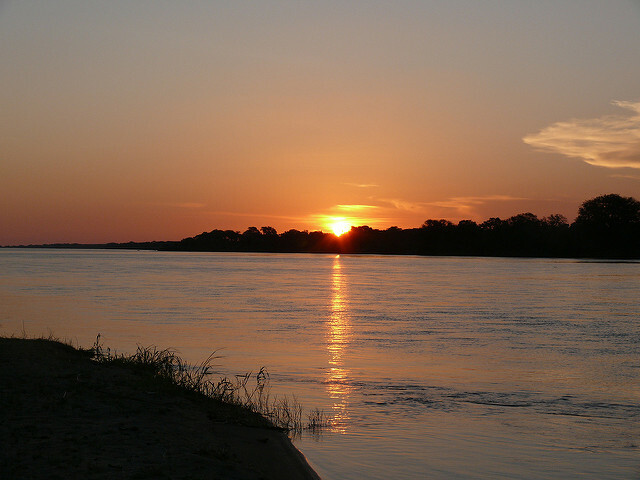 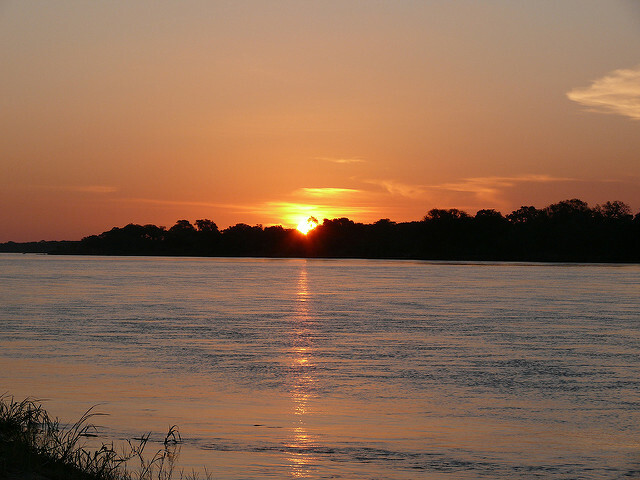 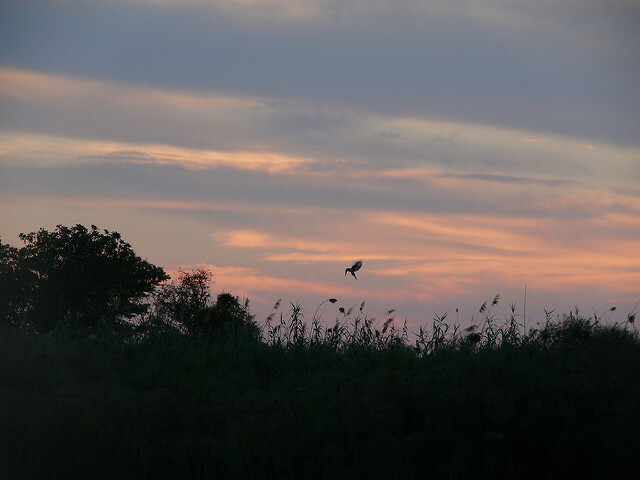 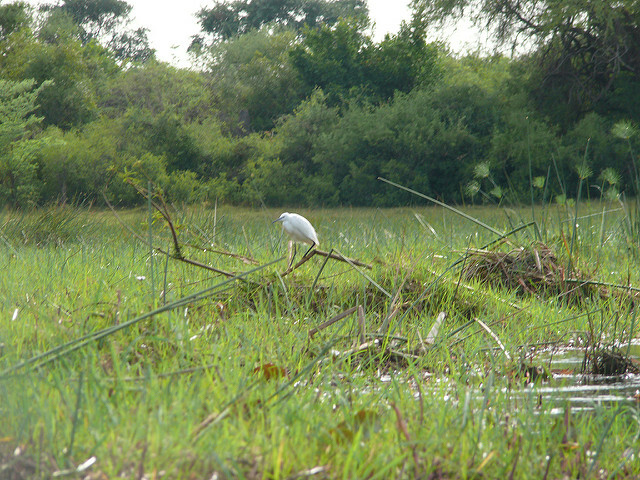 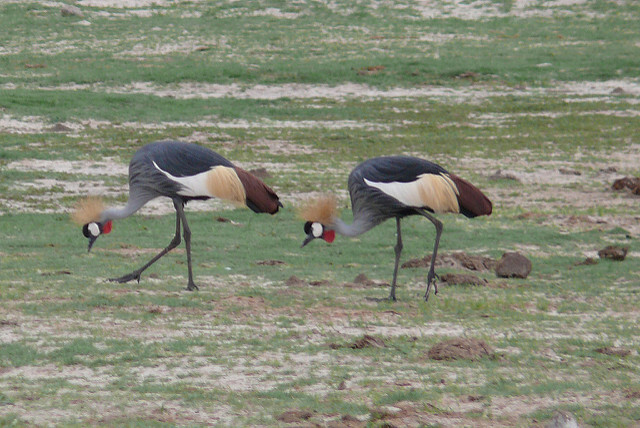 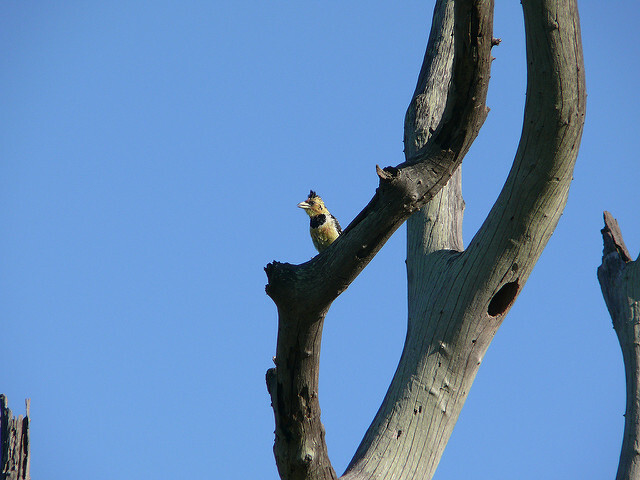 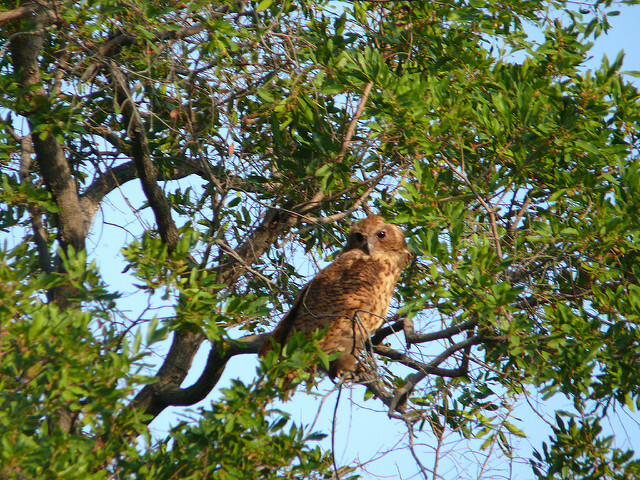 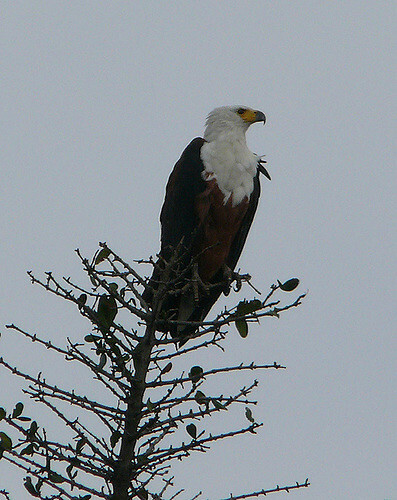 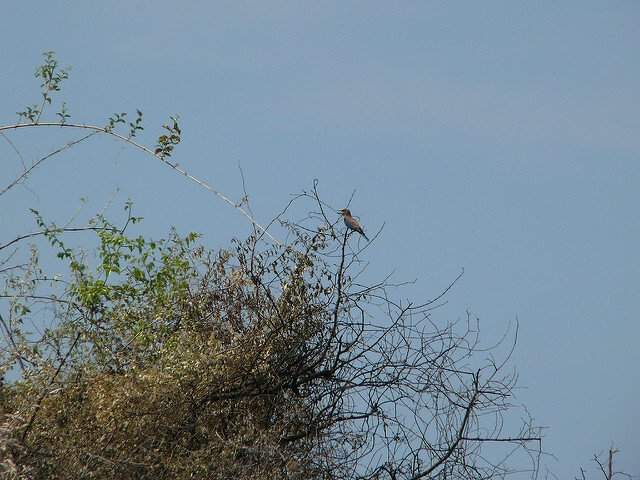 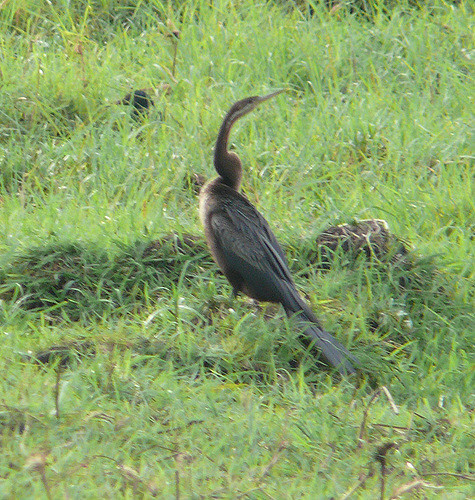 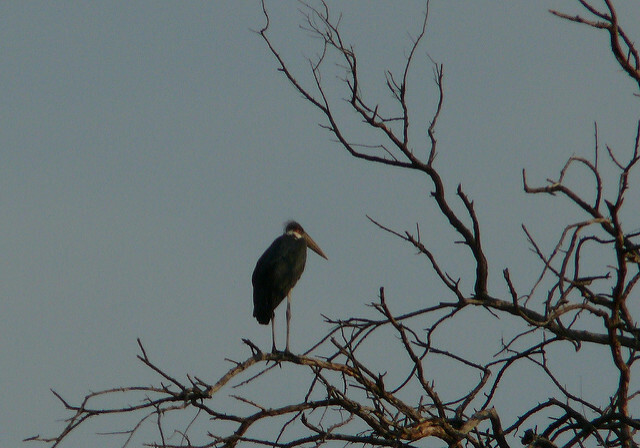 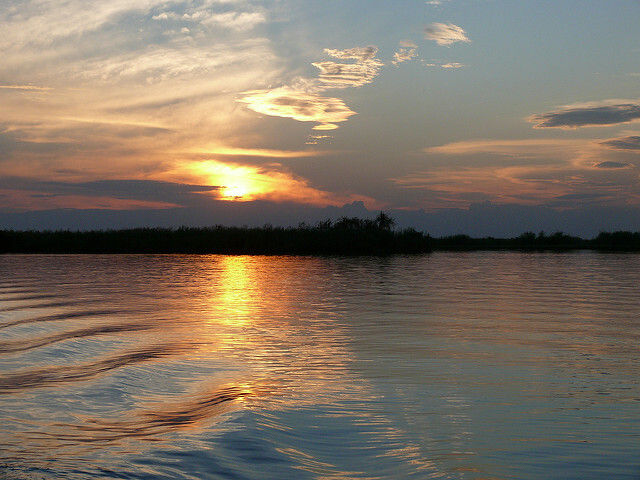 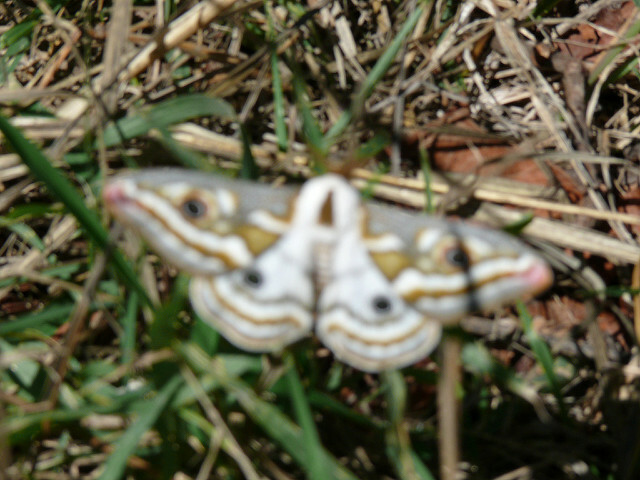 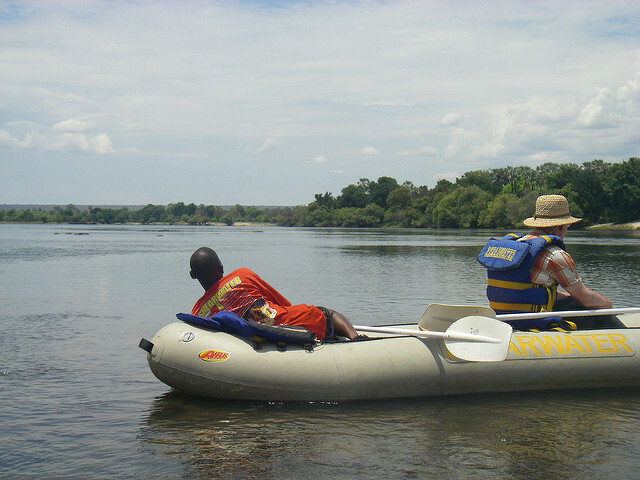 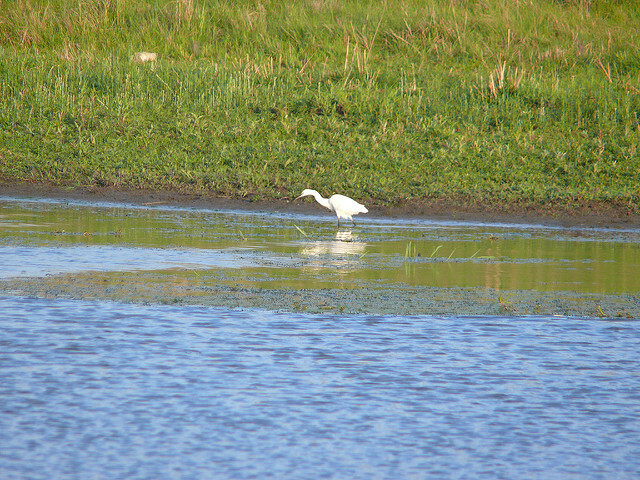 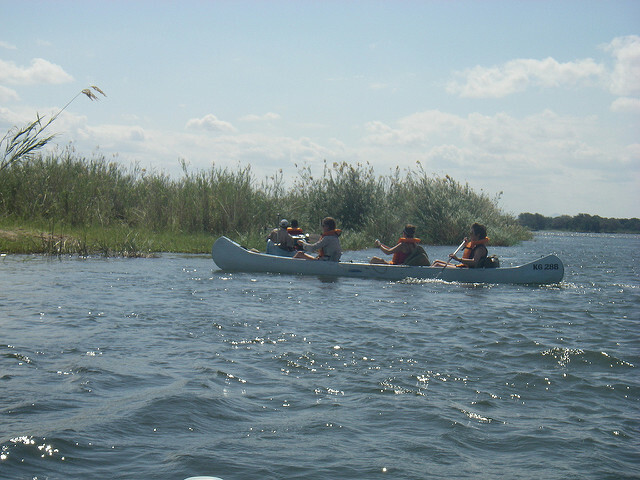 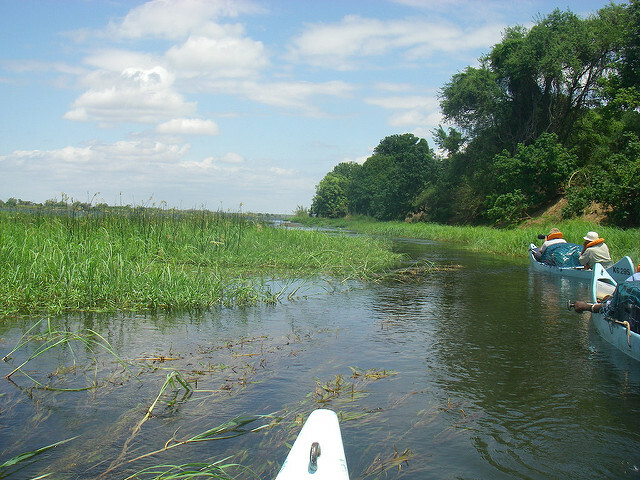 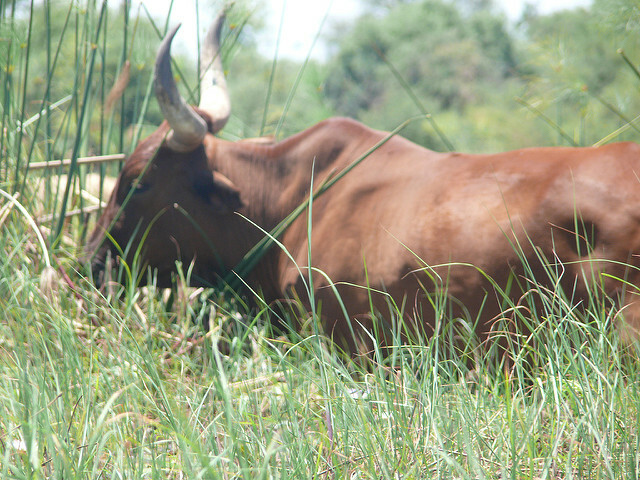 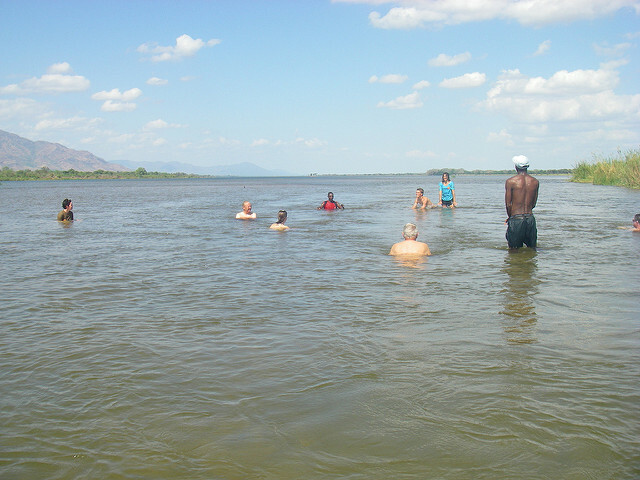 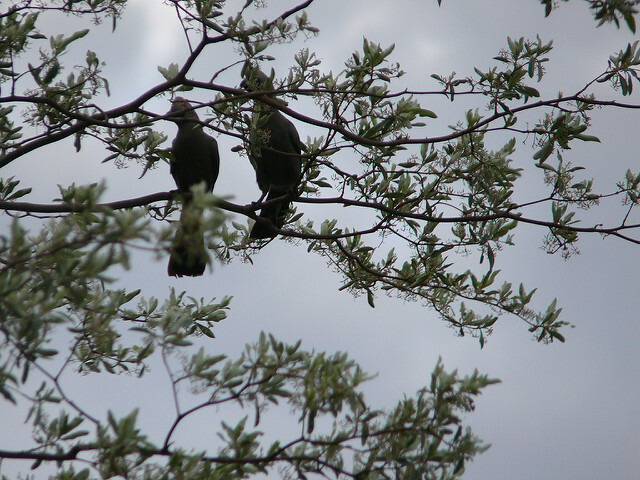 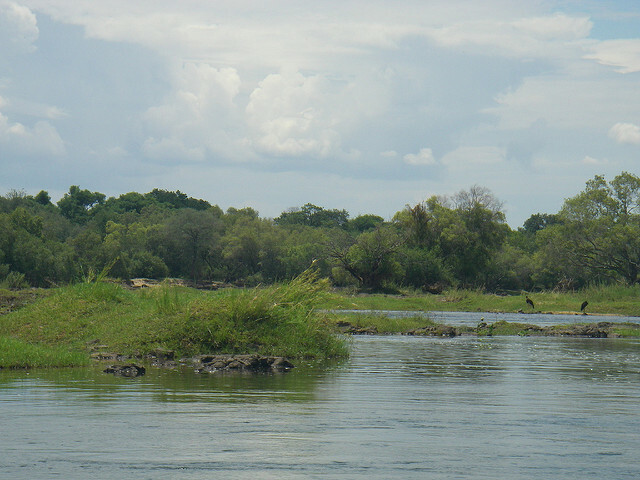 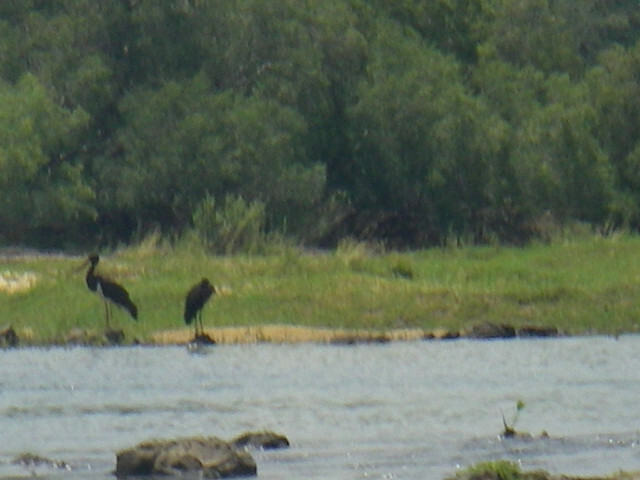 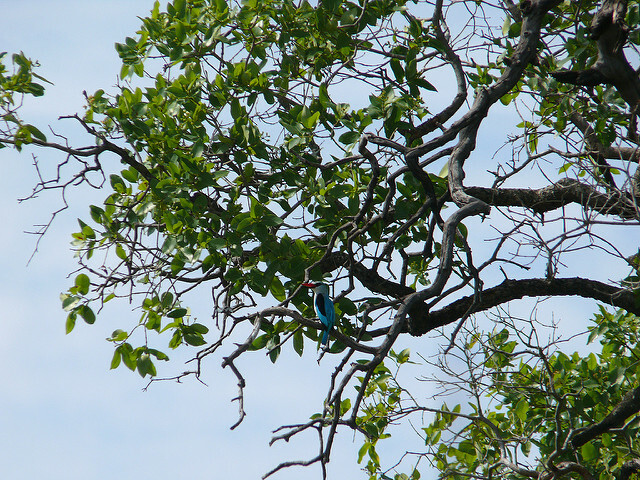 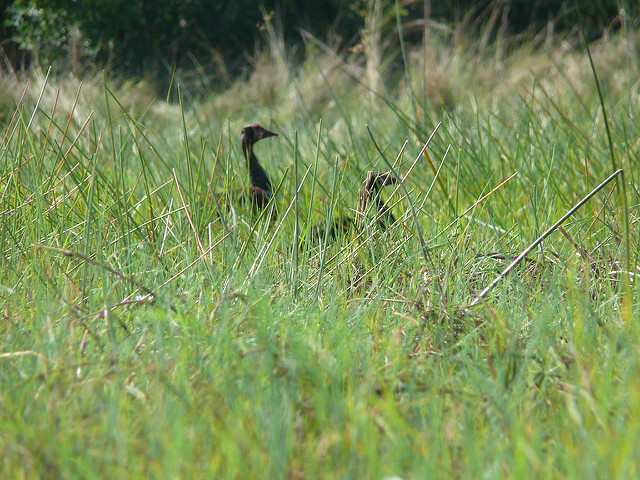 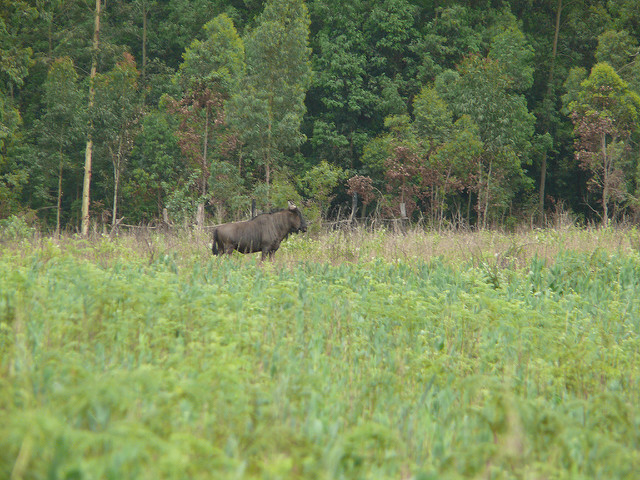 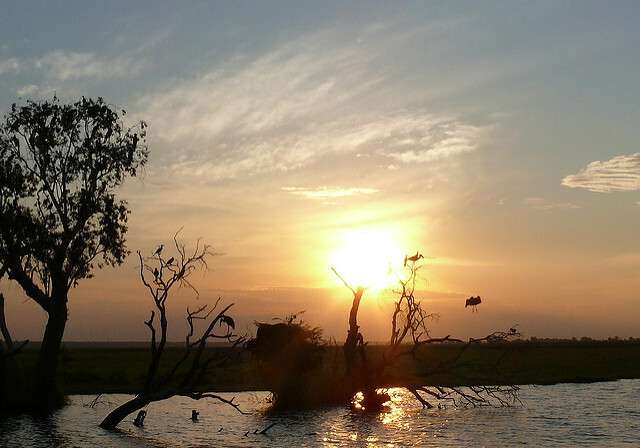 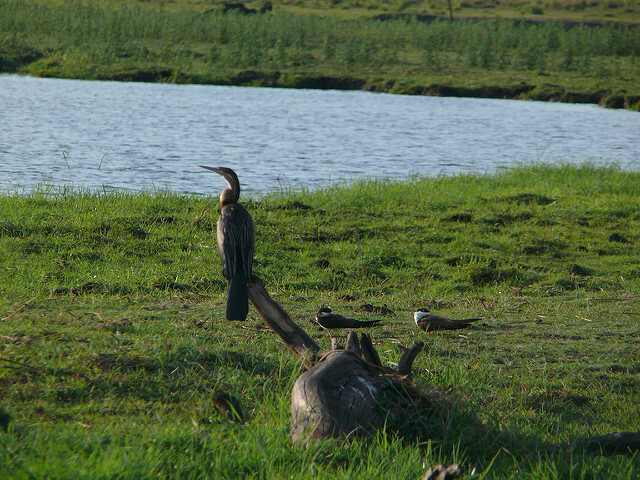 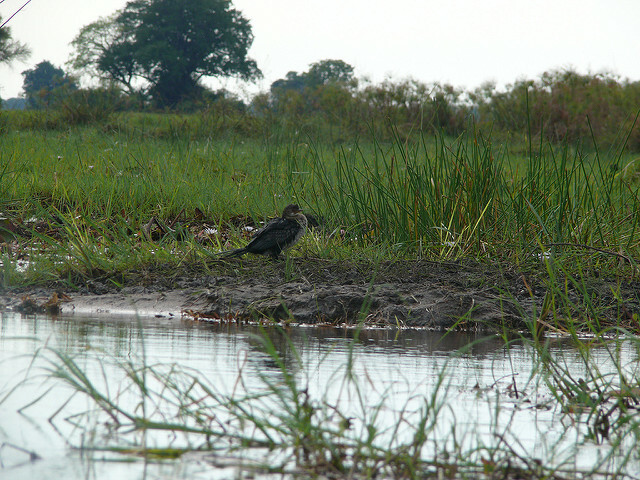 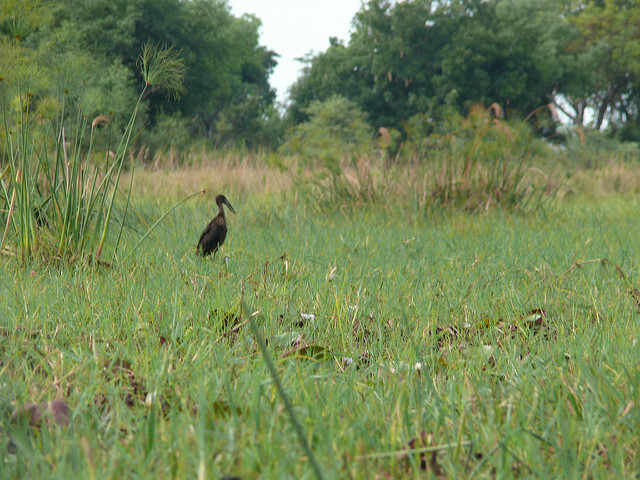 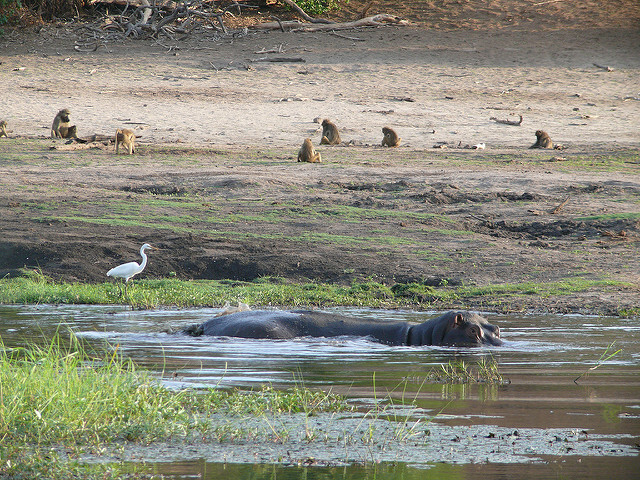 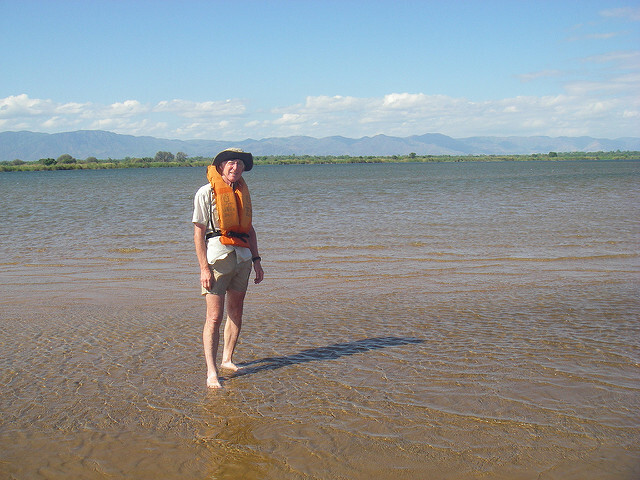 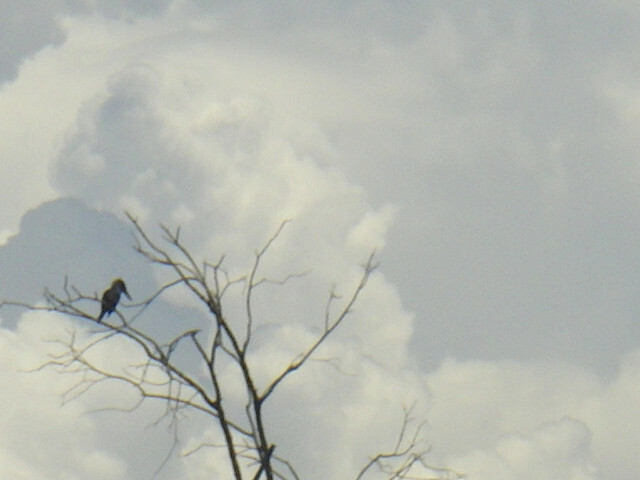 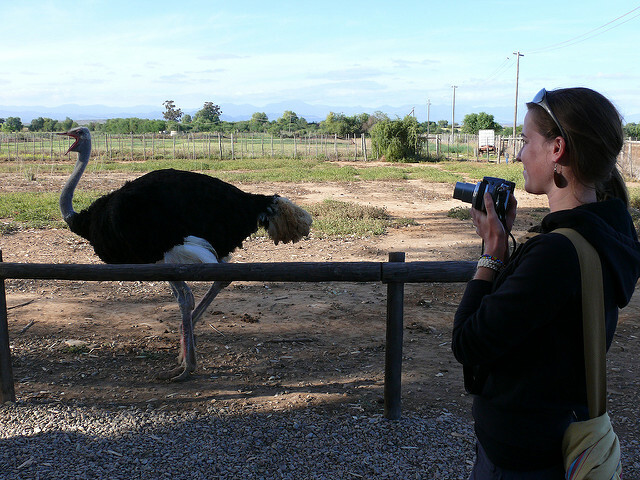 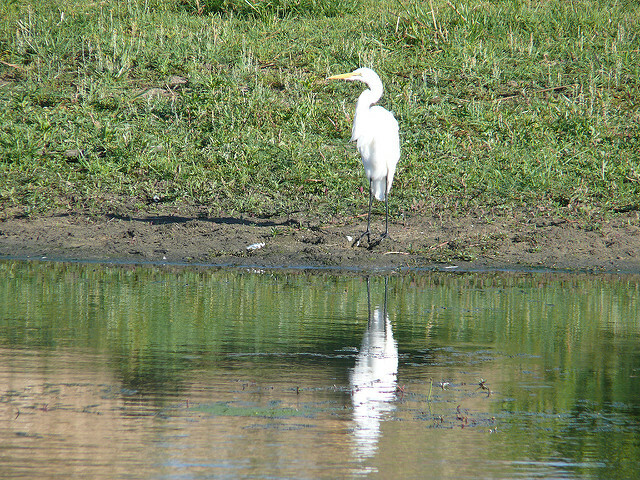 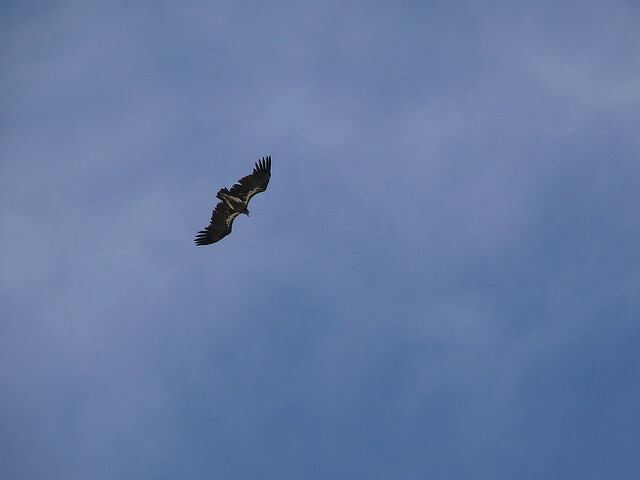 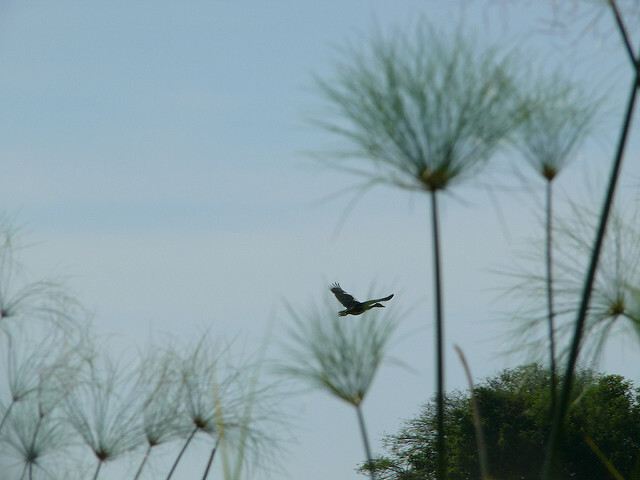 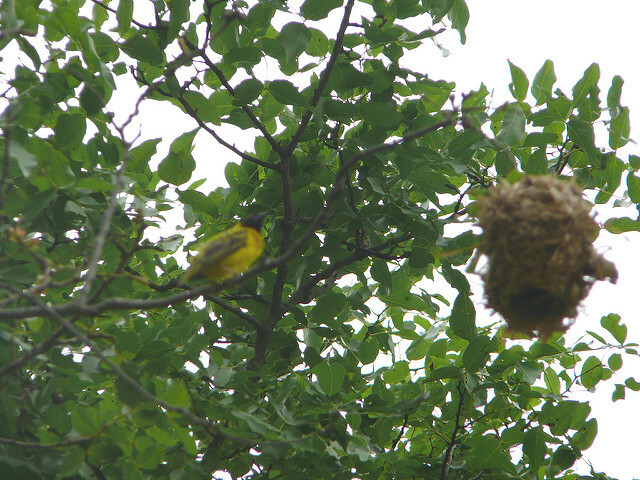 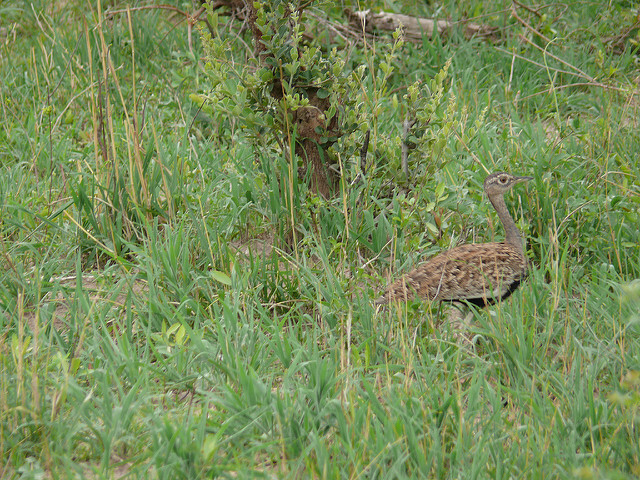 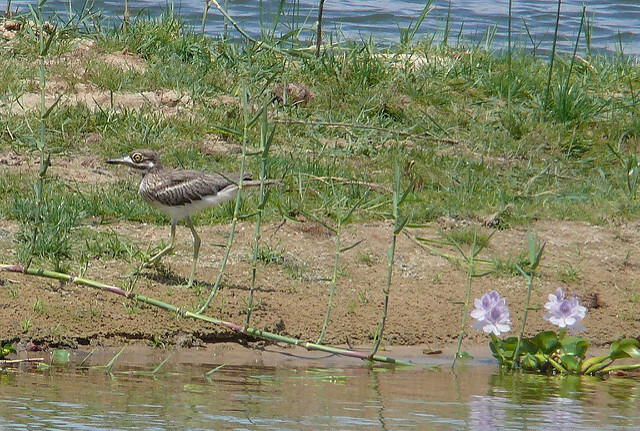 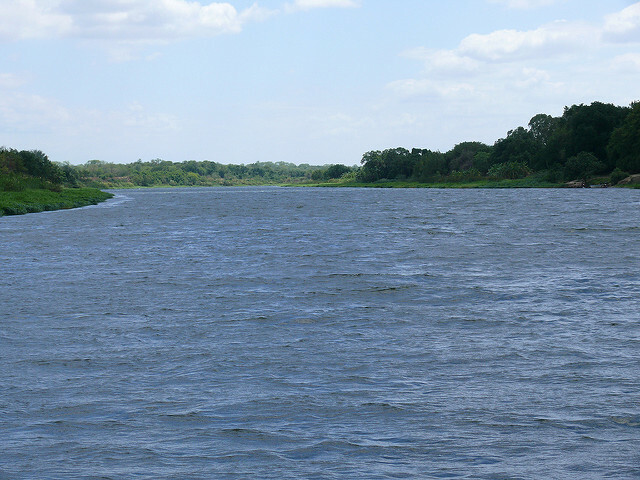 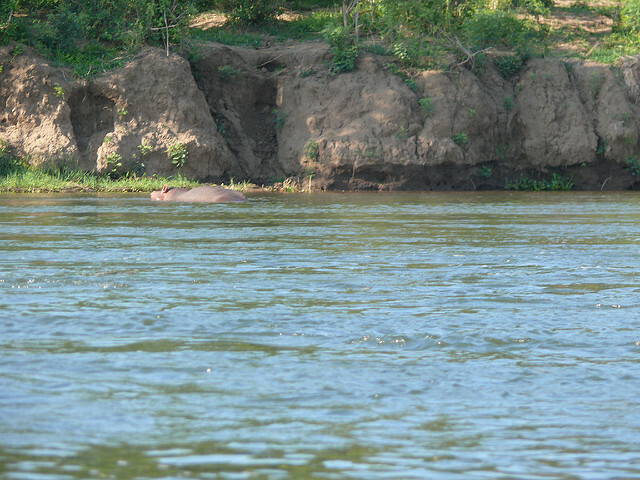 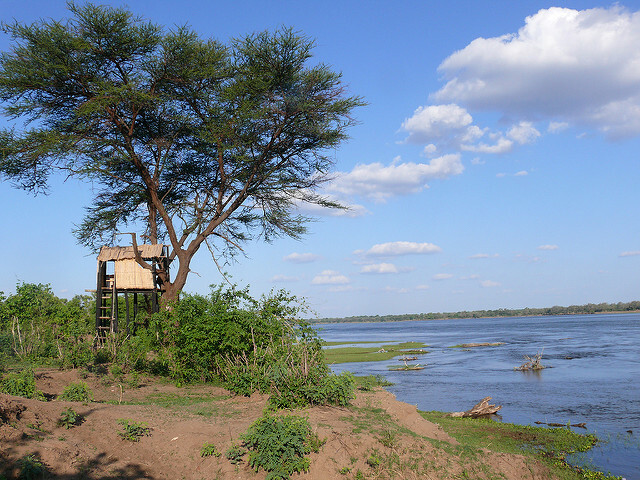 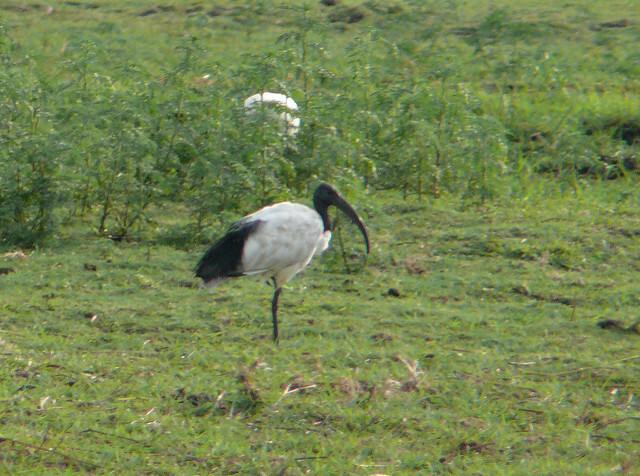 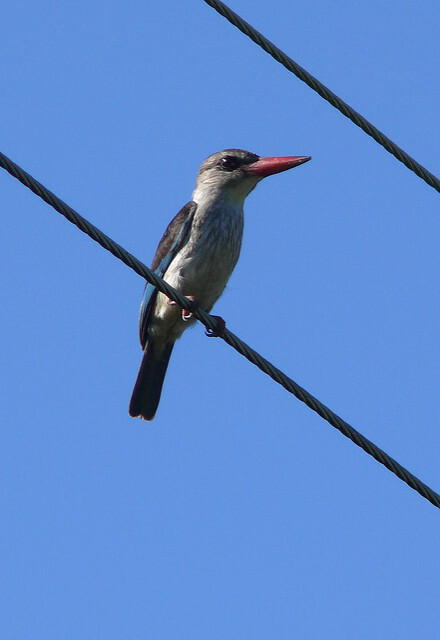 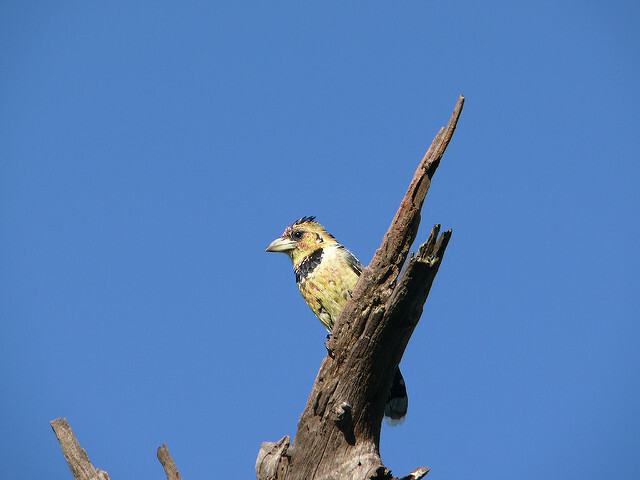 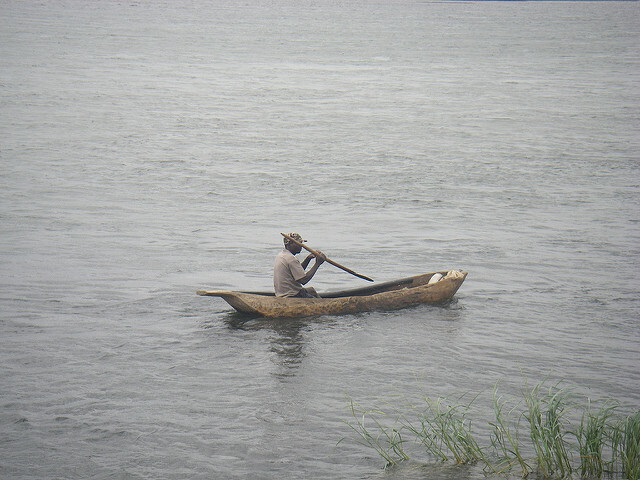 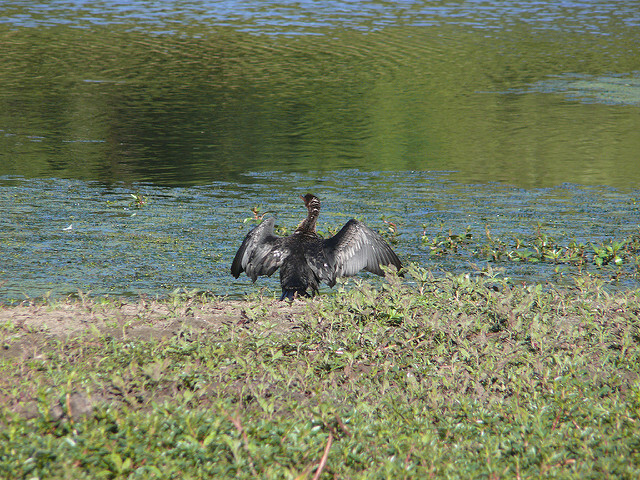 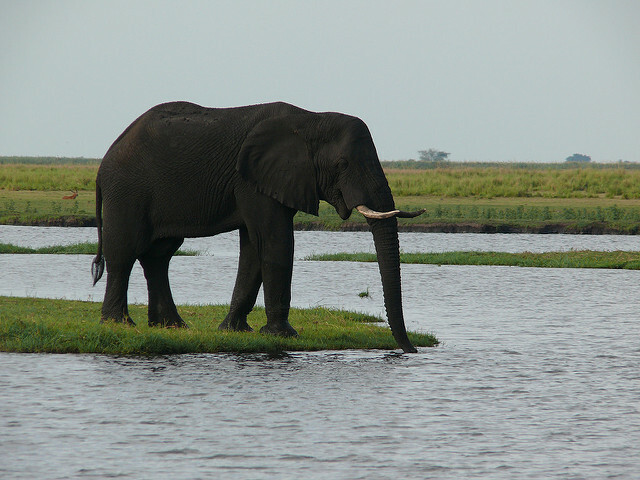 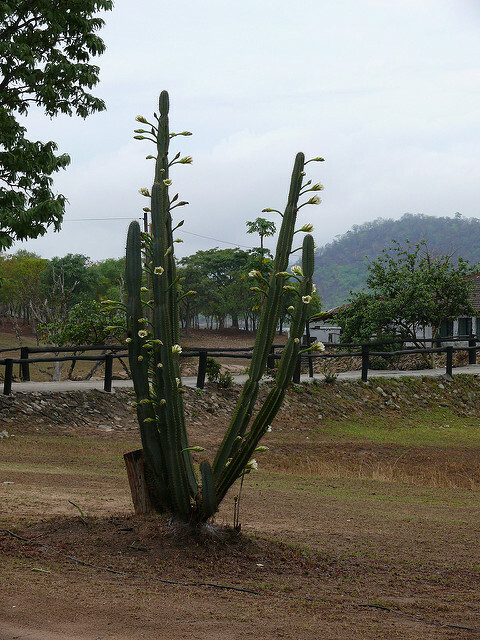 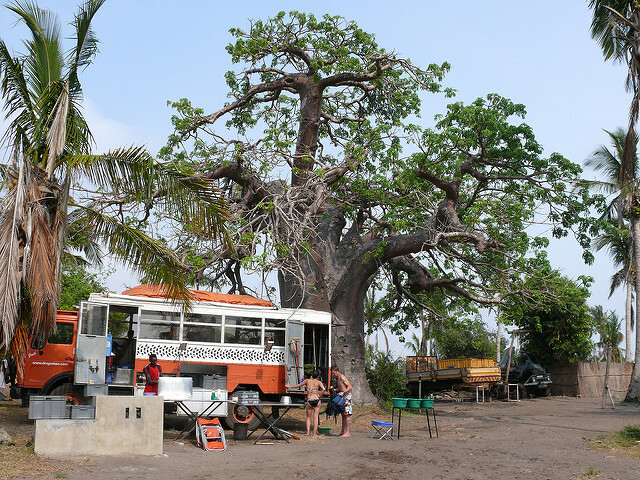 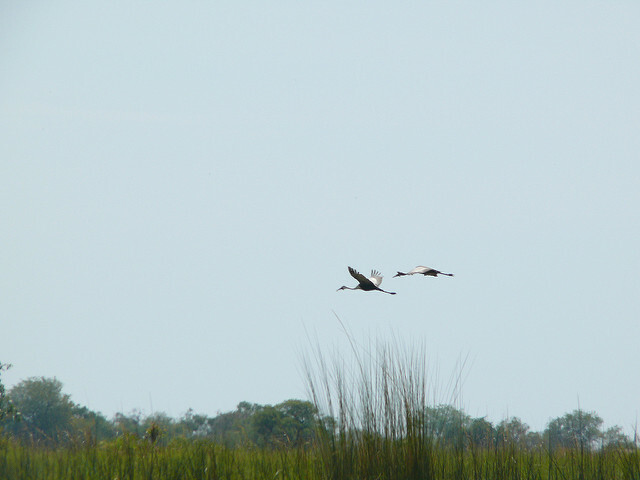 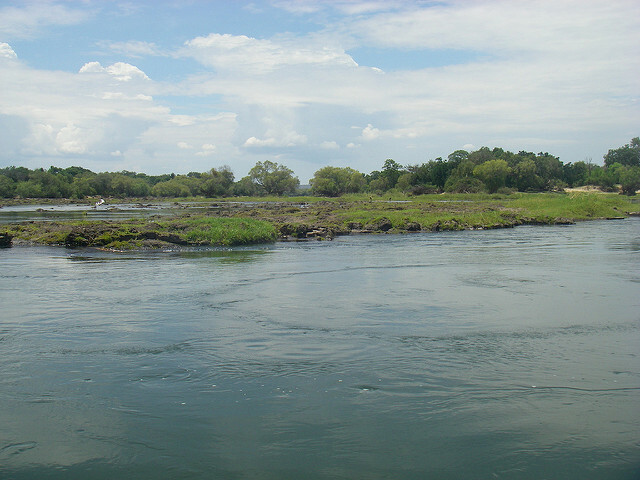 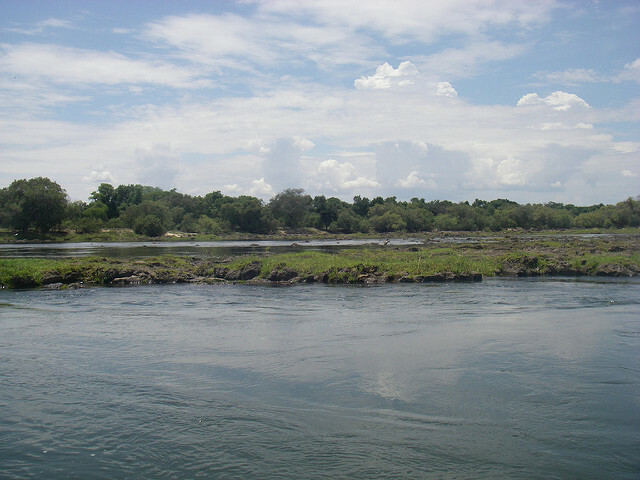 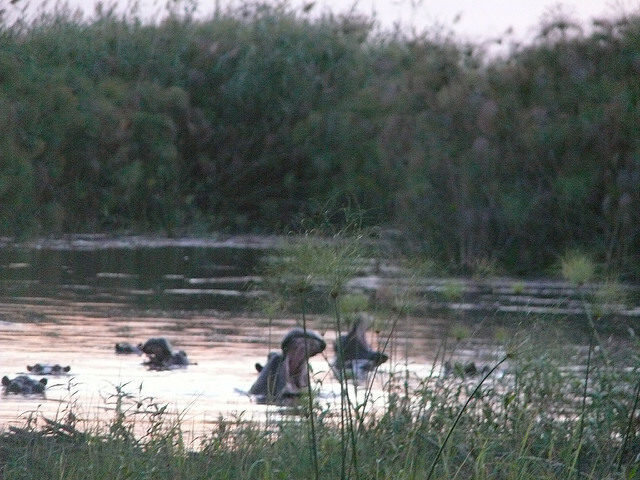 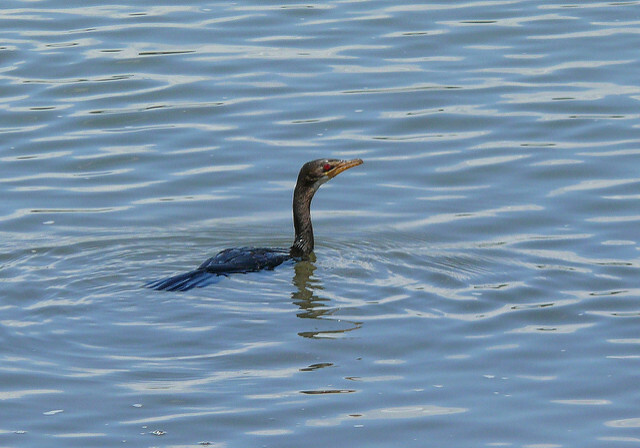 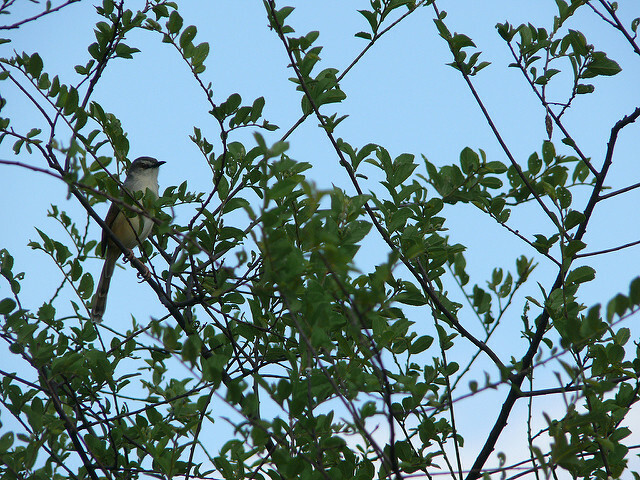 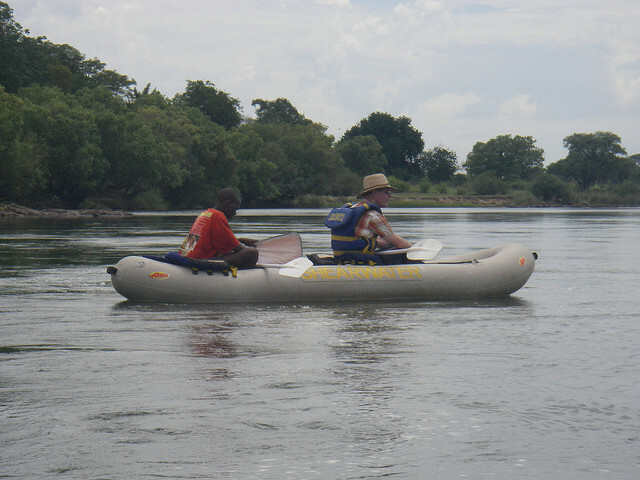 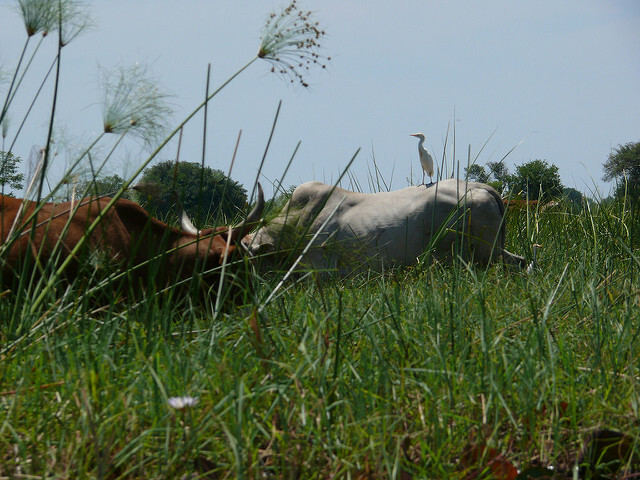 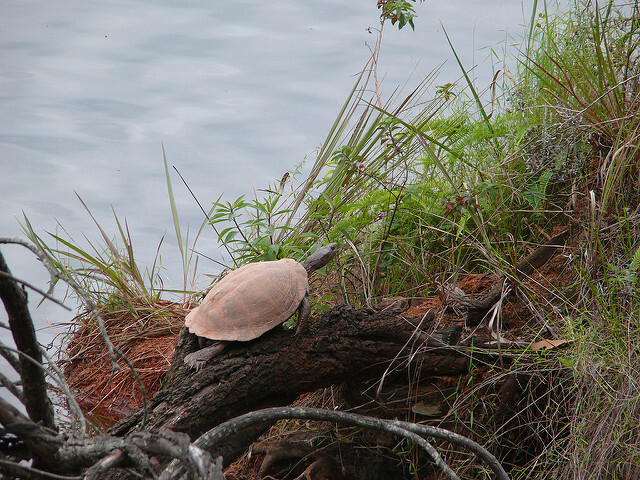 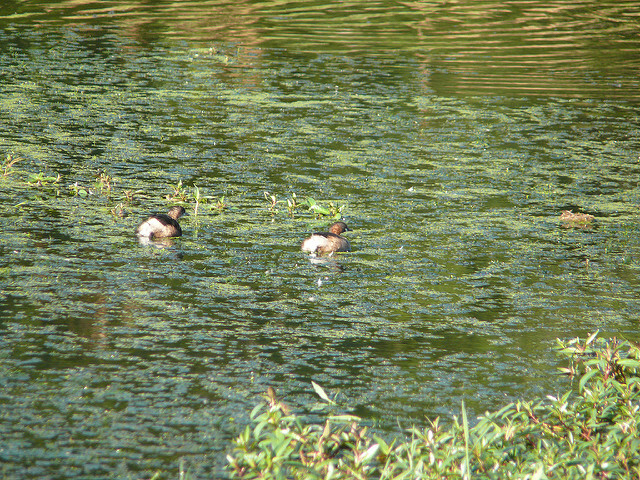 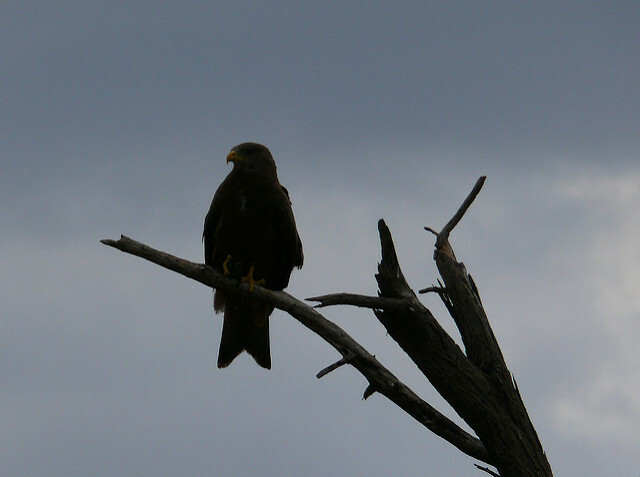 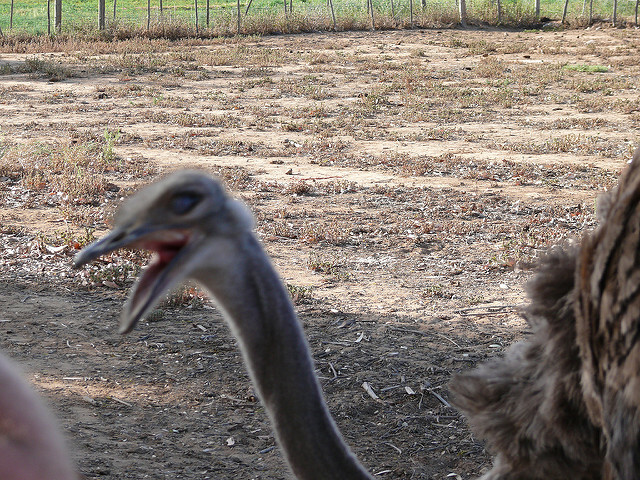 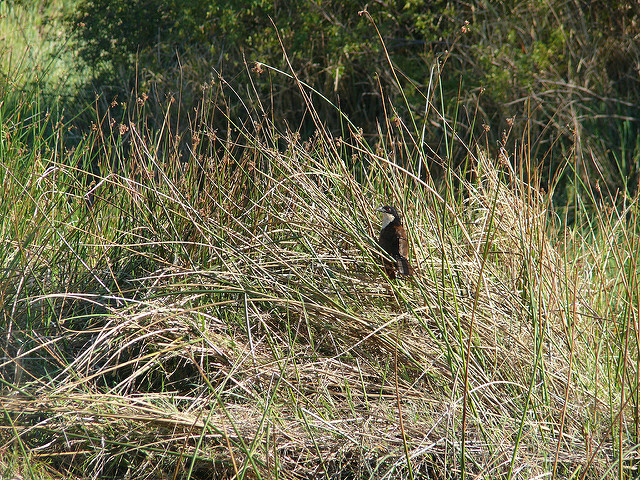 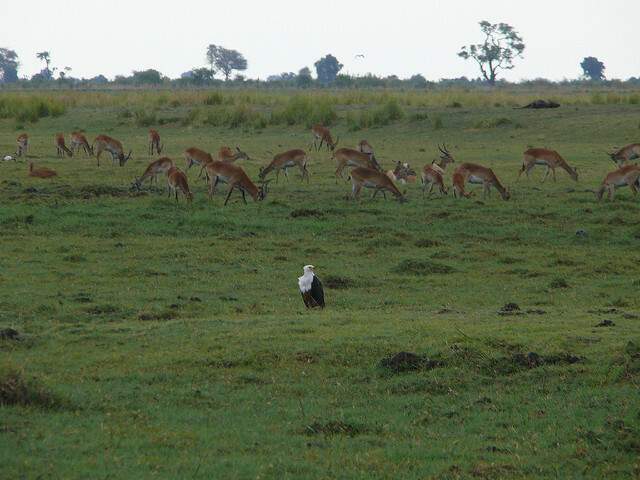 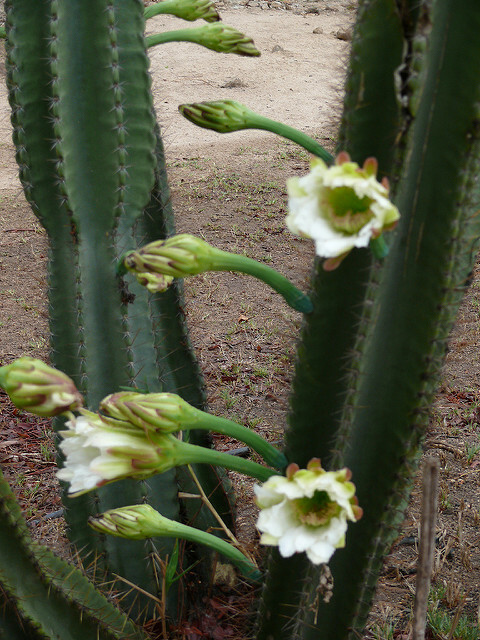 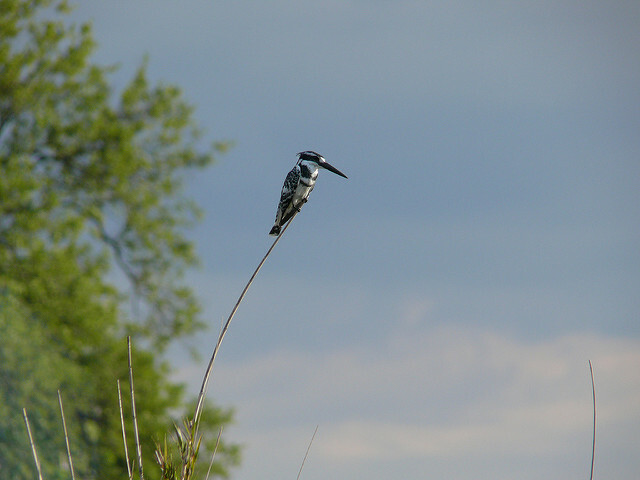 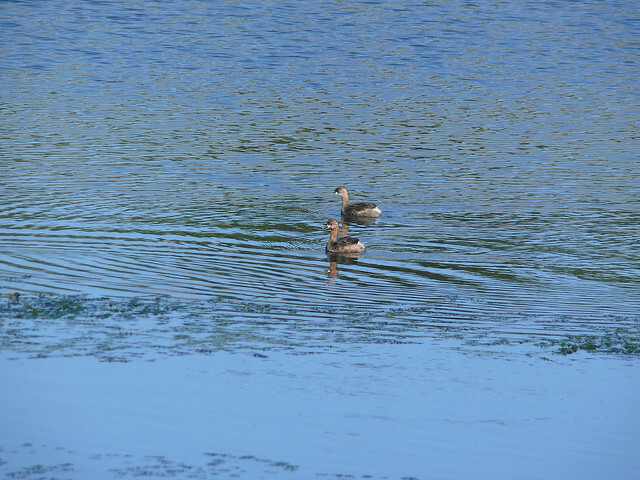 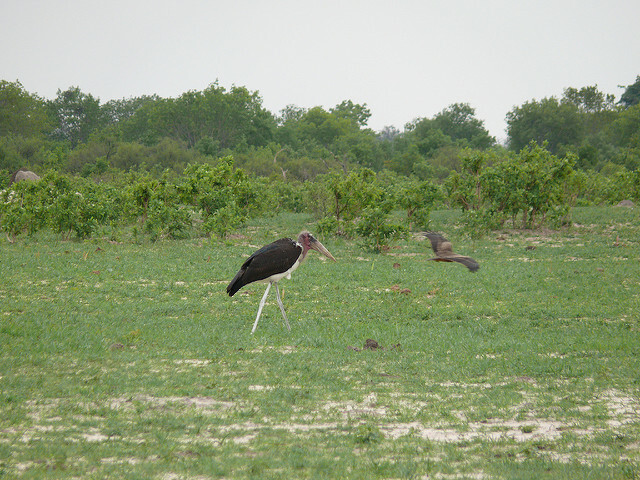 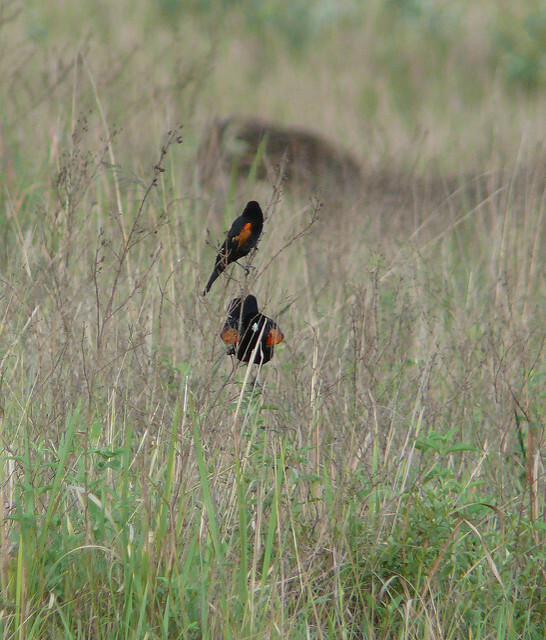 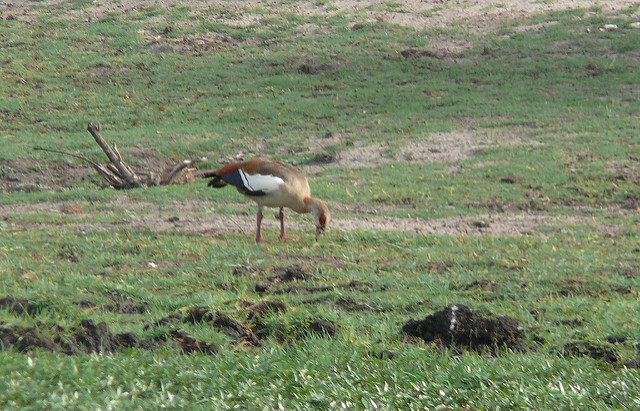 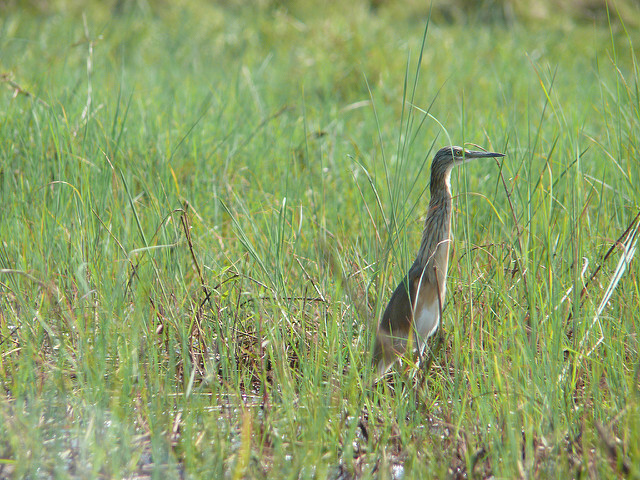 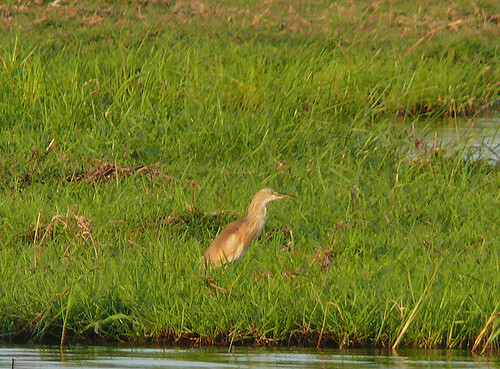 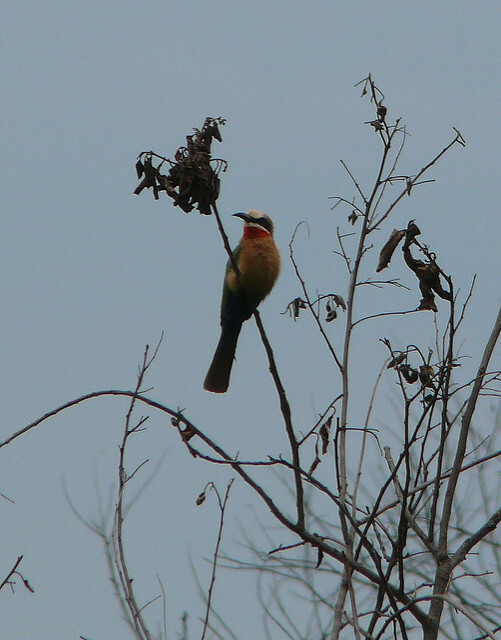 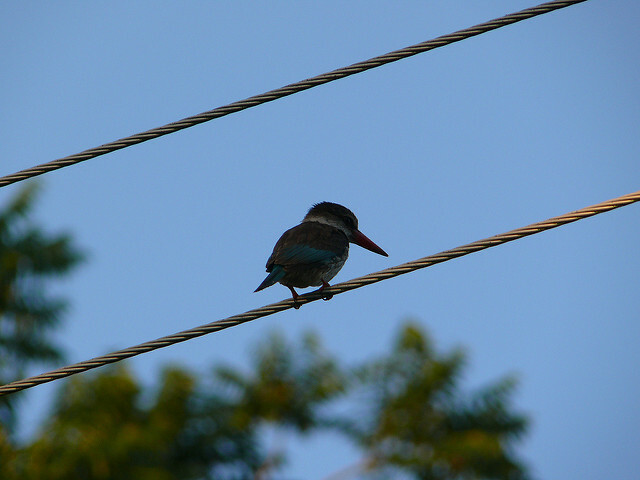 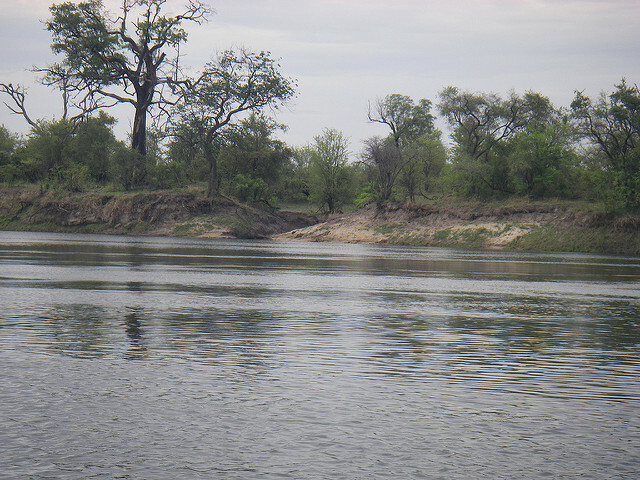 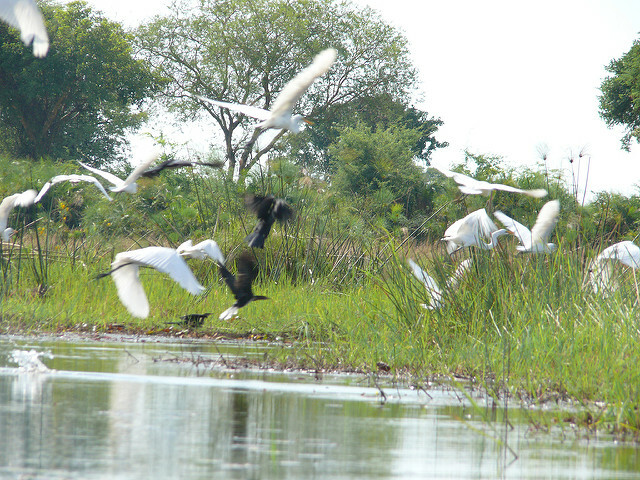 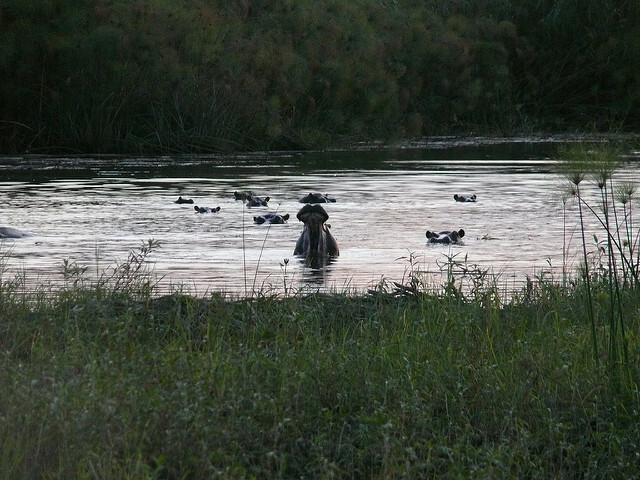 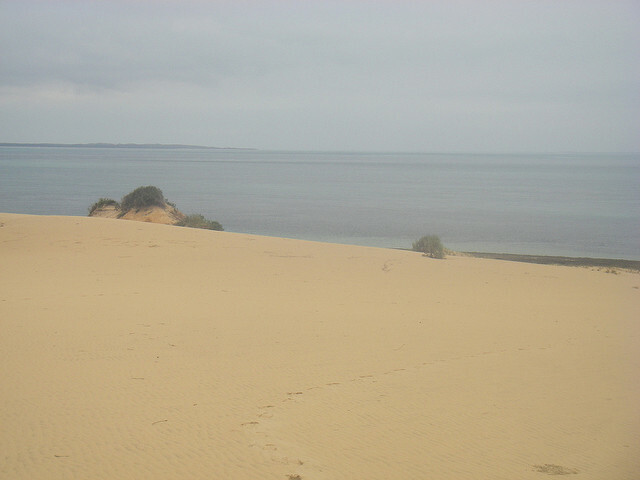 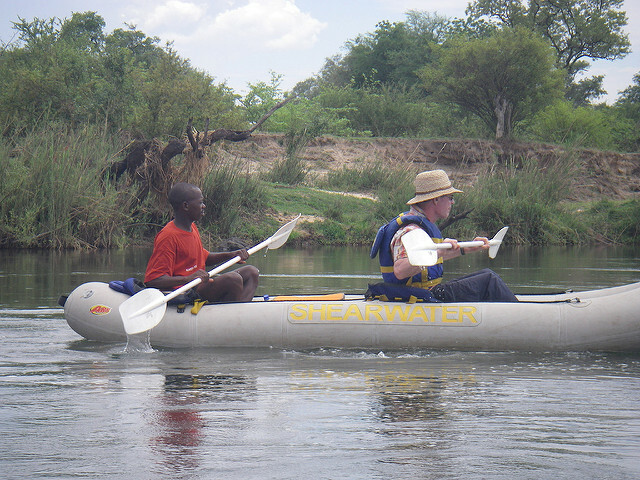 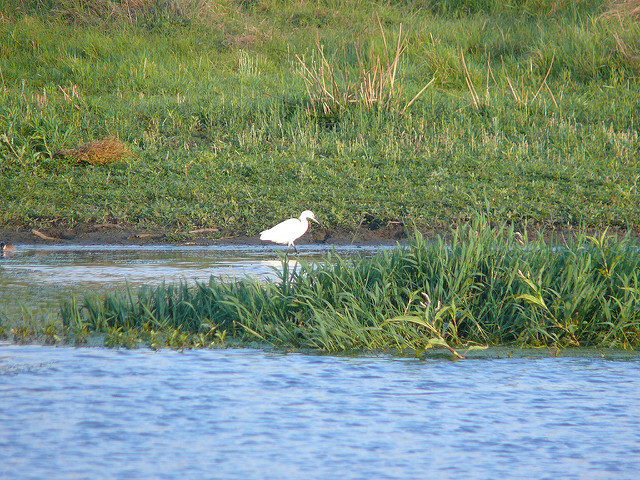 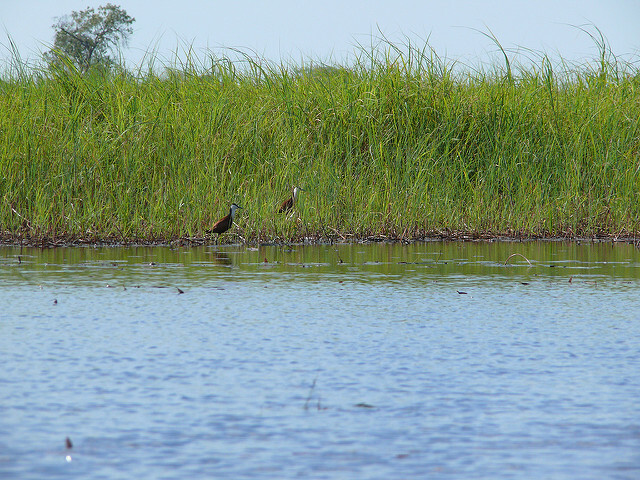 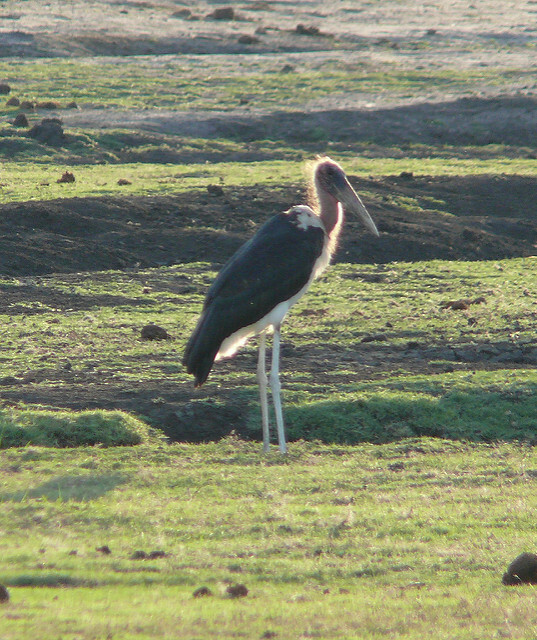 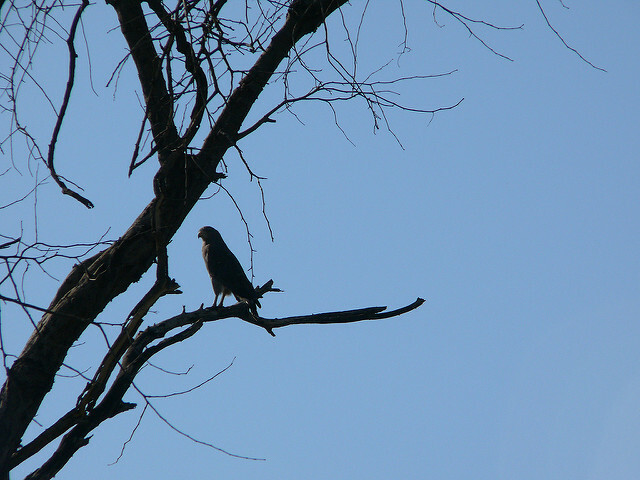 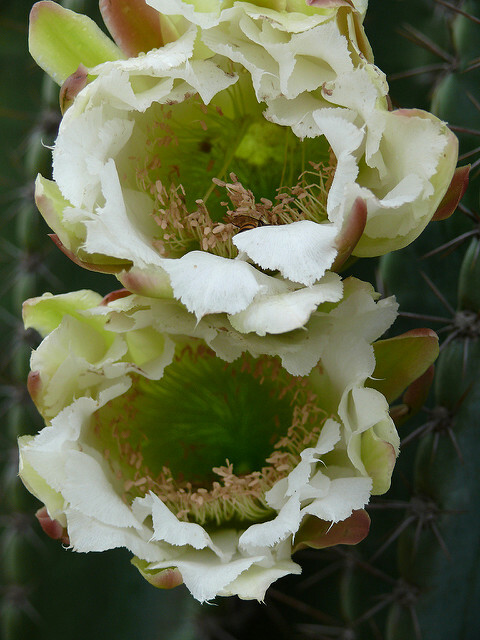 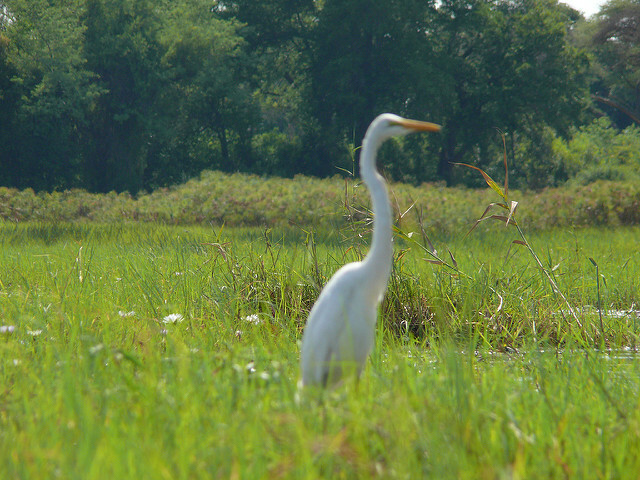 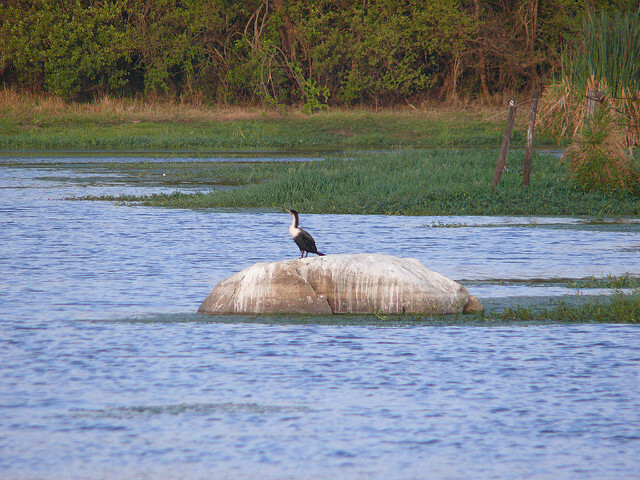 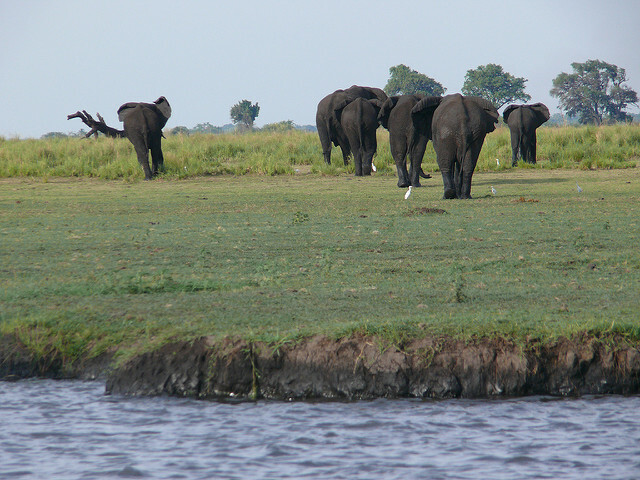 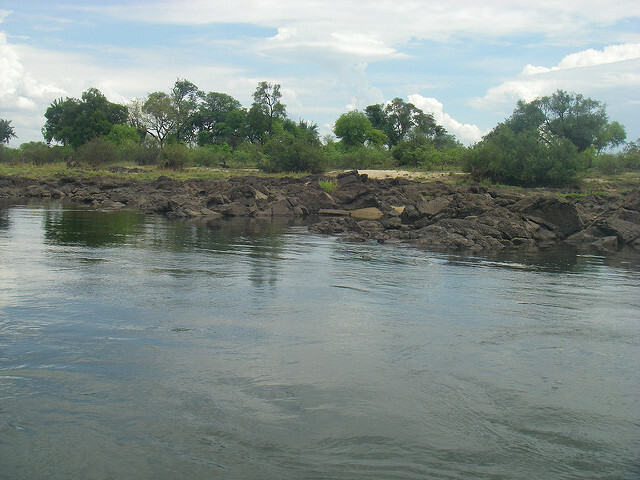 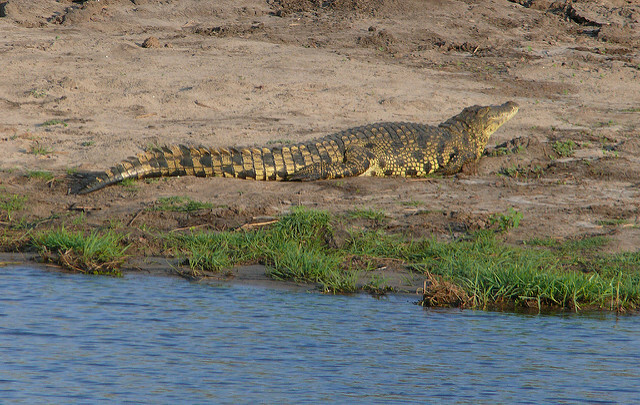 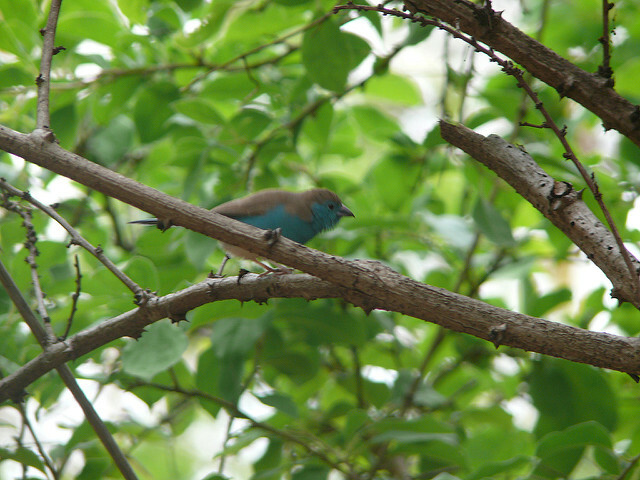 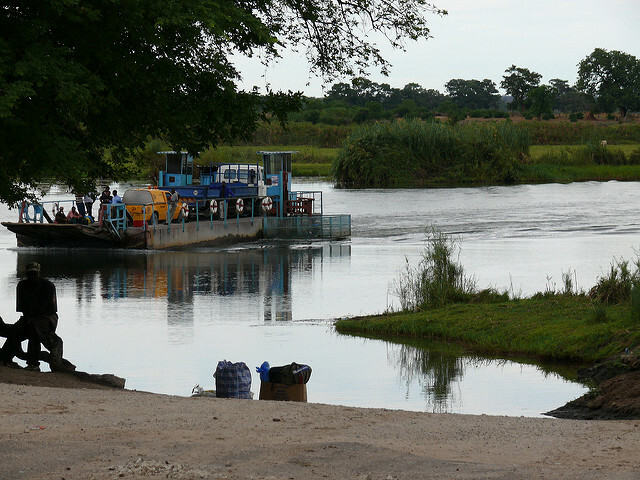 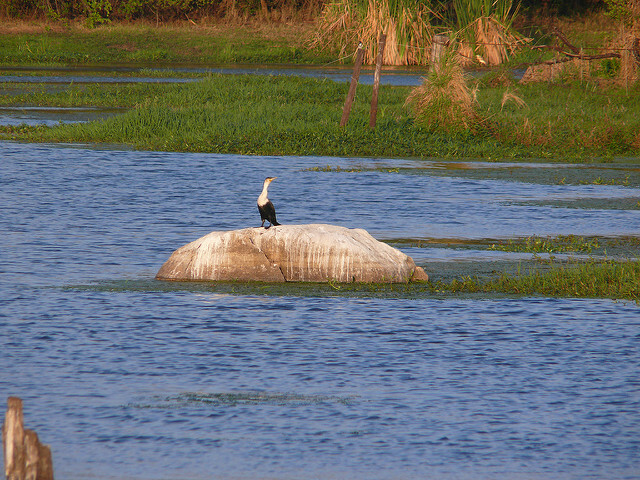 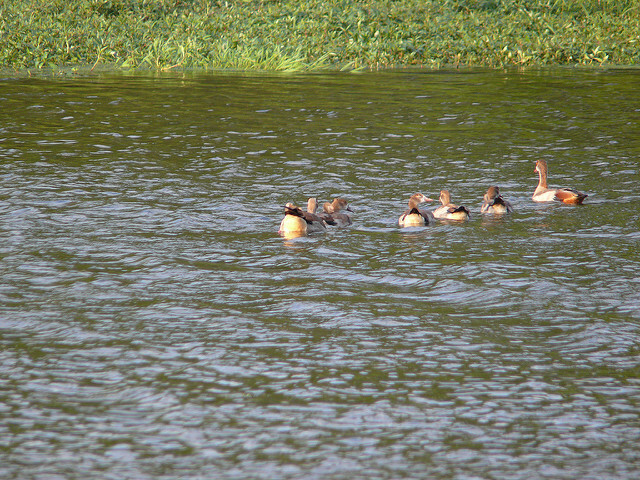 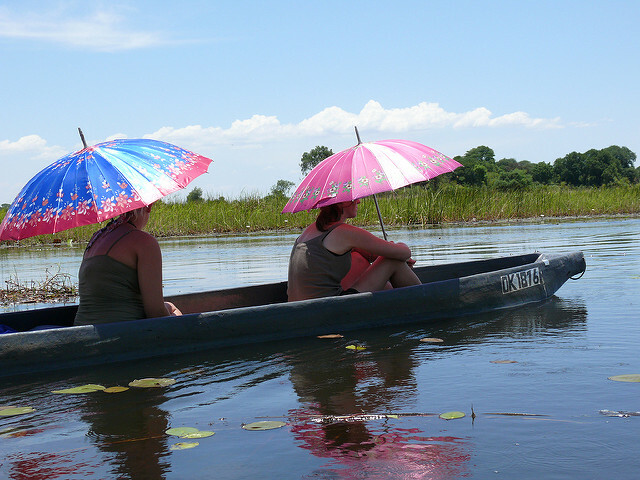 Here we took trips out by makoros to see the wildlife of the delta. 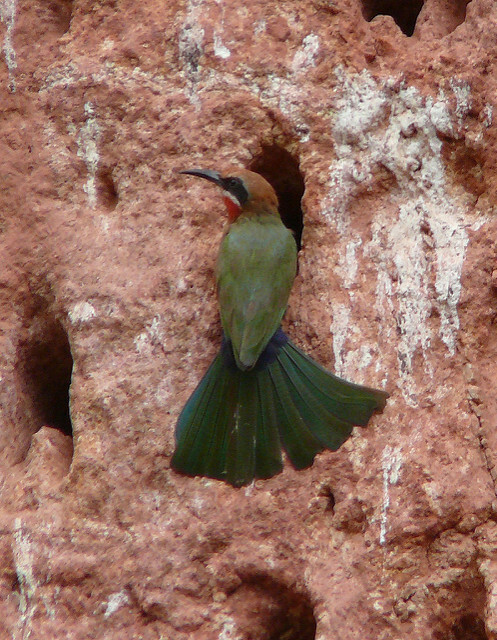 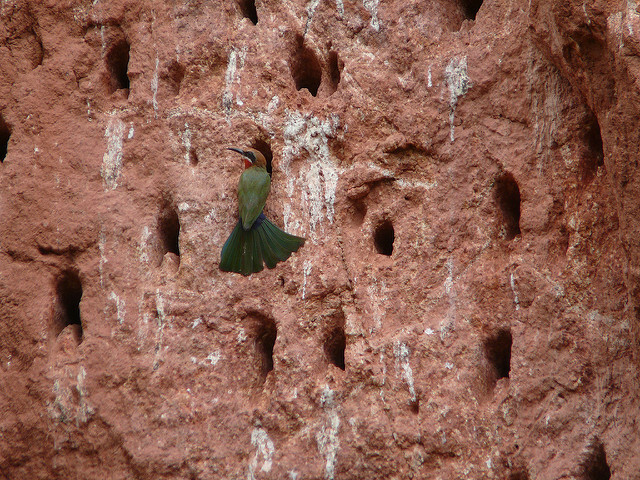 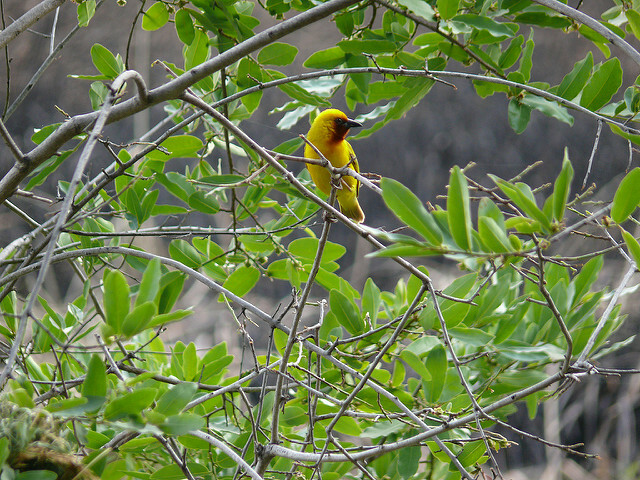 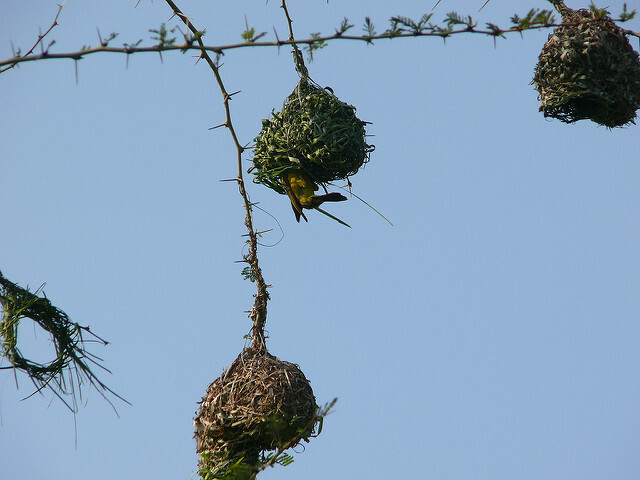 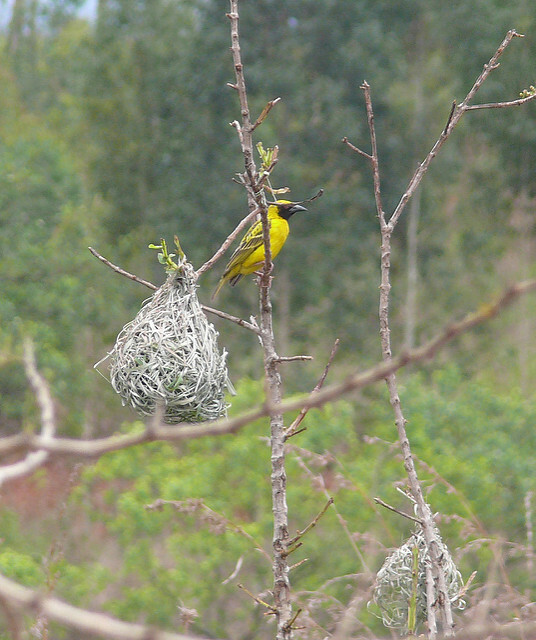 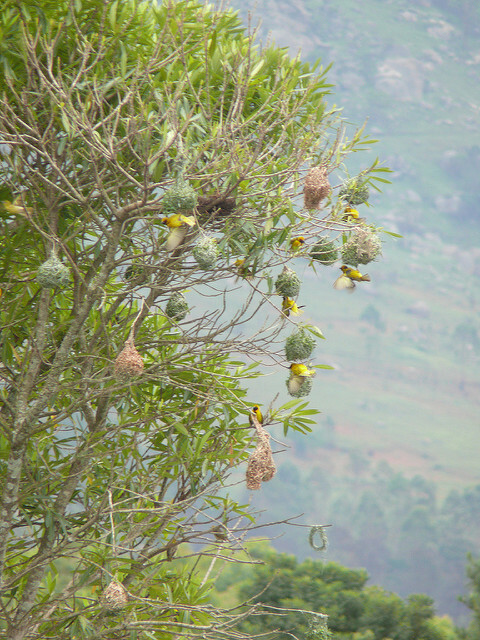 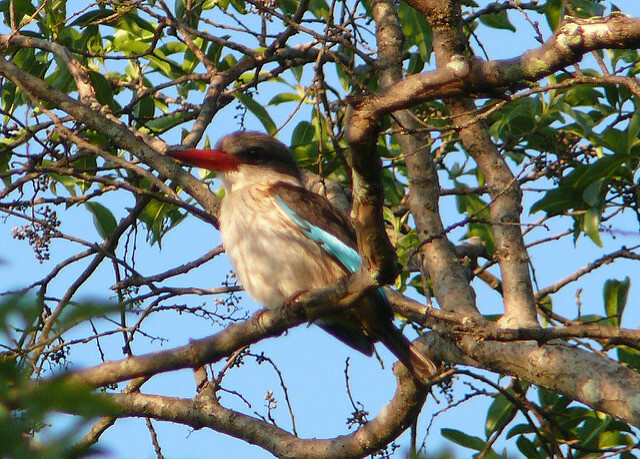 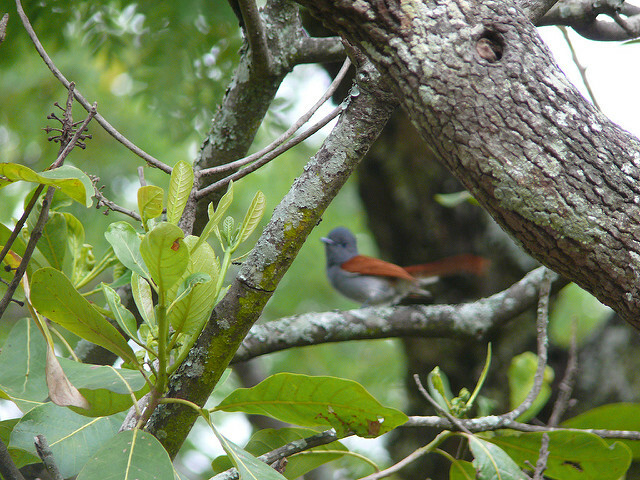 At Ngepi Camp, with its quirky bathrooms, gave time to relax and take further bird walks. 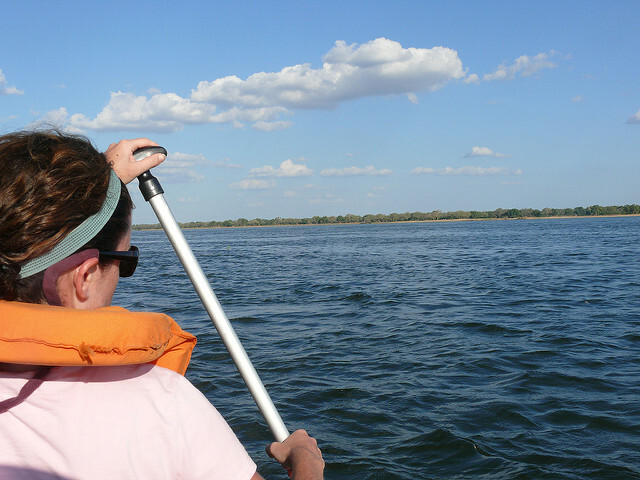 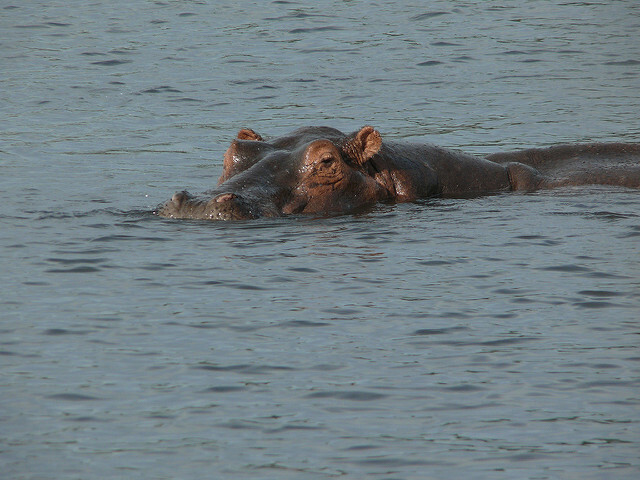 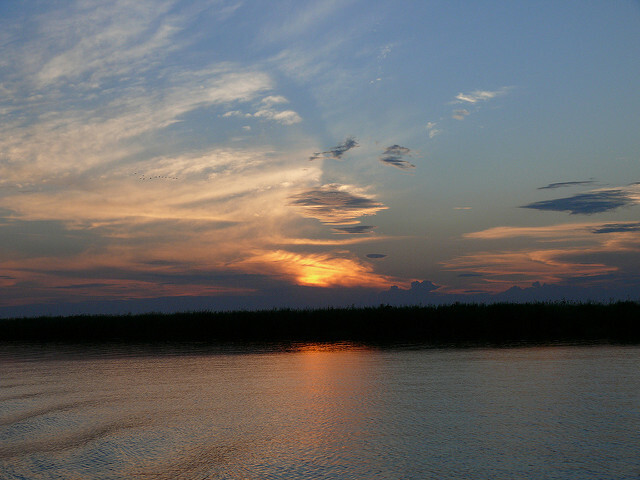 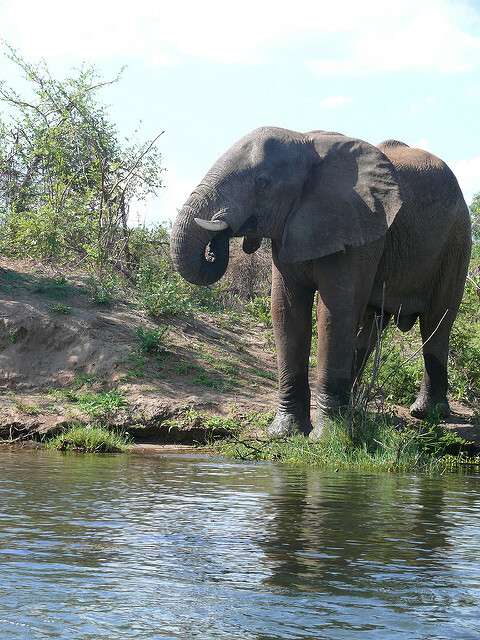 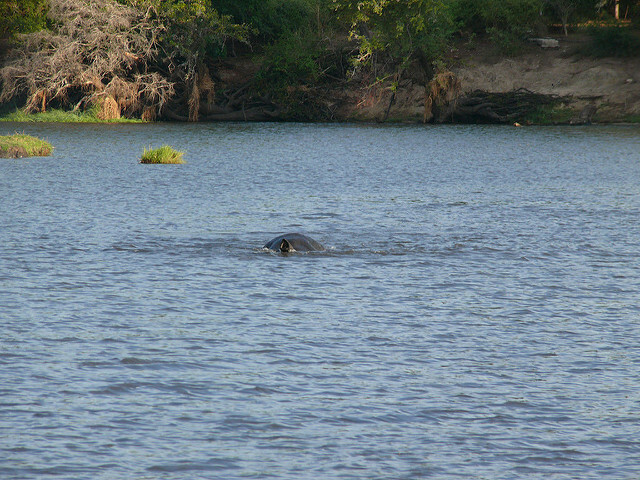 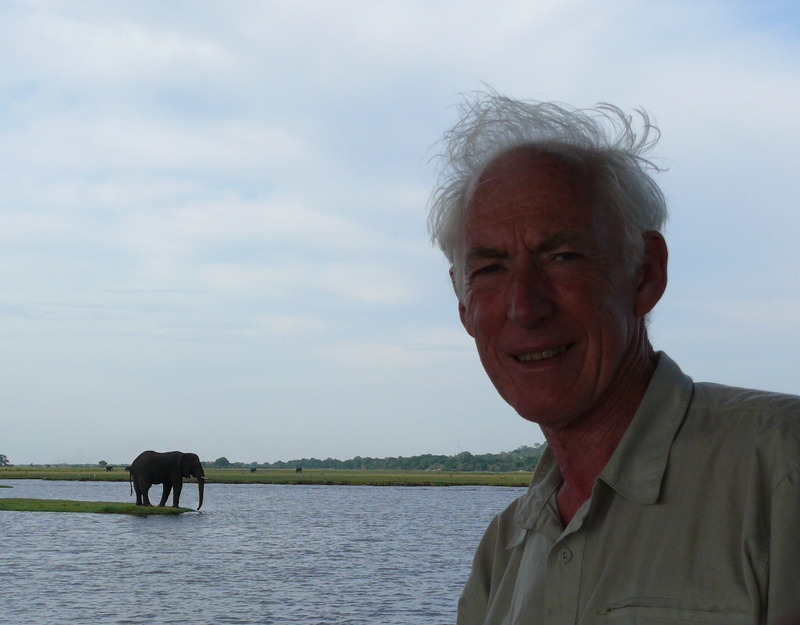 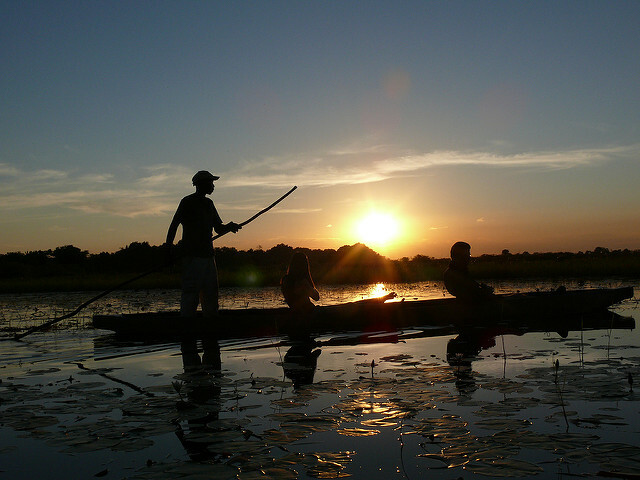 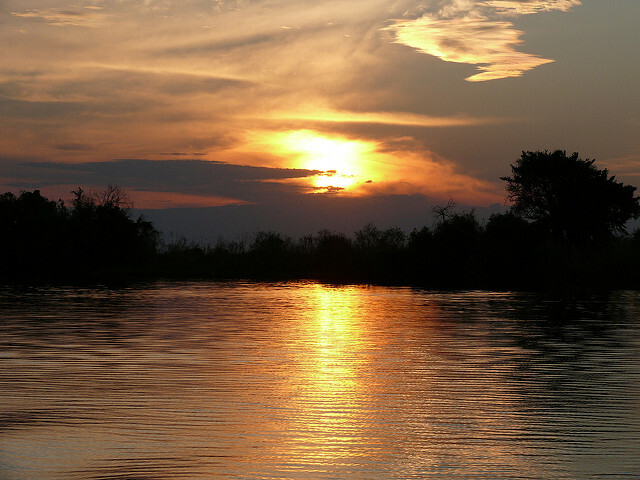 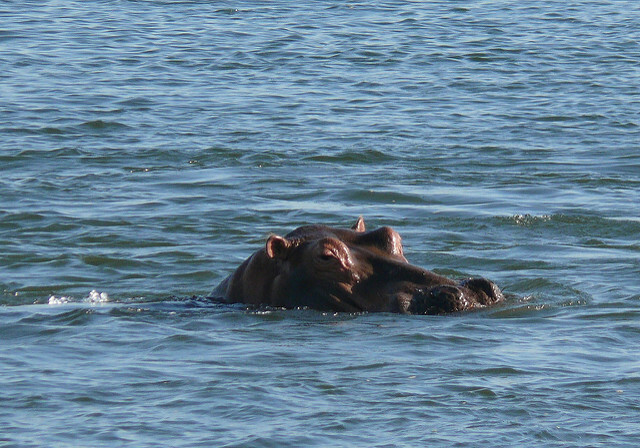 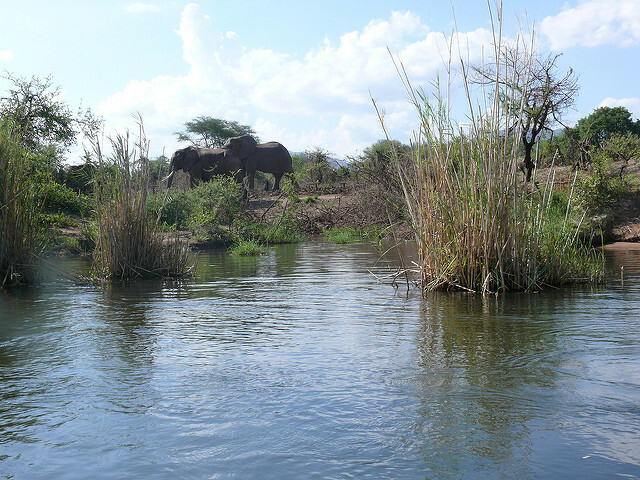 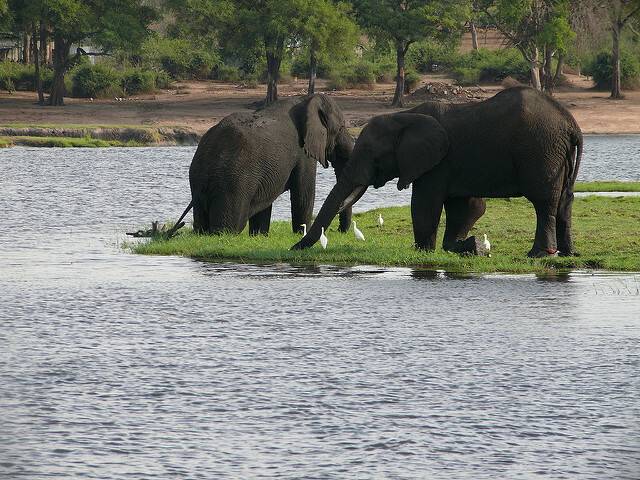 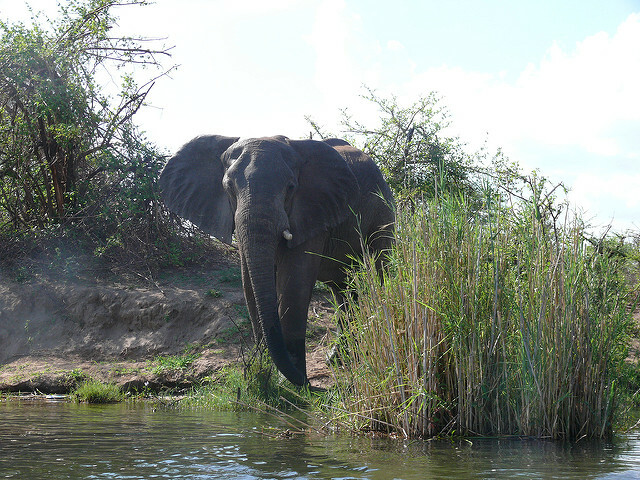 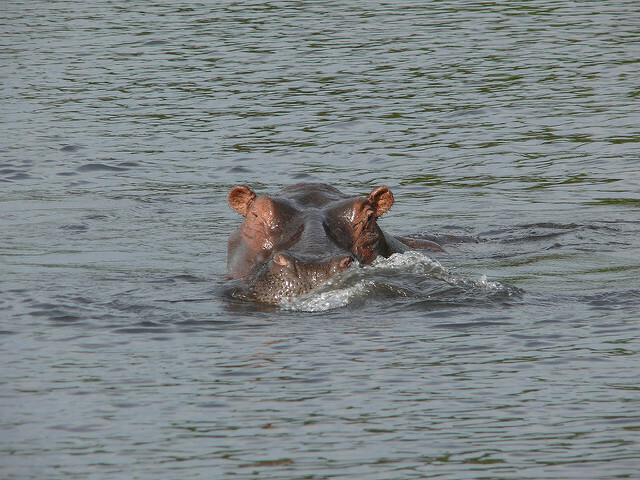 Back in Botswana we had an interesting boat trip on the river alongside the Chobe National Park to view elephants, hippos and other wildlife before watching the sun set. 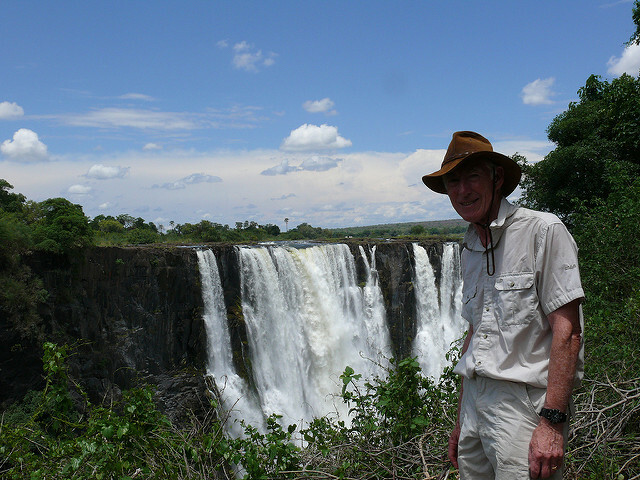 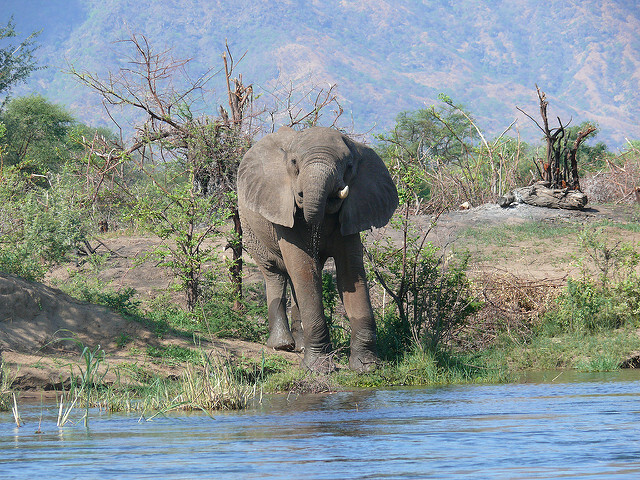 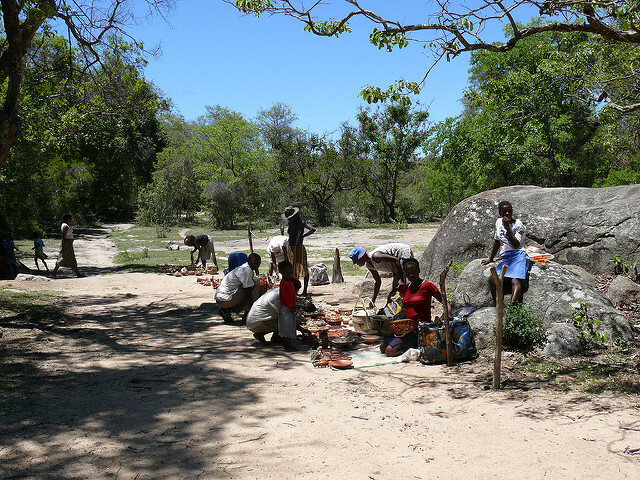 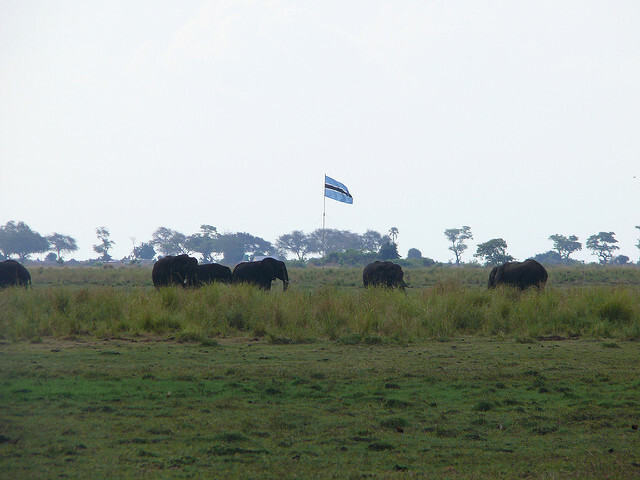 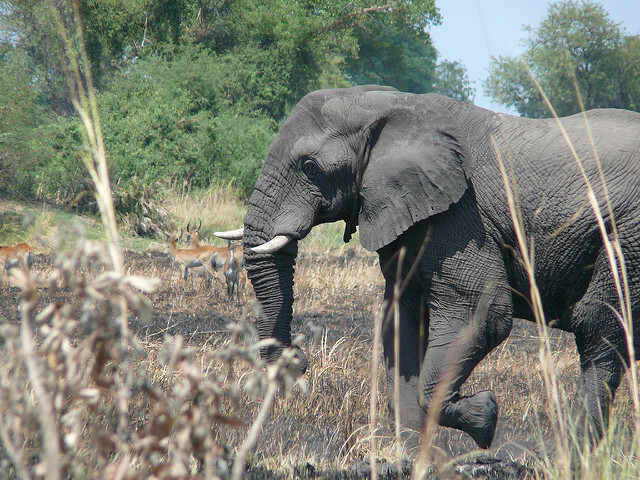 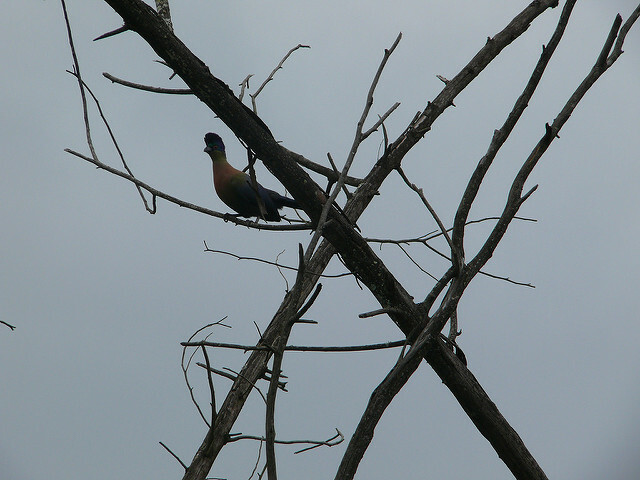 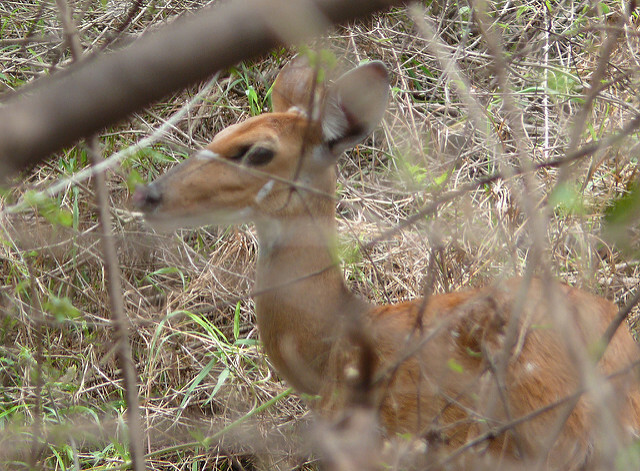 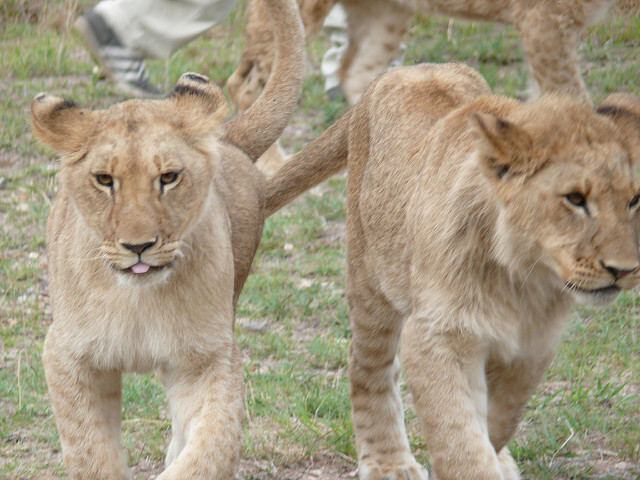 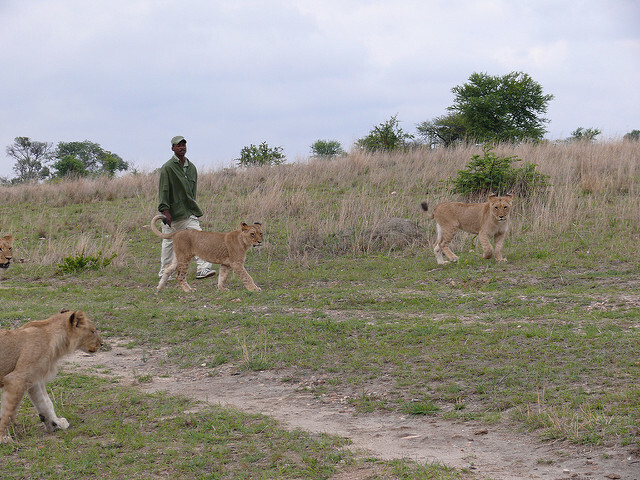 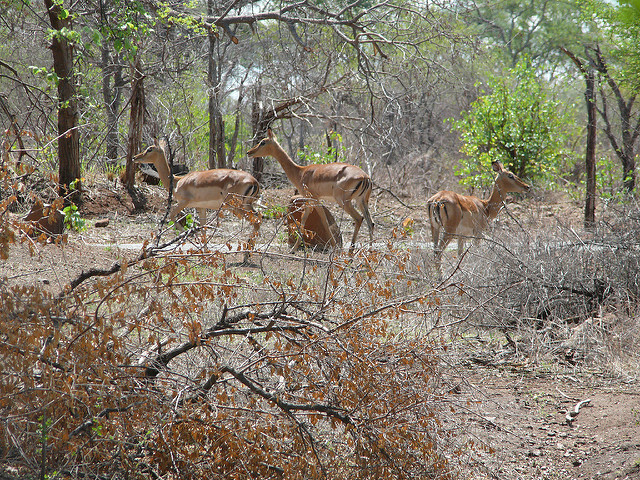 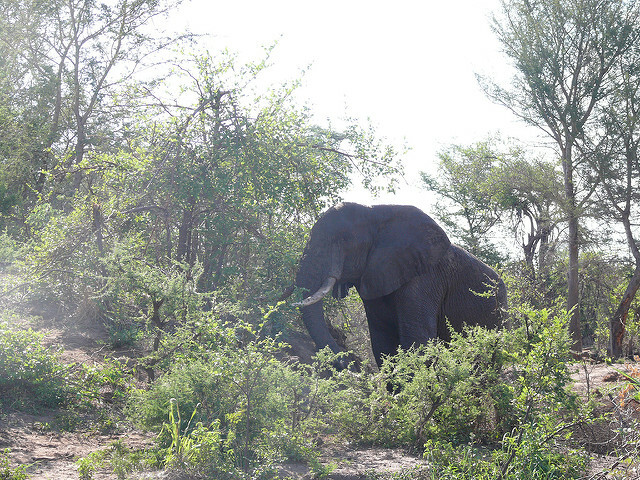 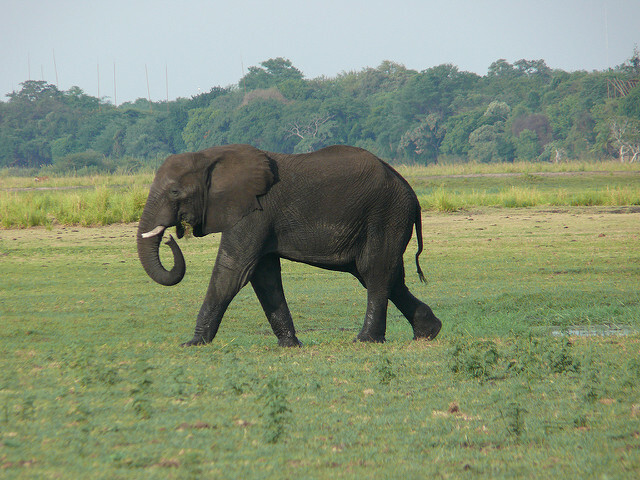 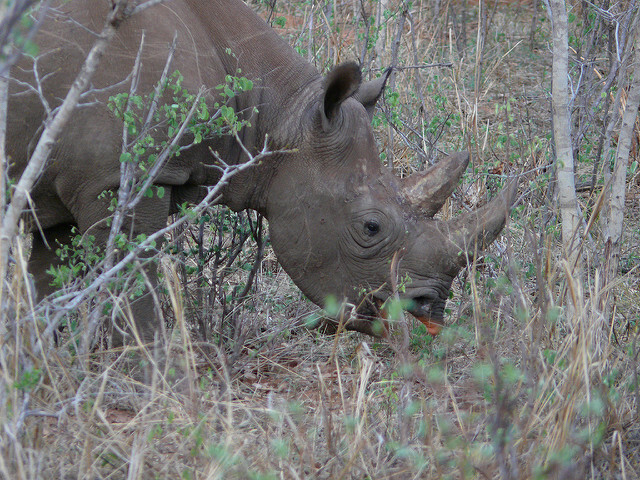 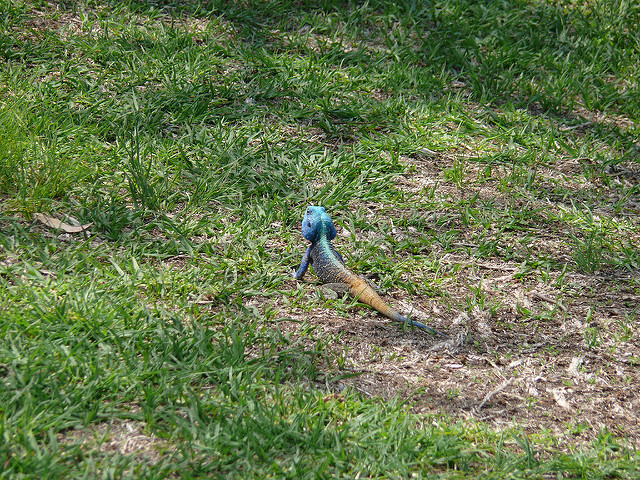 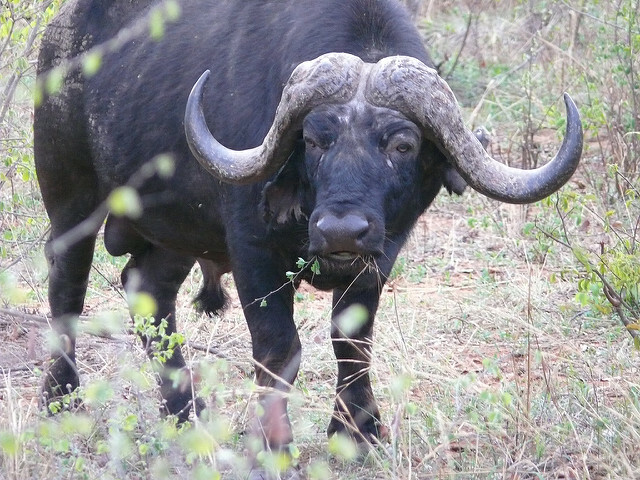 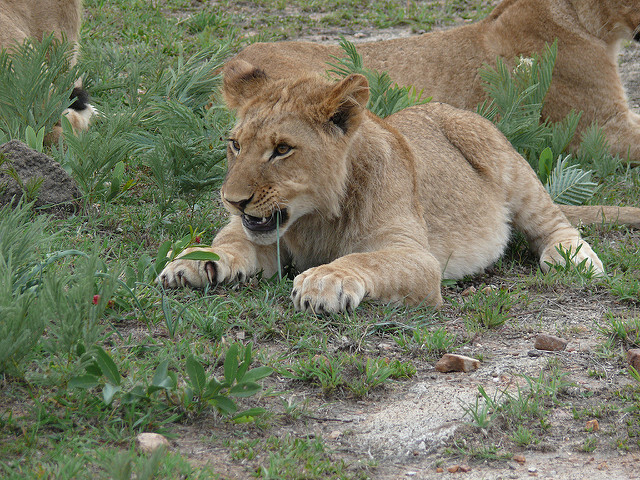 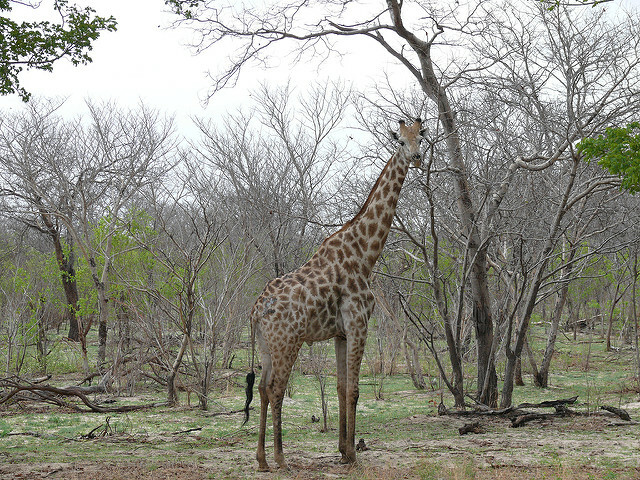 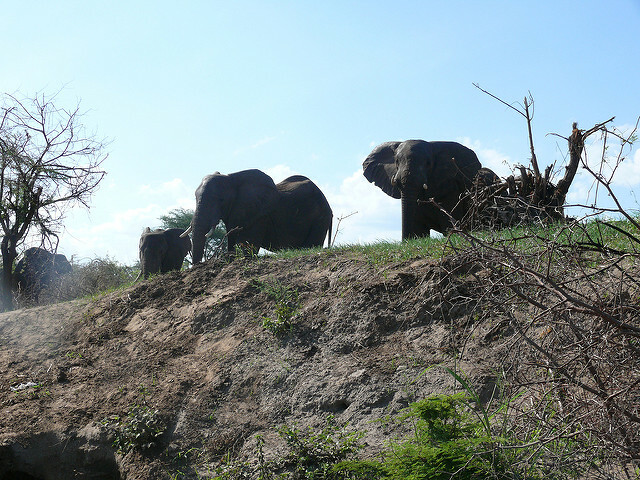 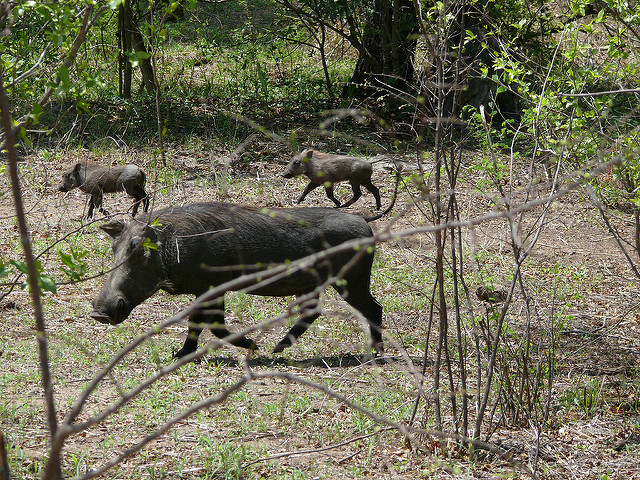 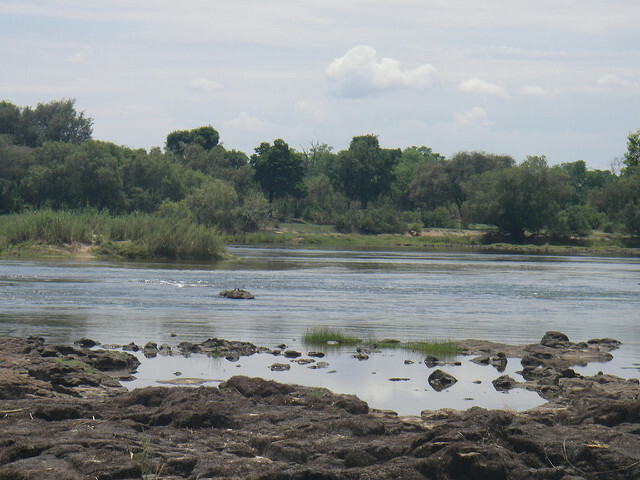 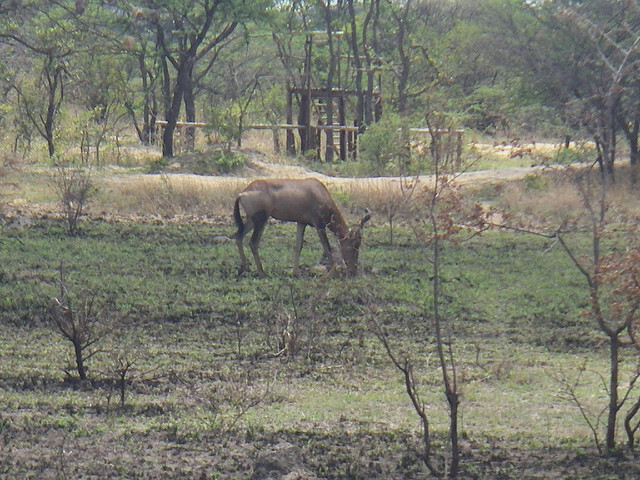 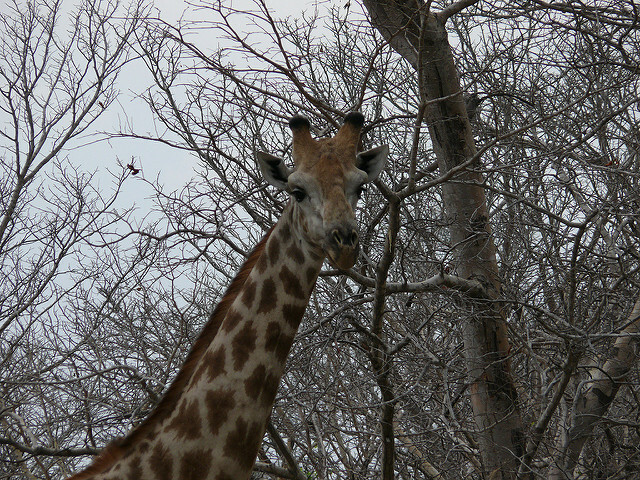 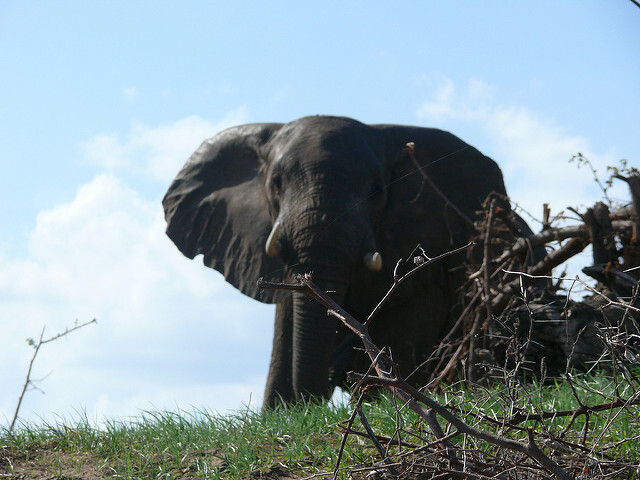 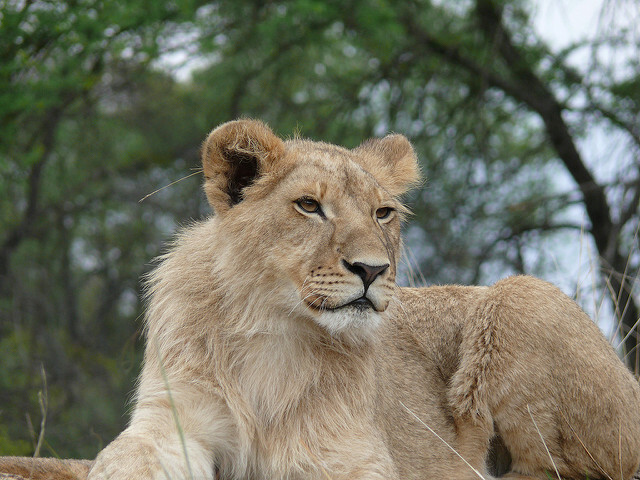 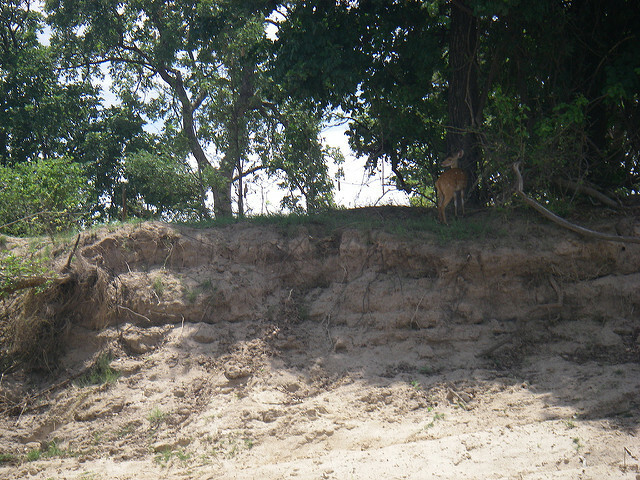 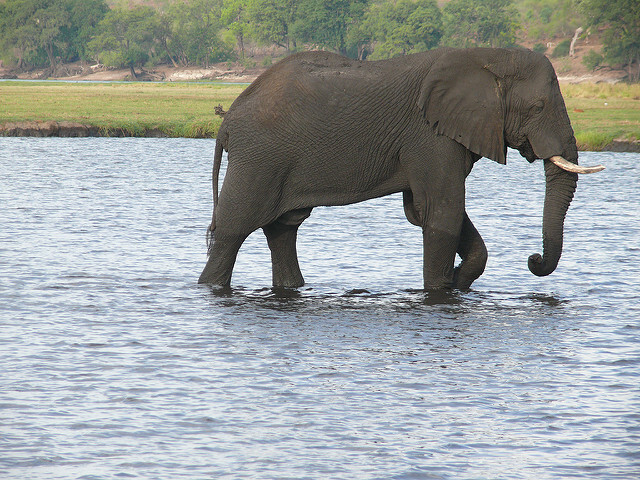 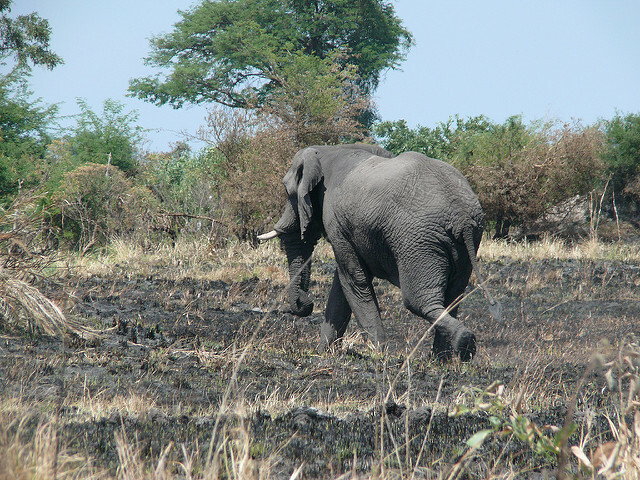 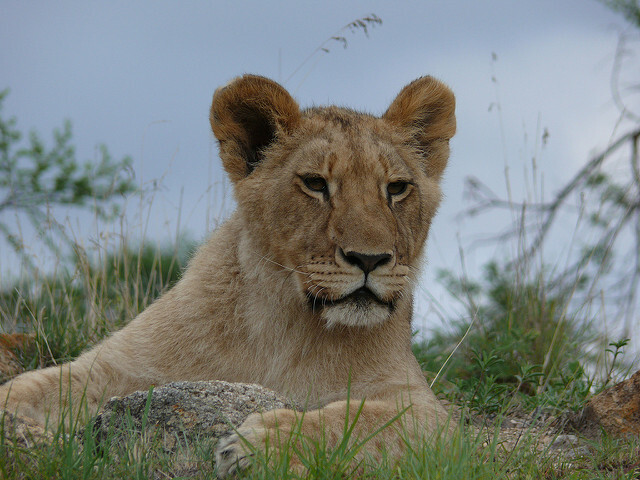 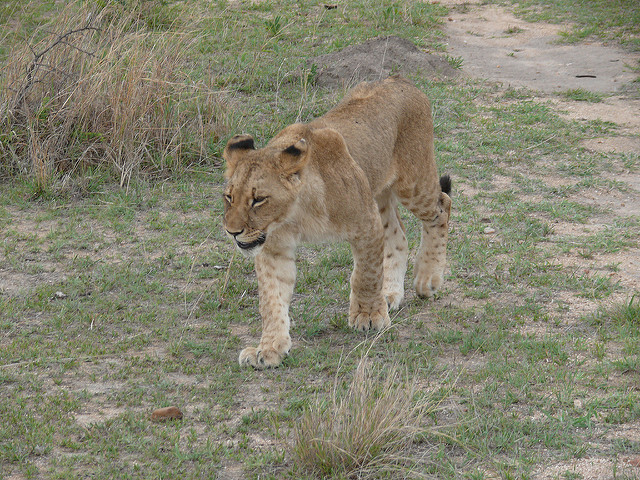 Back in Zimbabwe we visited Hwange National Park again to see wildlife before moving on to Victoria Falls. 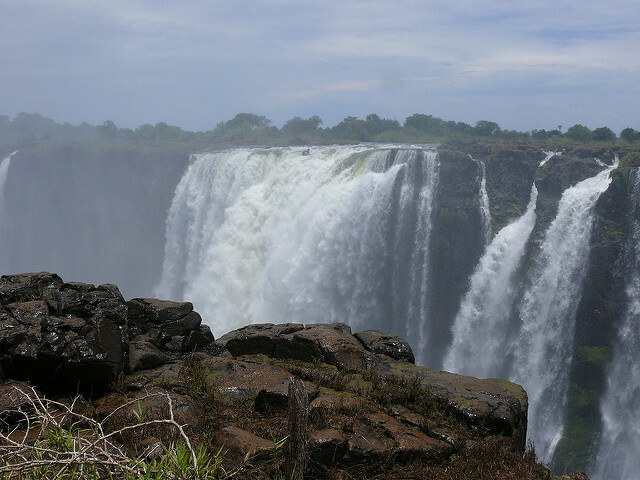 In Victoria Falls I took a night game drive, a canoe trip on the Zambezi, The Falls N.P., an early morning game drive and the activities from the gorge bridge. 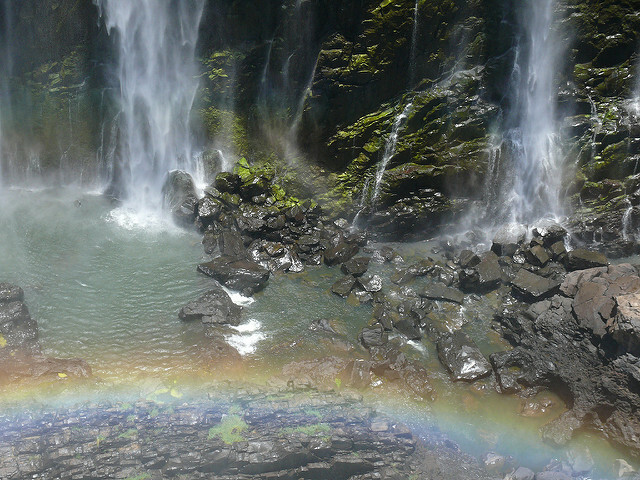 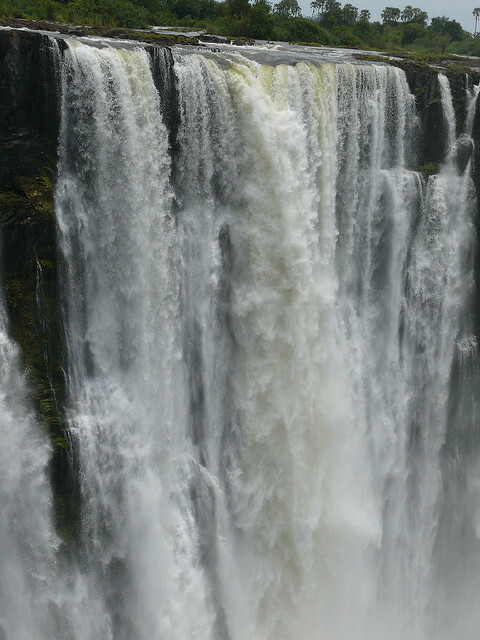 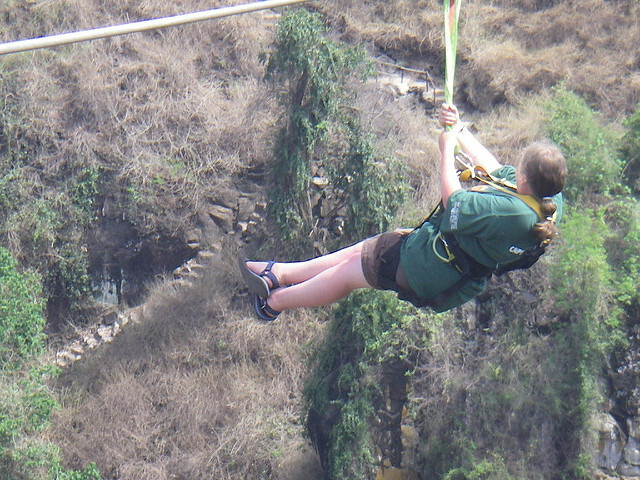 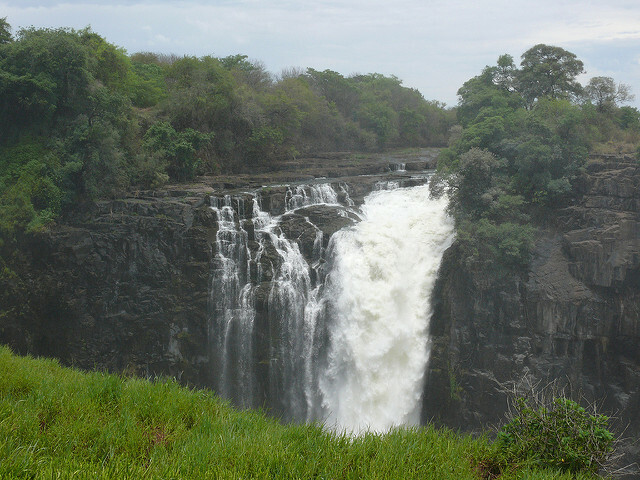 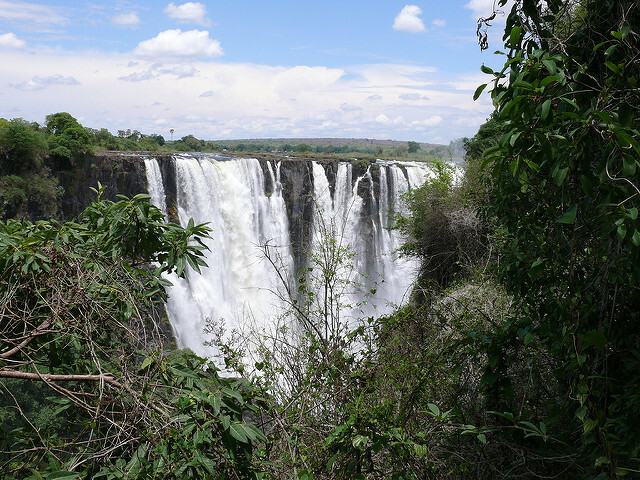 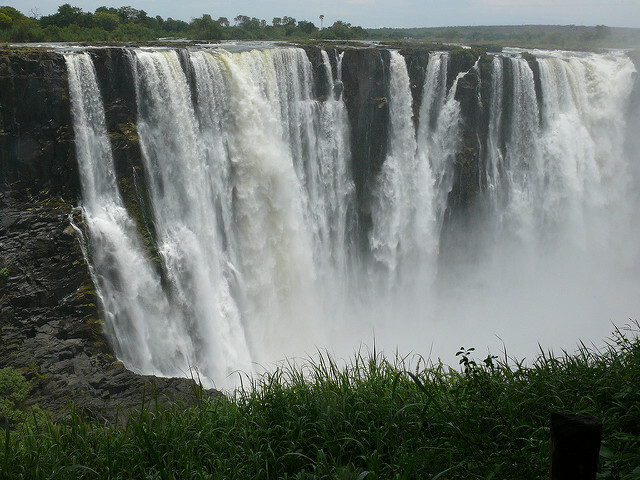 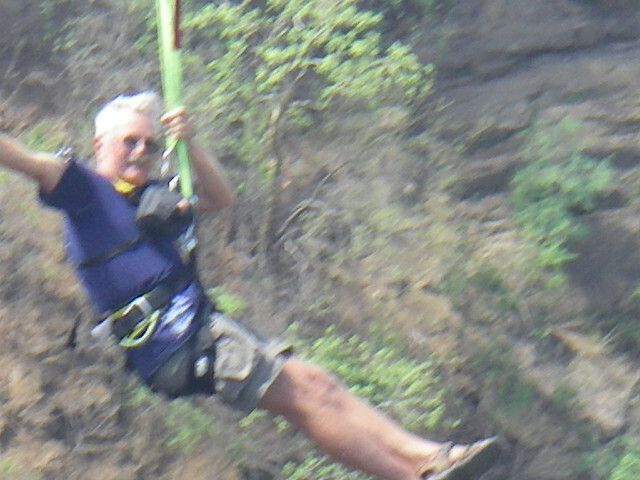 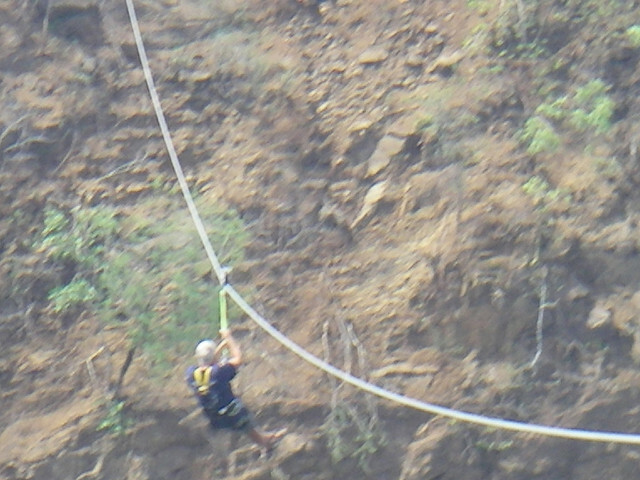 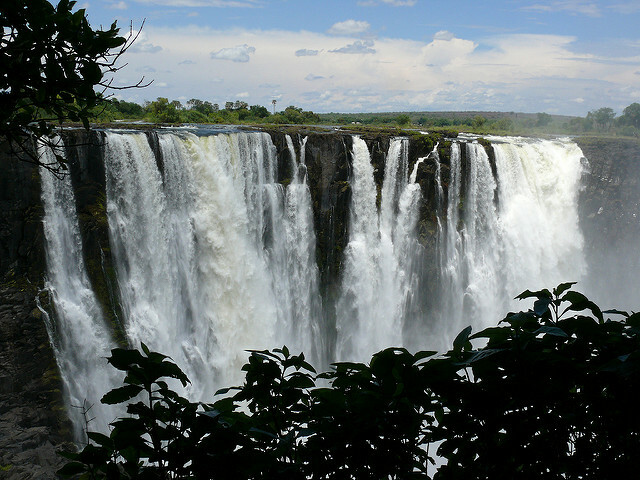 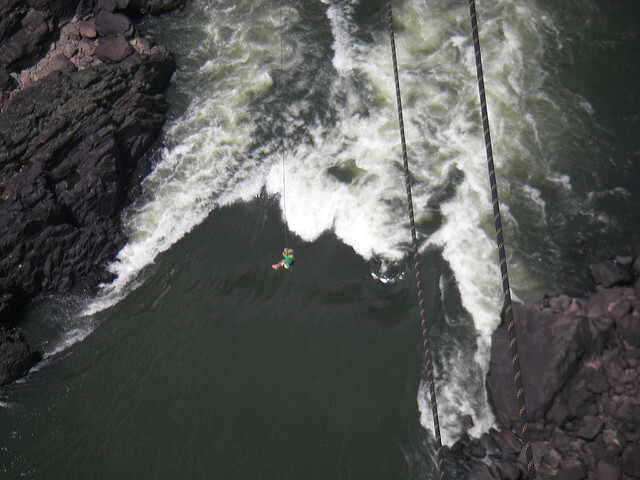 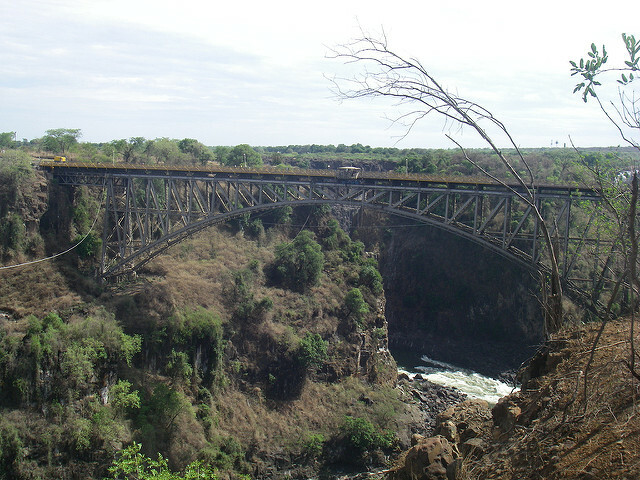 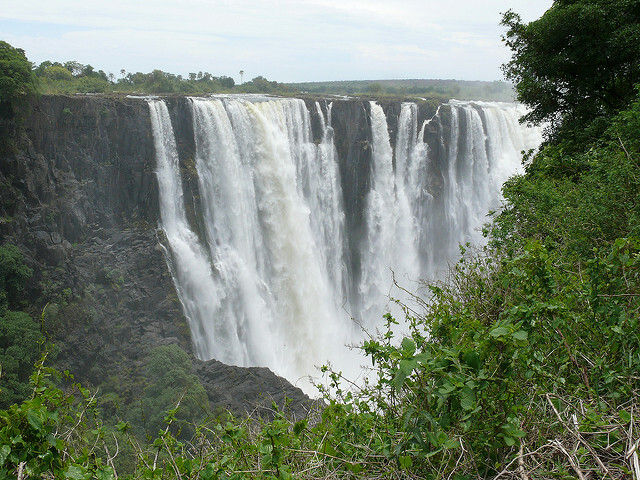 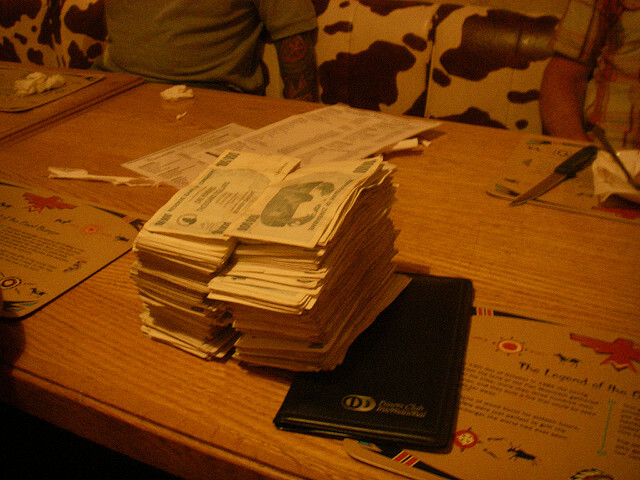 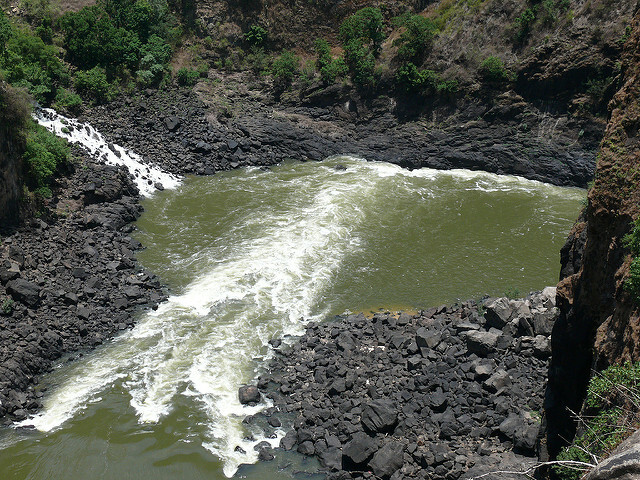 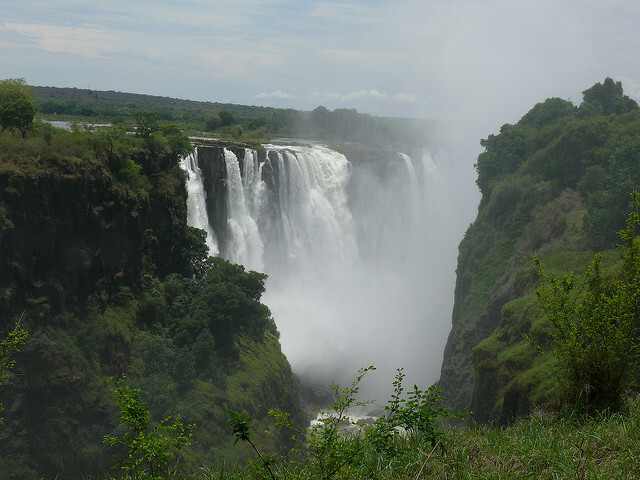 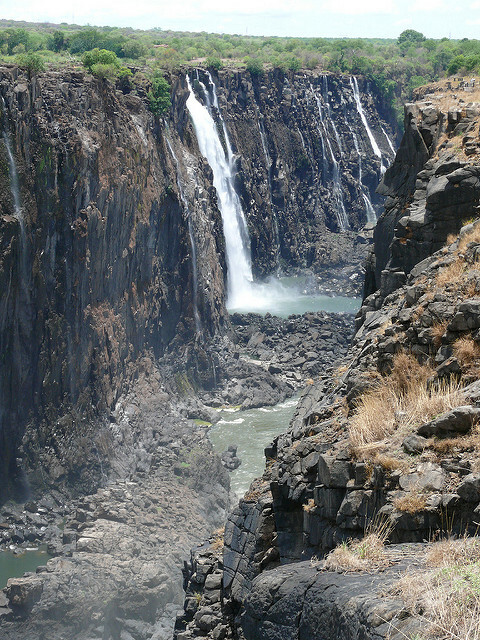 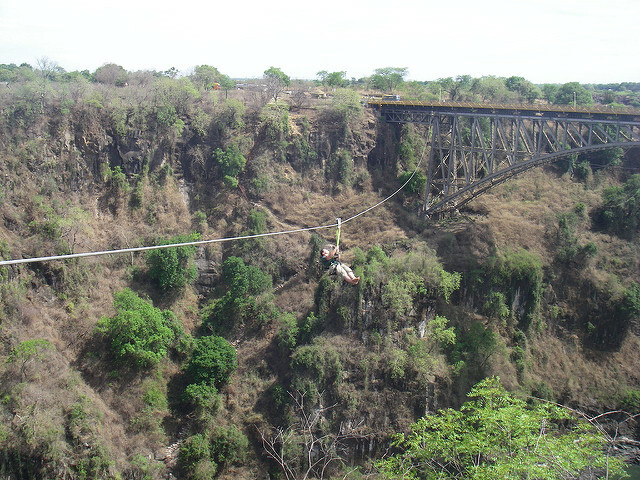 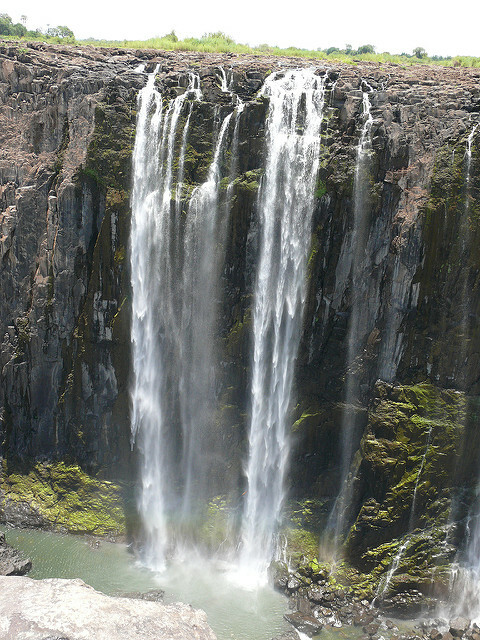 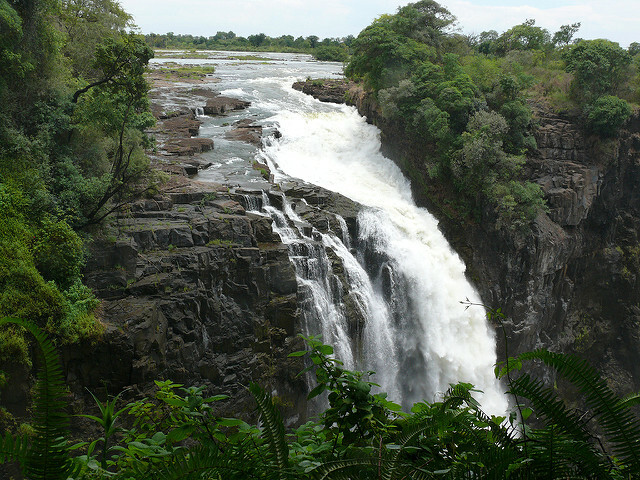 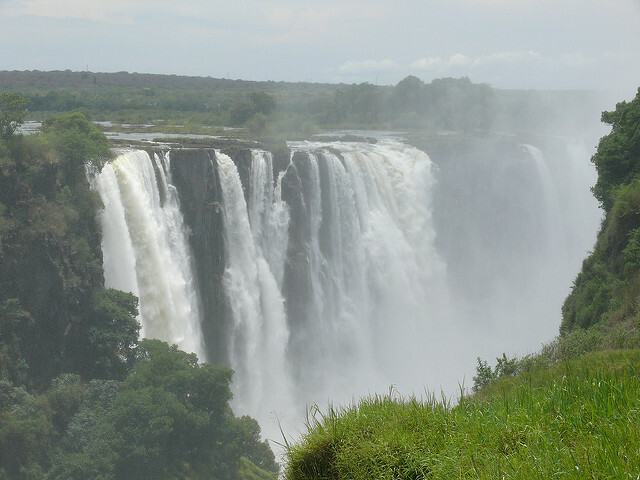 The distance traveled up to Victoria Falls totaled 5802 Kilometers. 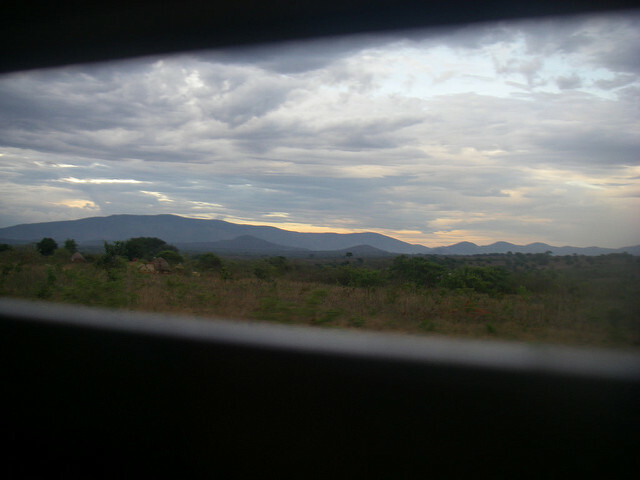 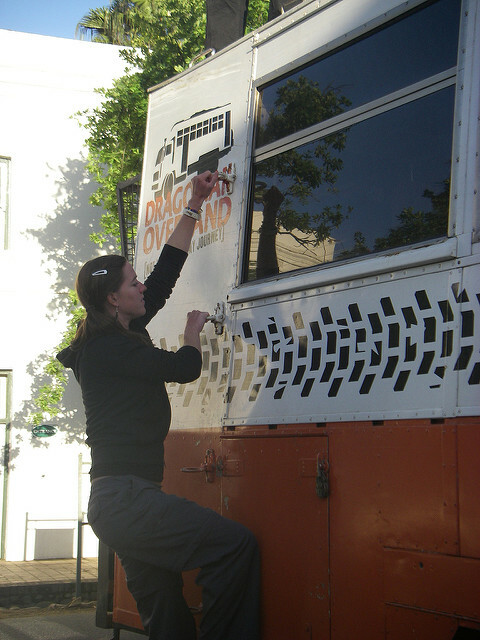 Our welcome to Livingstone was having the truck broken into before leaving for Choma.